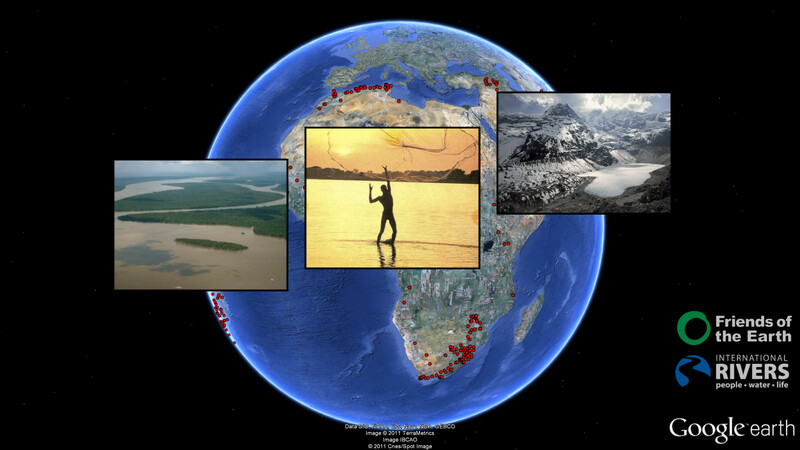 This page is a collection of my experiments with Google Earth as a tool for highlighting and visualizing environmental issues. 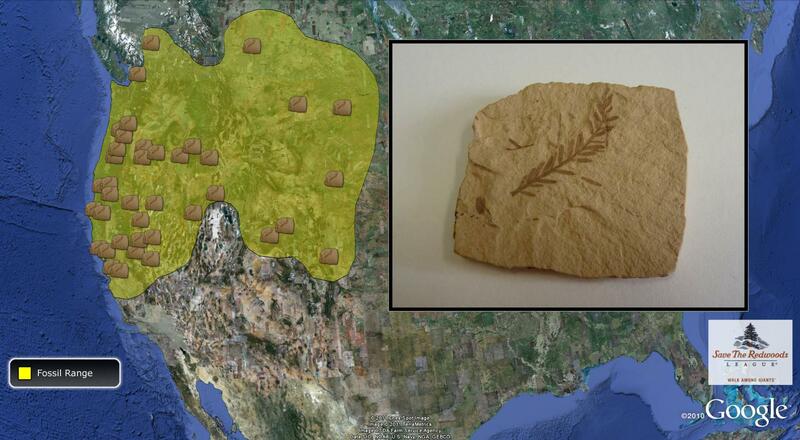 A map site built to accompany the paper An Ecoregion-Based Approach to Protecting Half the Terrestrial Realm. 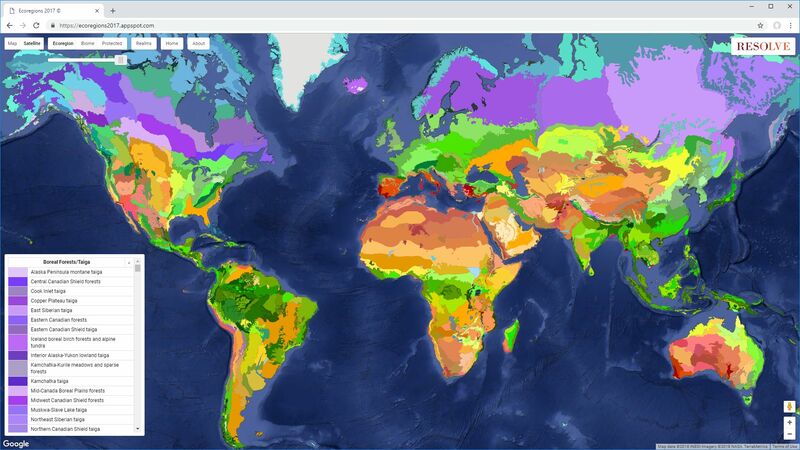 The site lets you explore the 846 global ecoregions, 14 terrestrial biomes, or protection status of ecoregions around the world. 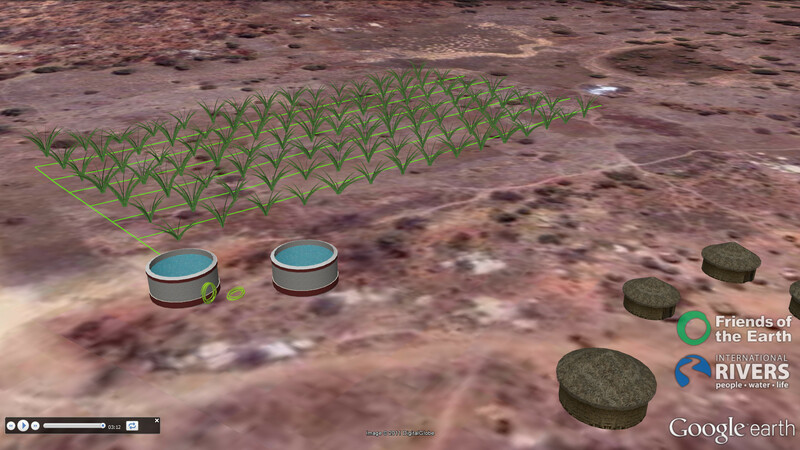 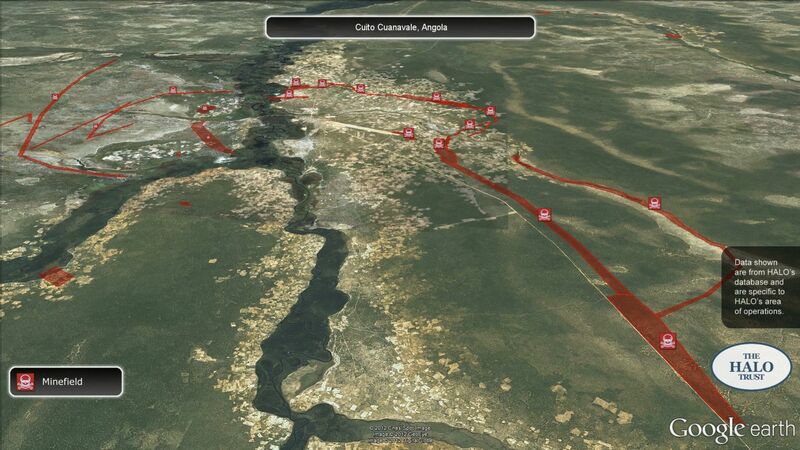 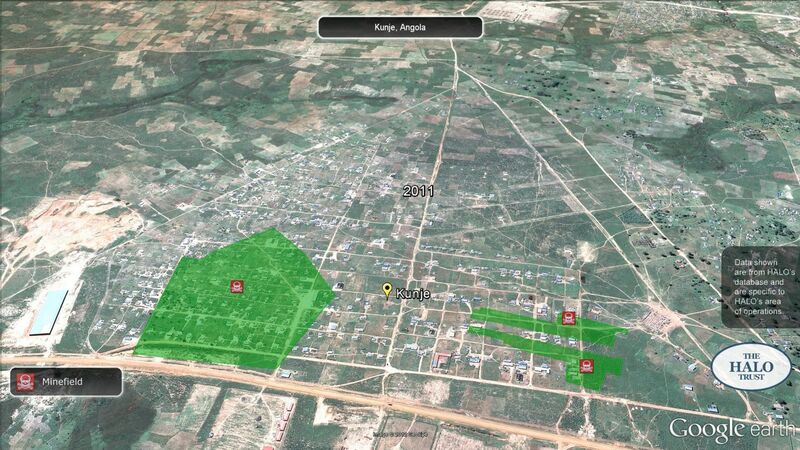 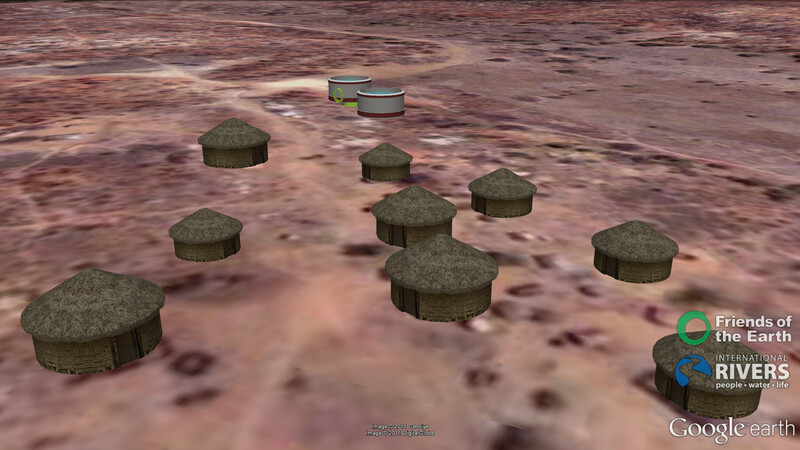 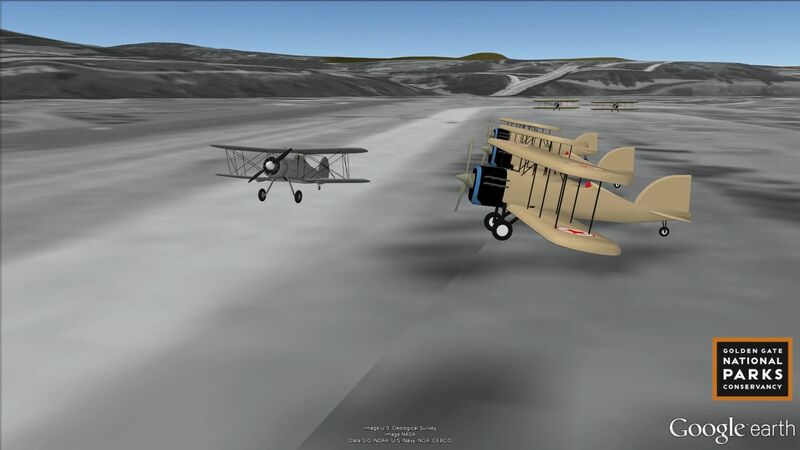 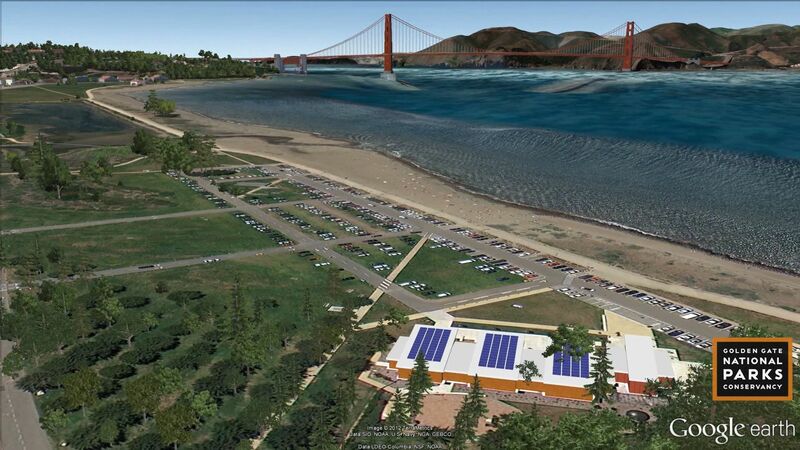 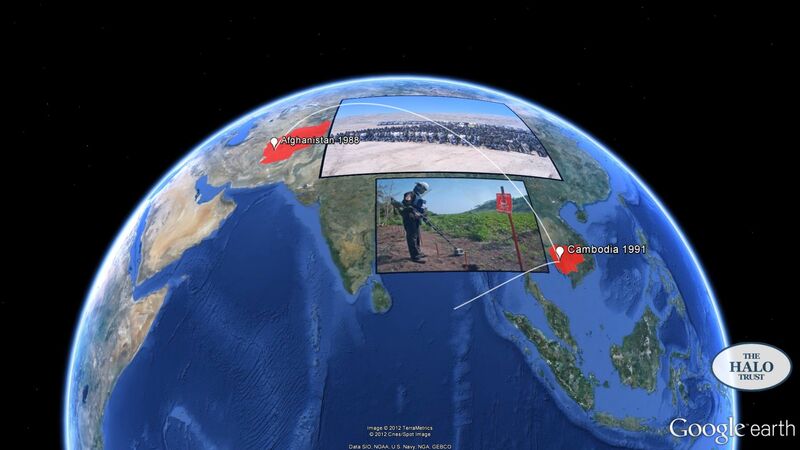 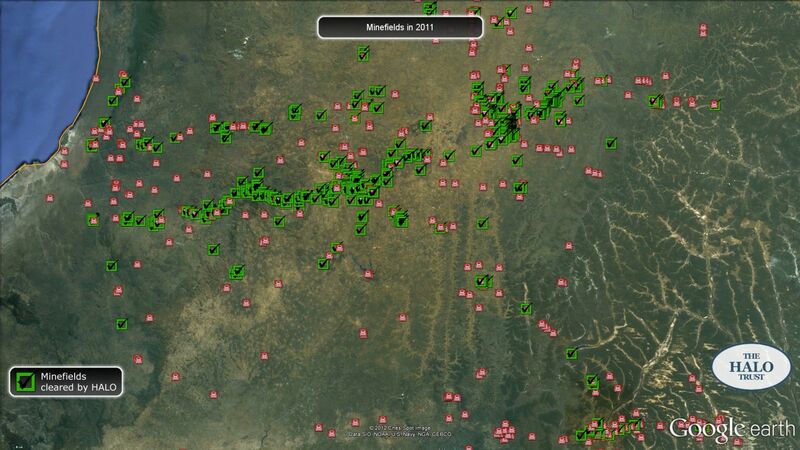 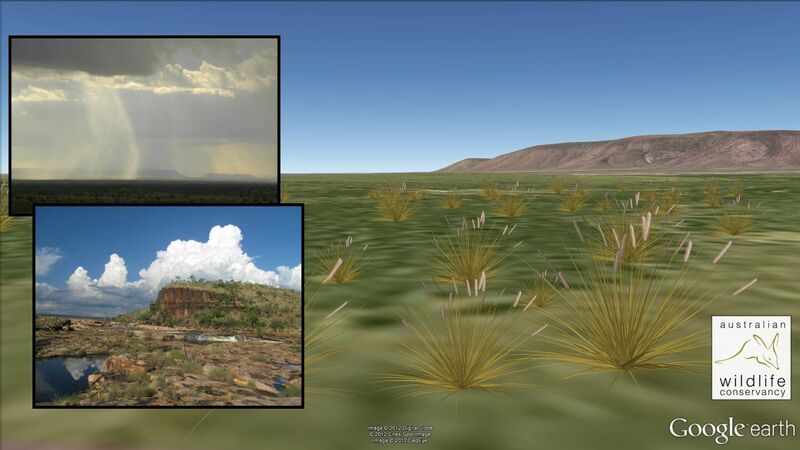 The map tiles were rendered with GeoServer in the first iteration of the site, later on with Google Earth Engine. 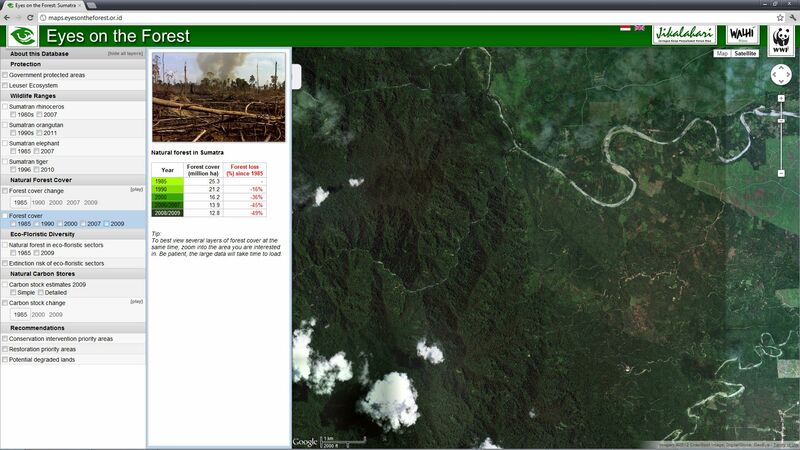 Interactivity for click and mouseover/hover functionality is built using UTFGrid. 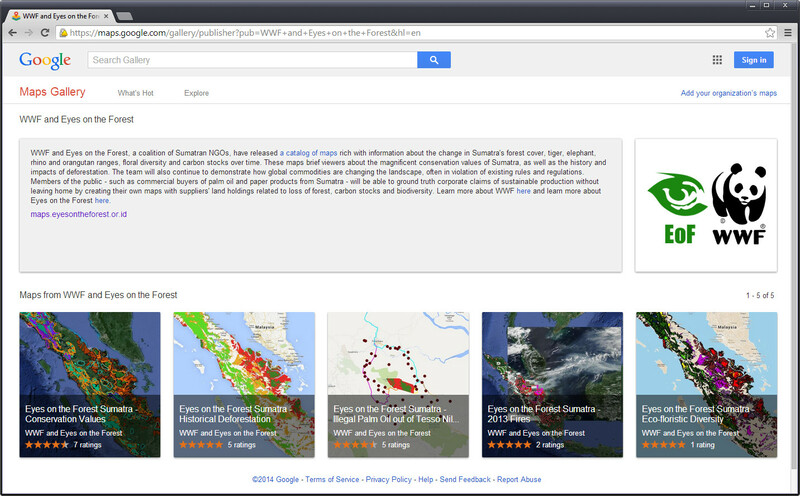 The site is hosted on Google App Engine, with PNG/JSON tiles on Google Cloud Storage. 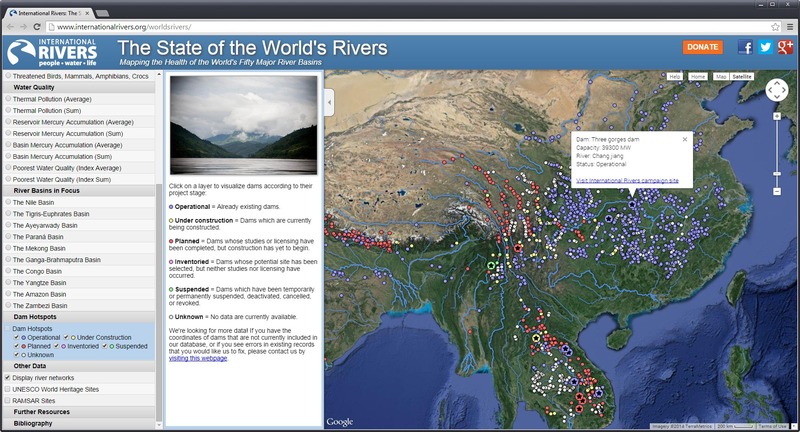 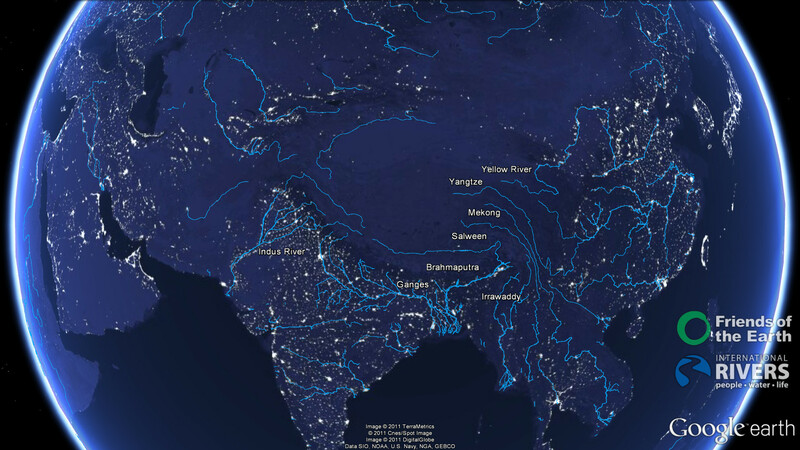 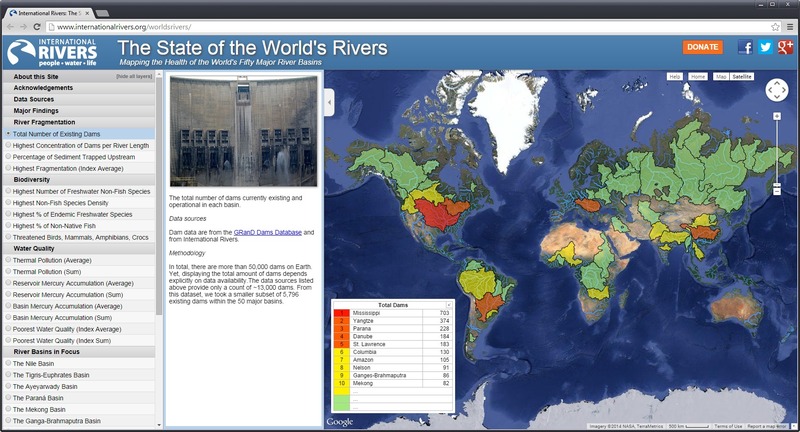 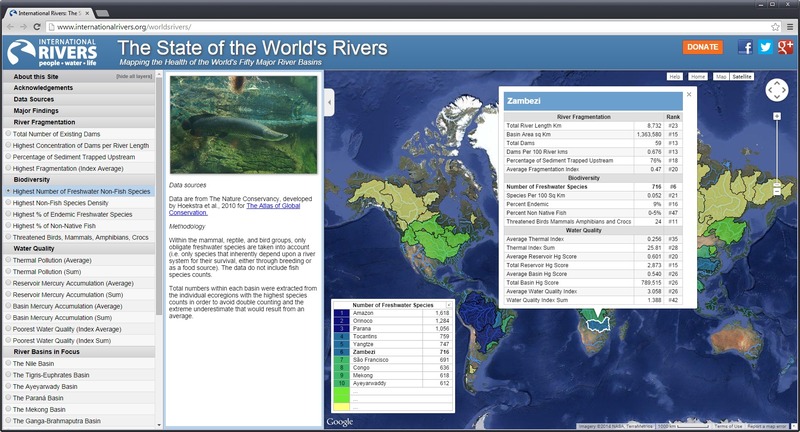 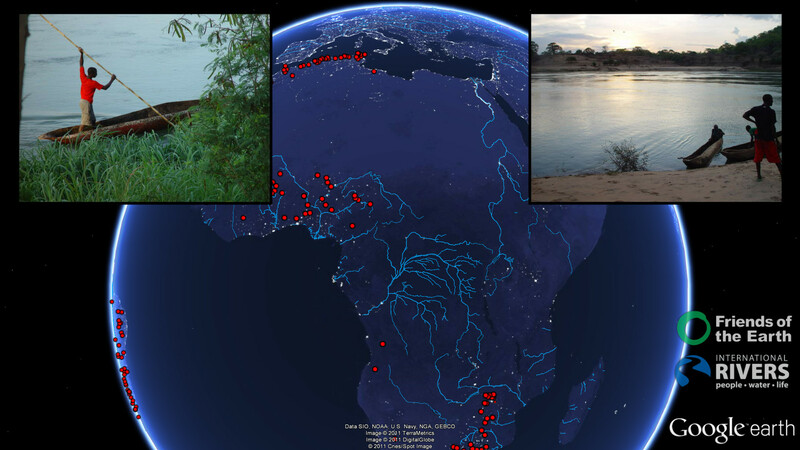 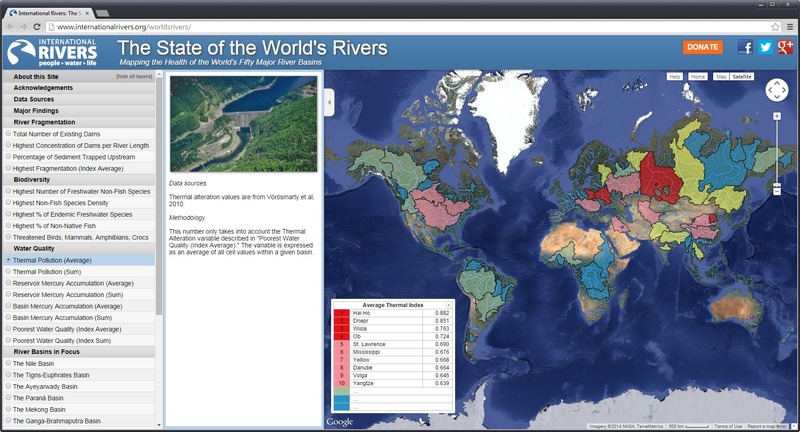 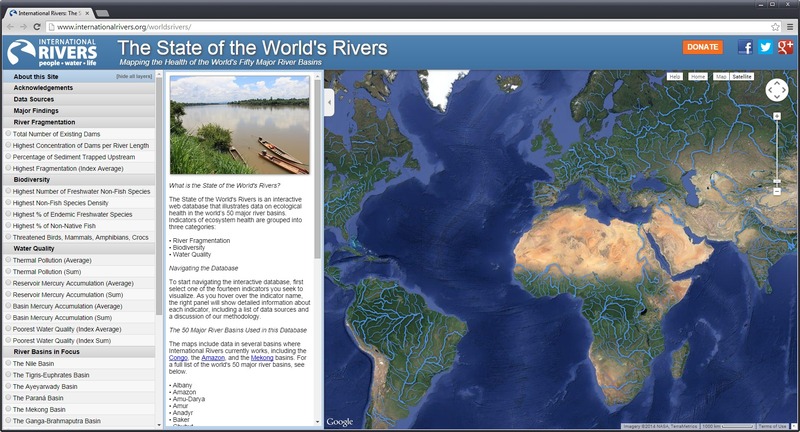 This mapping website created for International Rivers takes stock of the world 50 largest river basins, comparing pollution and water quality, biodiversity, and the impact of dams and river fragmentation. 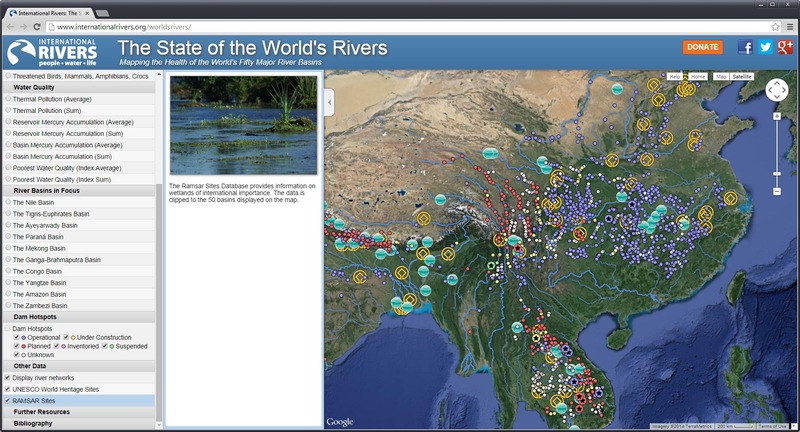 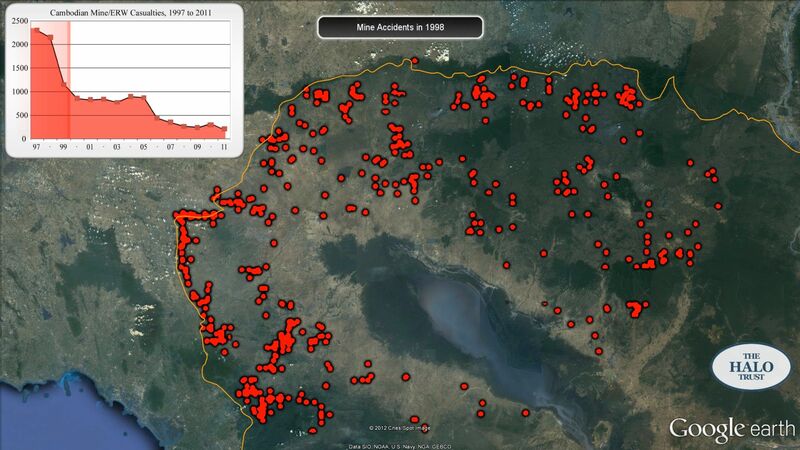 The site includes a database of over 5,600 dams; planned, existing, and under construction, within the 50 basins. 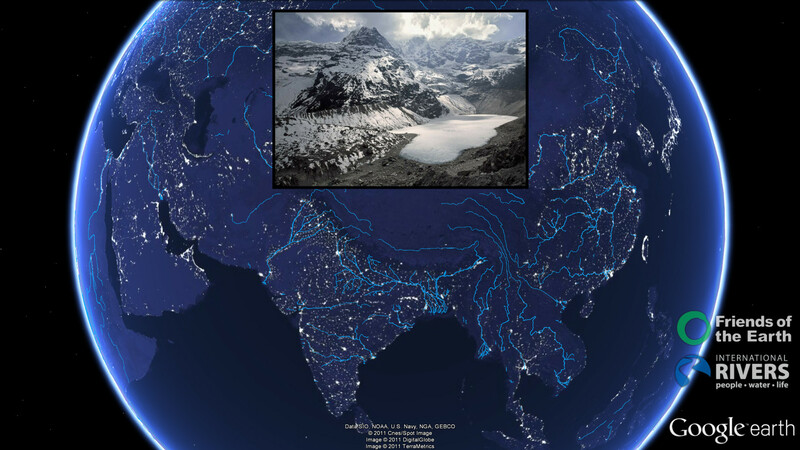 The dam database and basin data are served via GeoJSON (support added to the Maps API by Google this year), which allows for interactivity between the site and objects on the map, updating legends and styles when hovering over different basins etc. 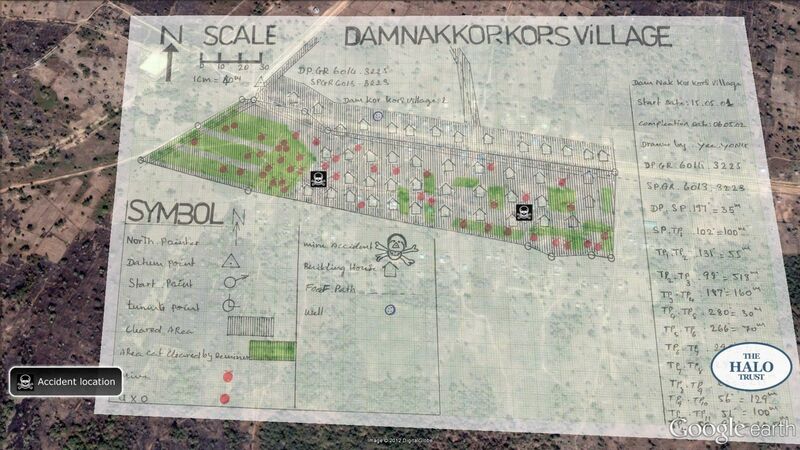 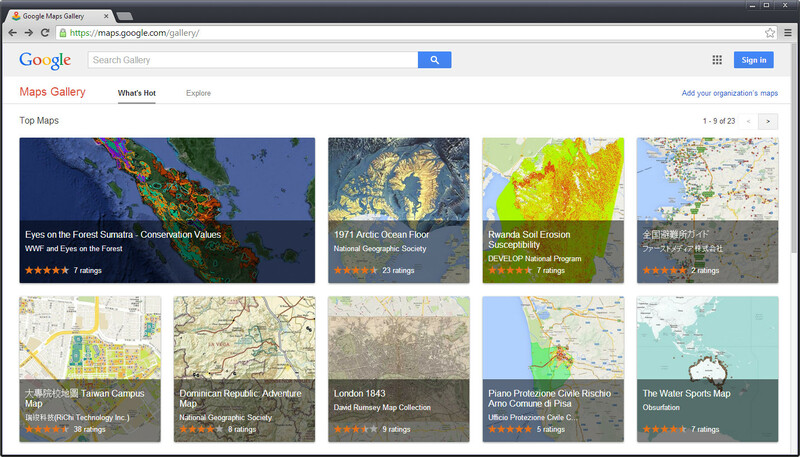 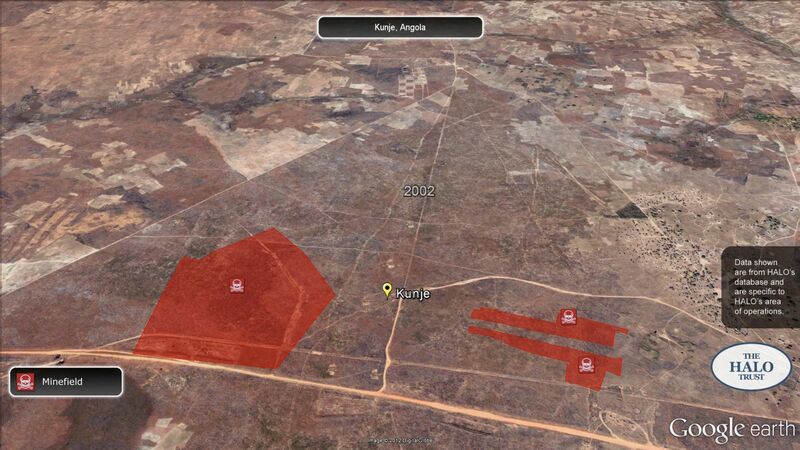 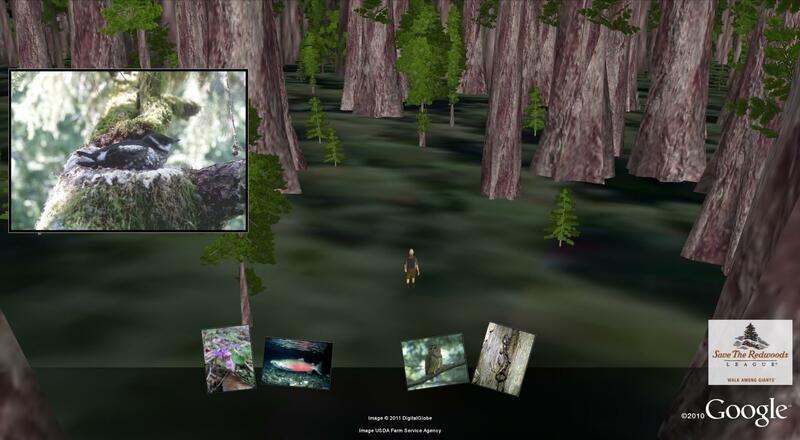 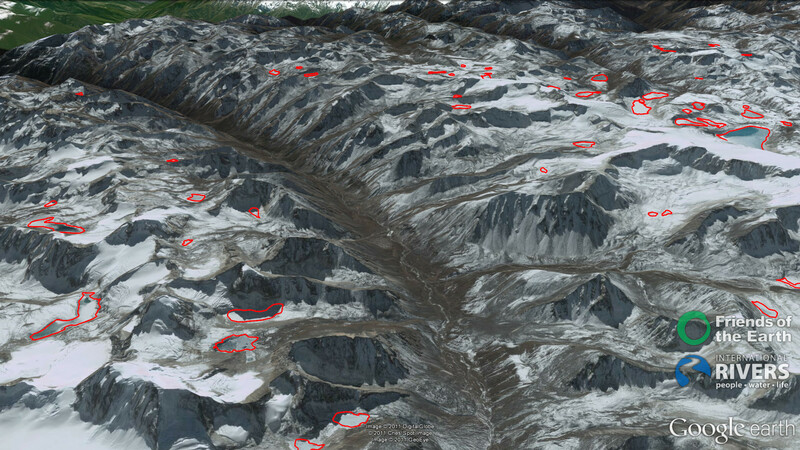 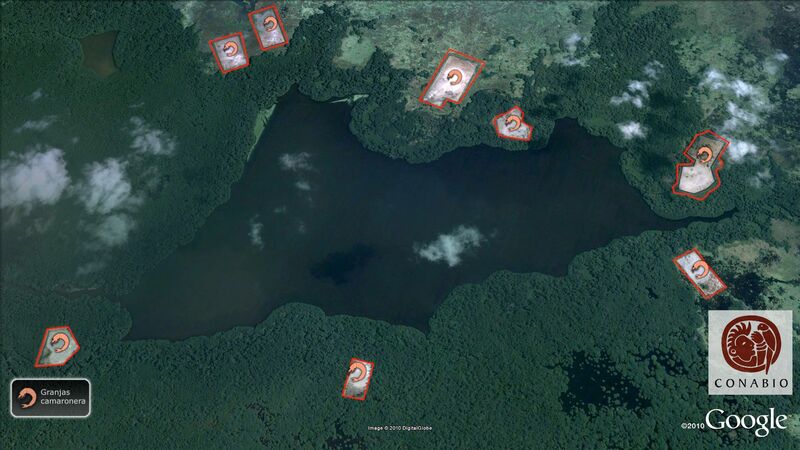 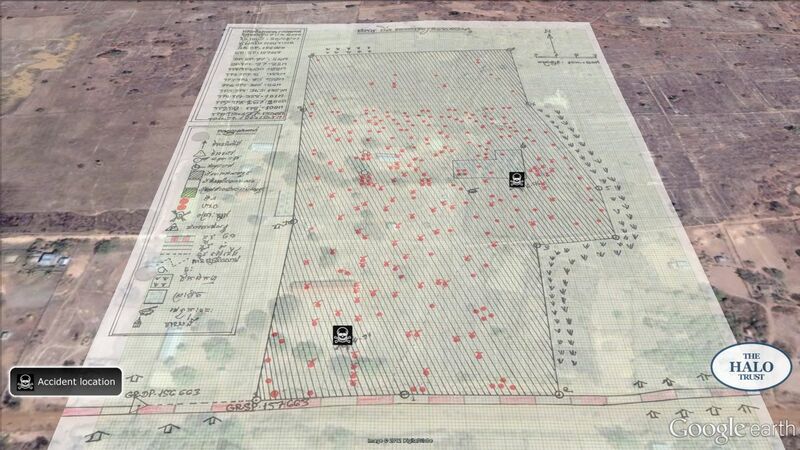 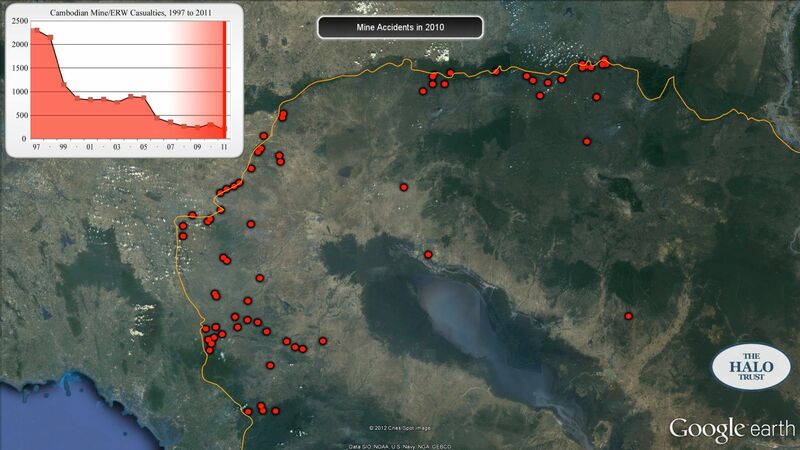 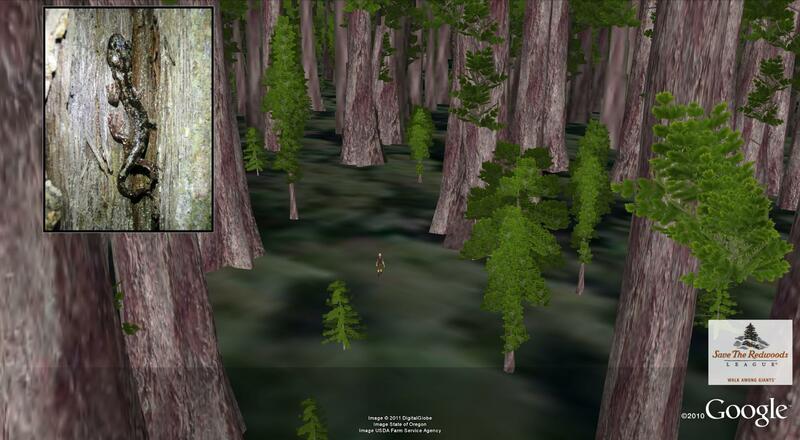 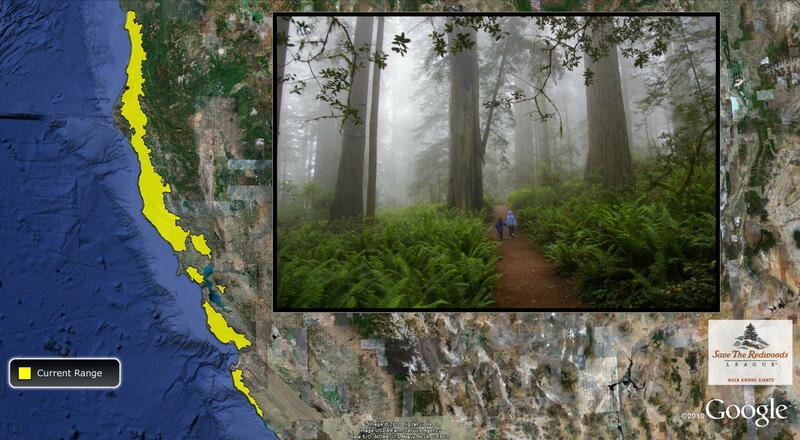 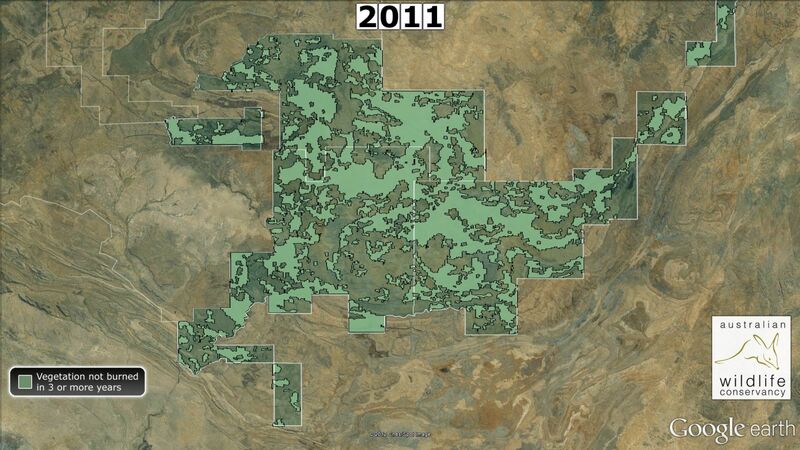 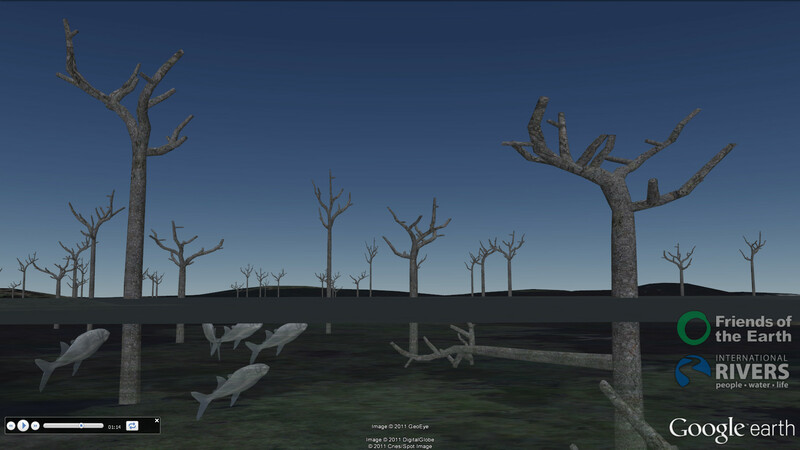 Five maps created in Google Maps Engine to show data from the Eyes on the Forest site. 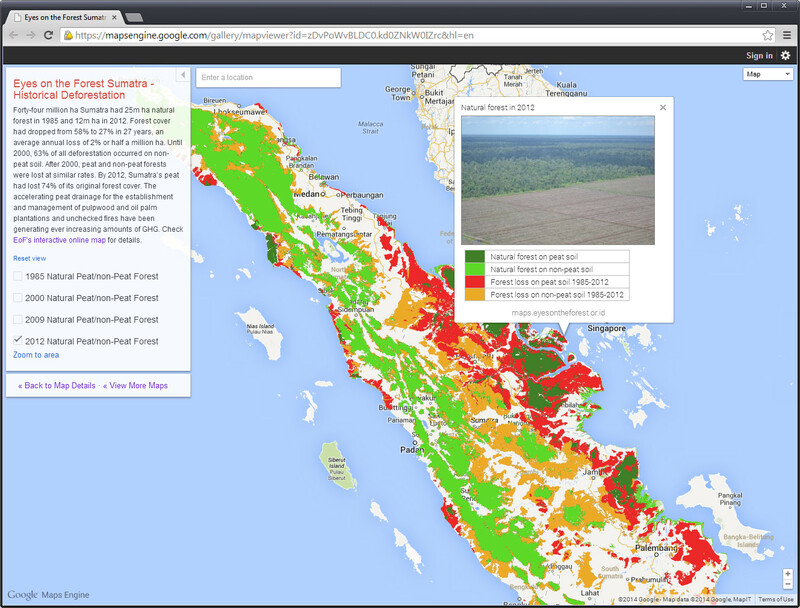 New and updated data include Sumatra-wide historical deforestation up to 2012, case studies for the 2013 fire season which covered much of Singapore, Kuala Lumpur and large stretches of Sumatra in haze, maps showing rampant deforestation for palm oil inside the Tesso Nilo National Park and poison attacks on the park's elephants, as well as updated conservation value and eco-floristic sector data for all of Sumatra. 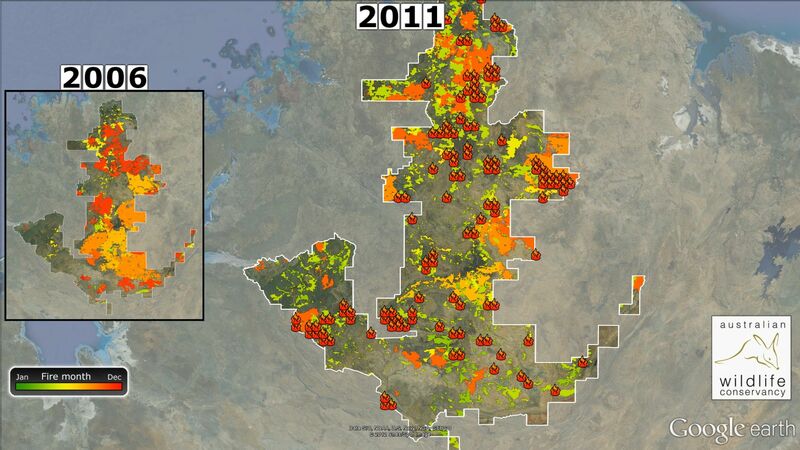 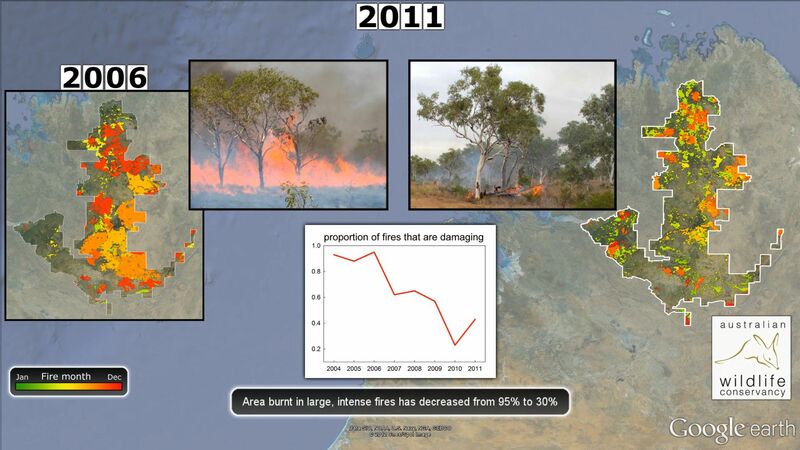 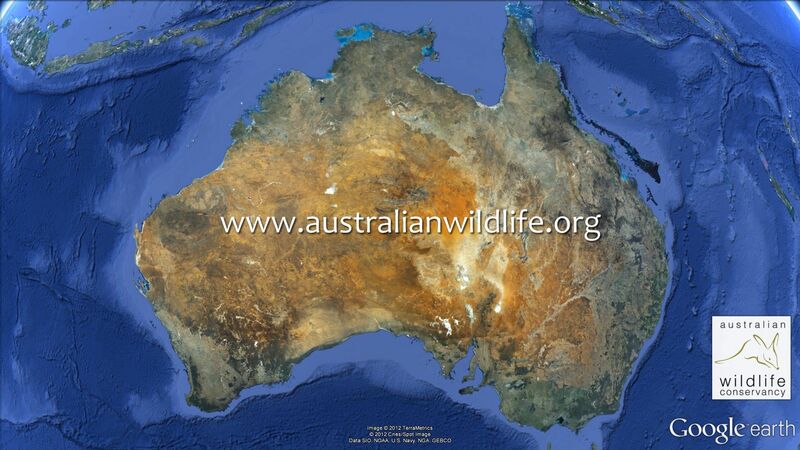 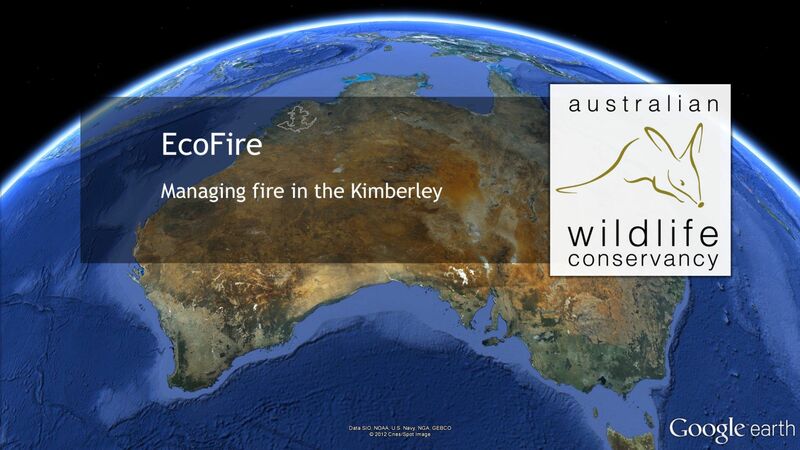 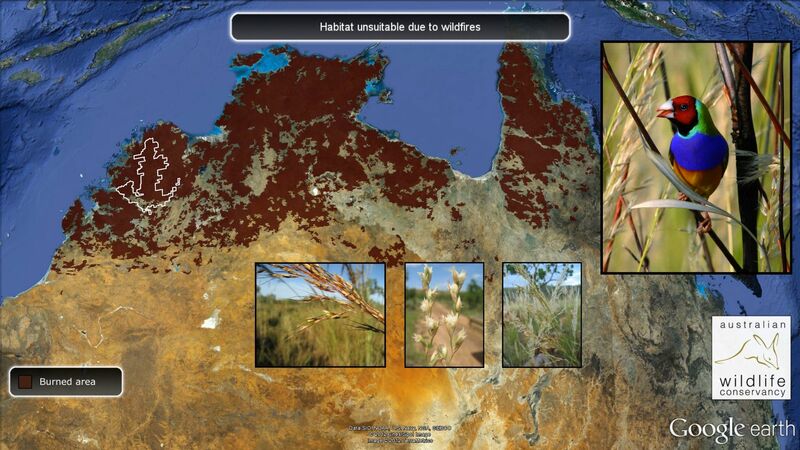 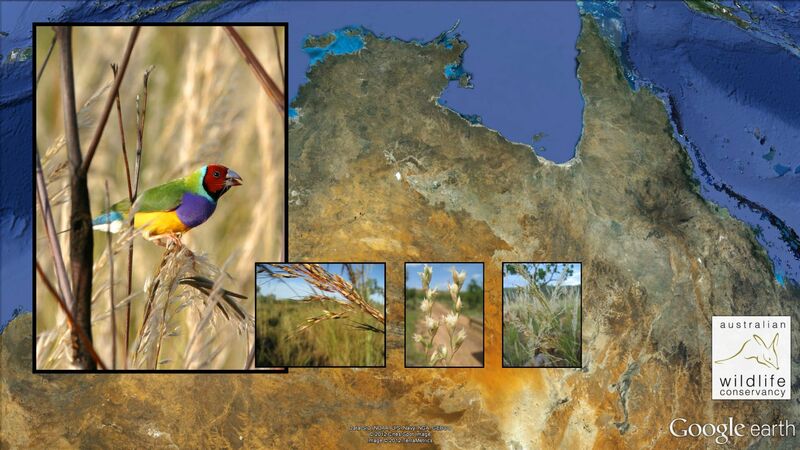 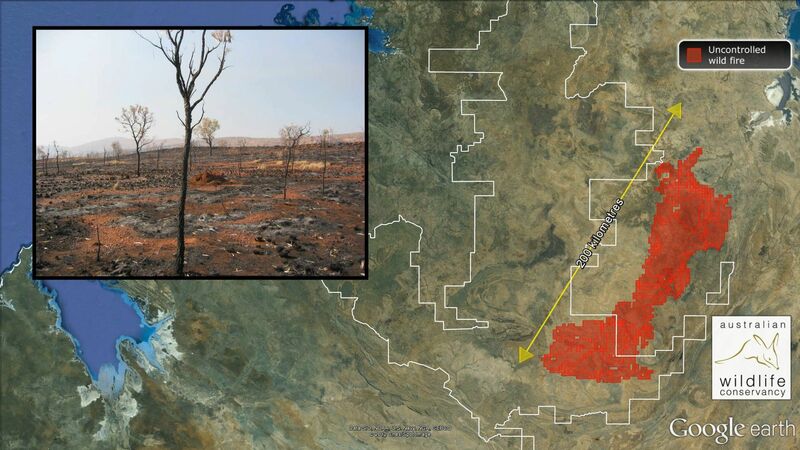 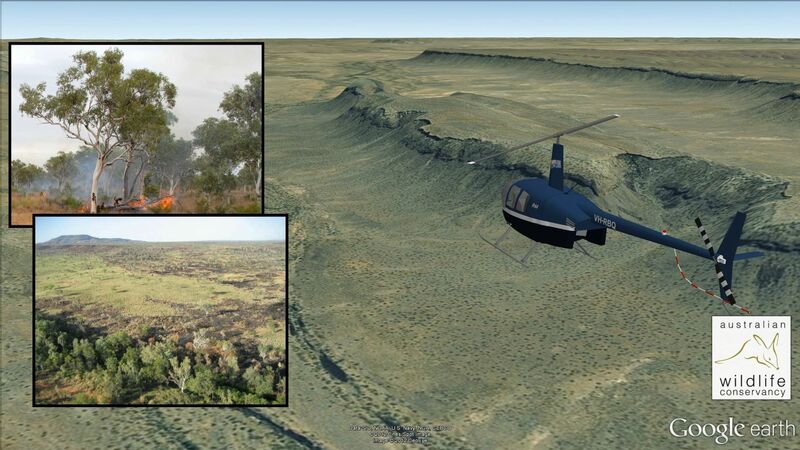 This tour was created for the Australian Wildlife Conservancy (AWC), to highlight the work the organization is doing in the northern Australia savanna ecosystem, where uncontrolled wildfire is posing a threat to a range of endangered species. 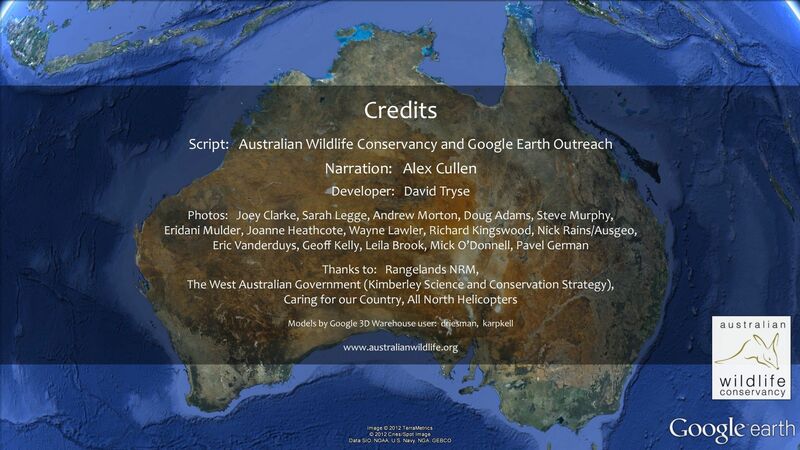 The tour is narrated by Alex Cullen. 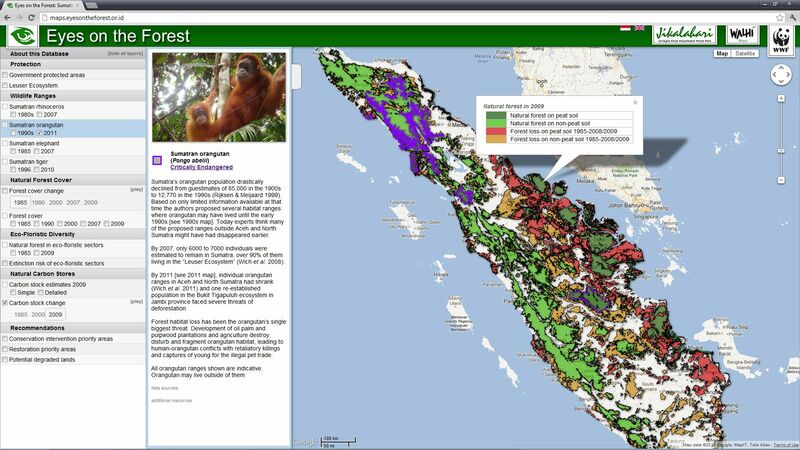 This website was created for WWF Indonesia and the Eyes on the Forest coalition of local NGO's, to highlight the devastating loss of forest occurring on the island of Sumatra. 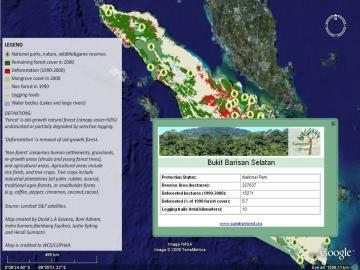 As much as half of Sumatra's forests have been cleared since 1985, to make way for pulp, paper and palm oil production. 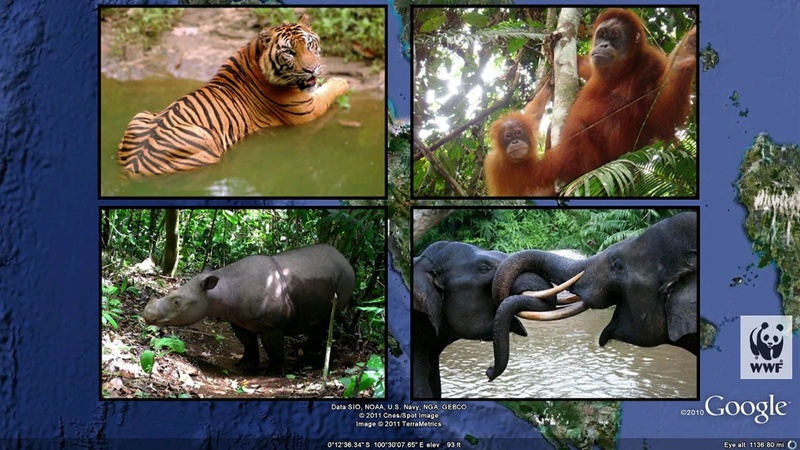 Sumatra is the only place in the world where rhinos, tigers, elephants and orangutans all live together within the same forest landscapes. 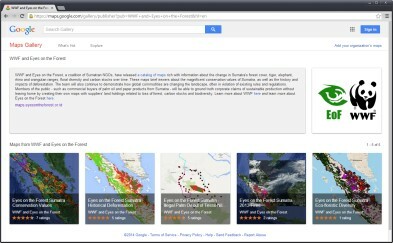 The website was built to use the newly launched Google Maps Engine GIS cloud storage system to present large amounts of data on top of Google Maps. 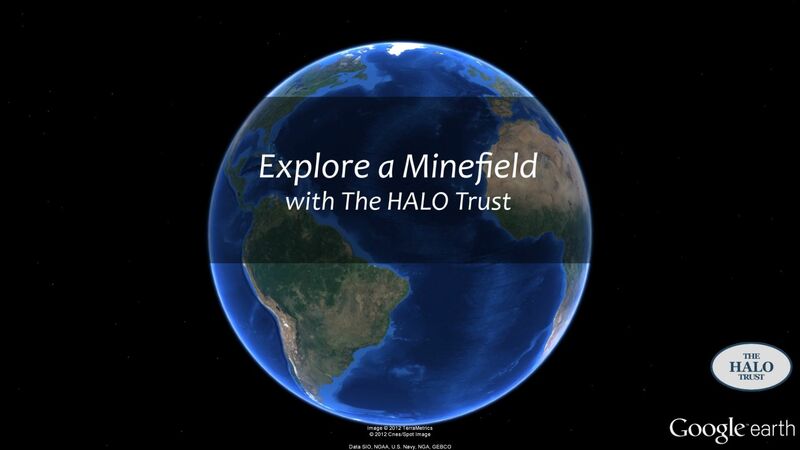 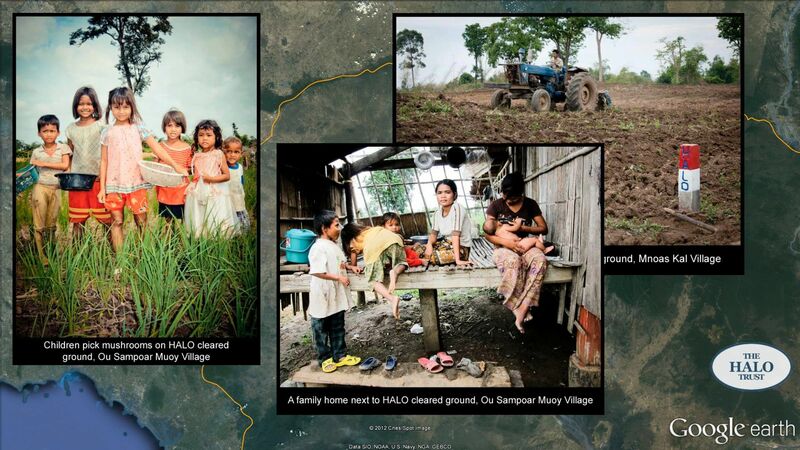 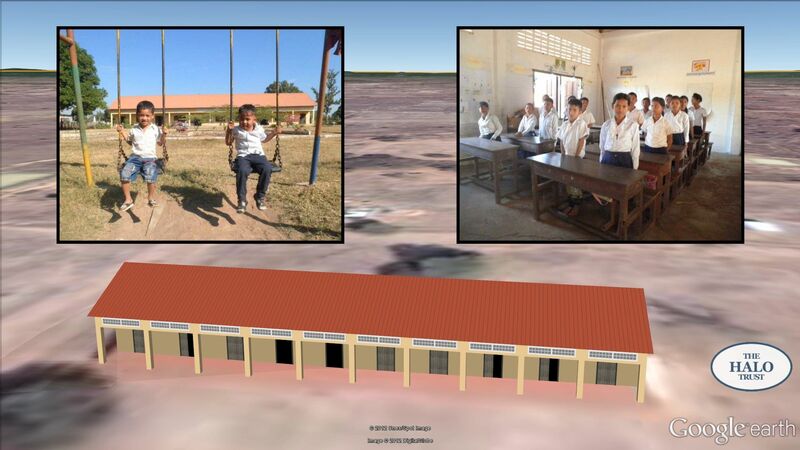 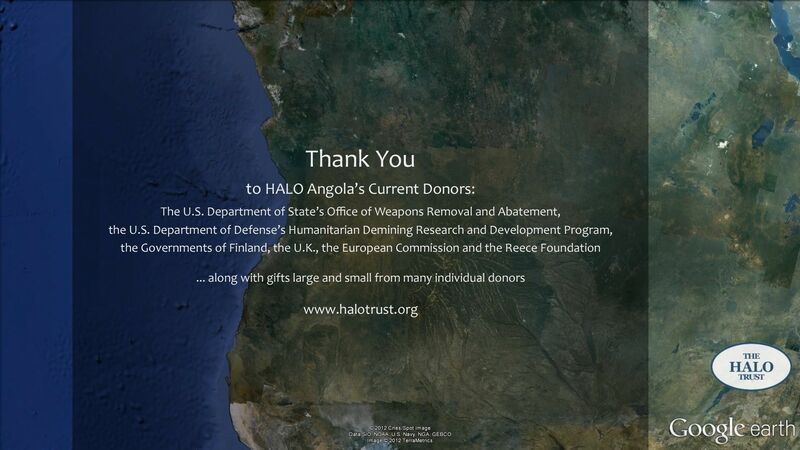 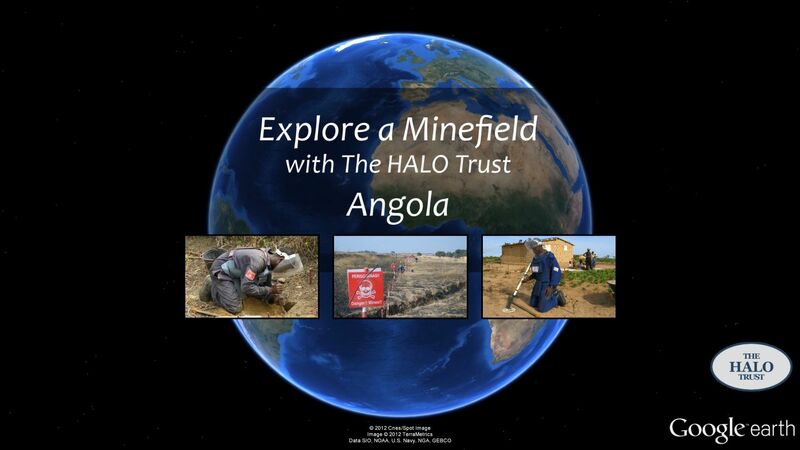 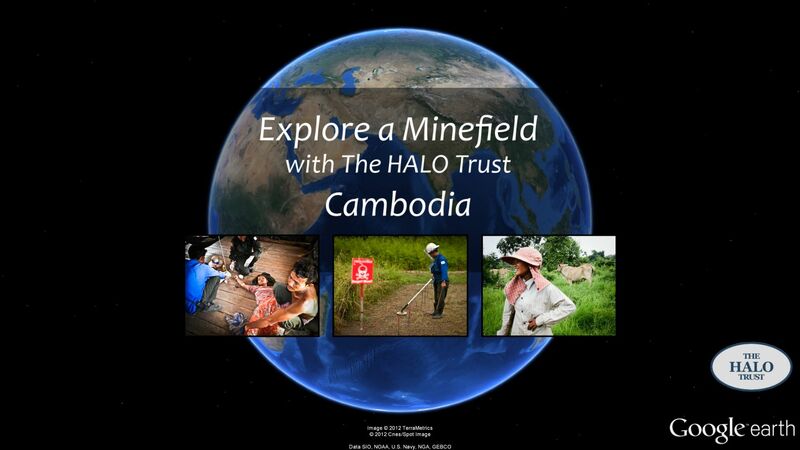 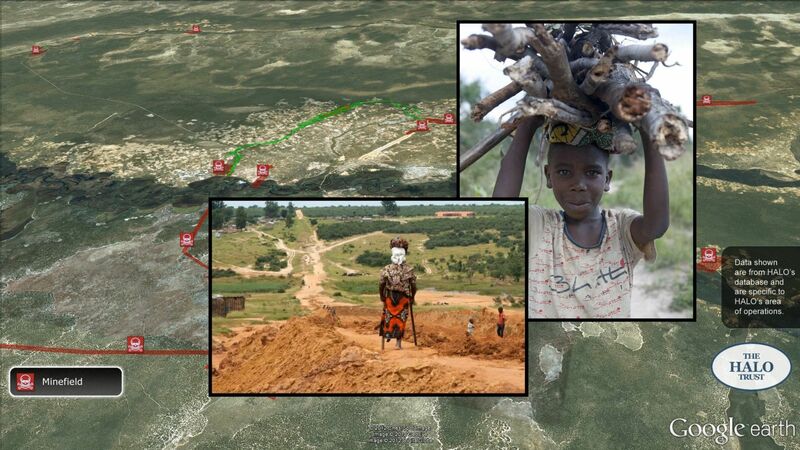 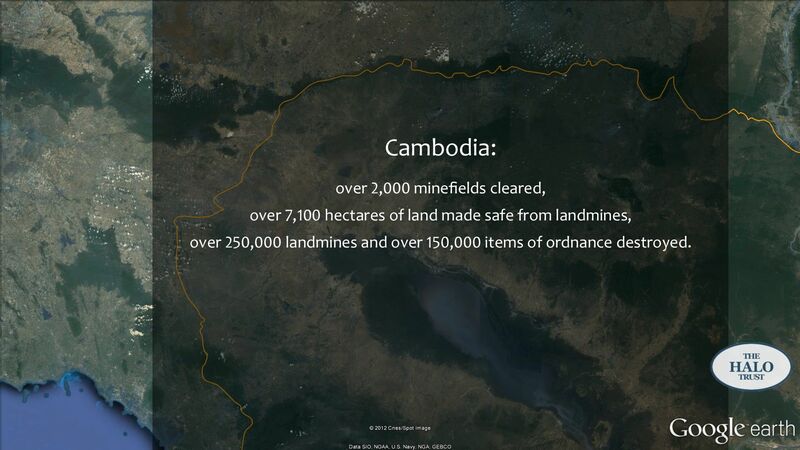 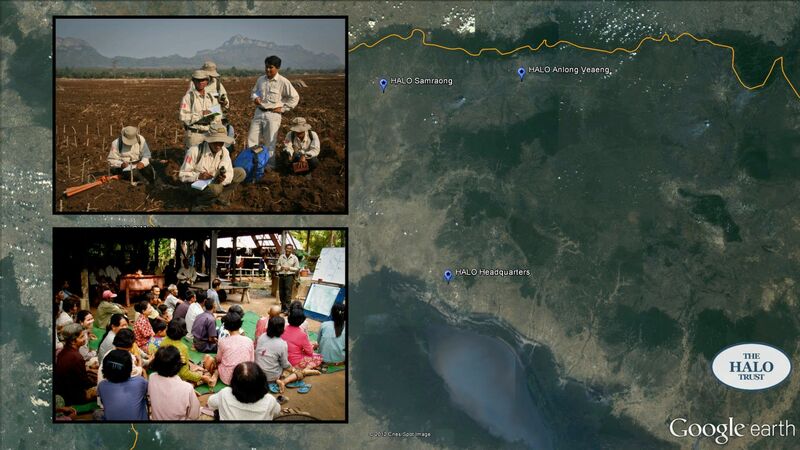 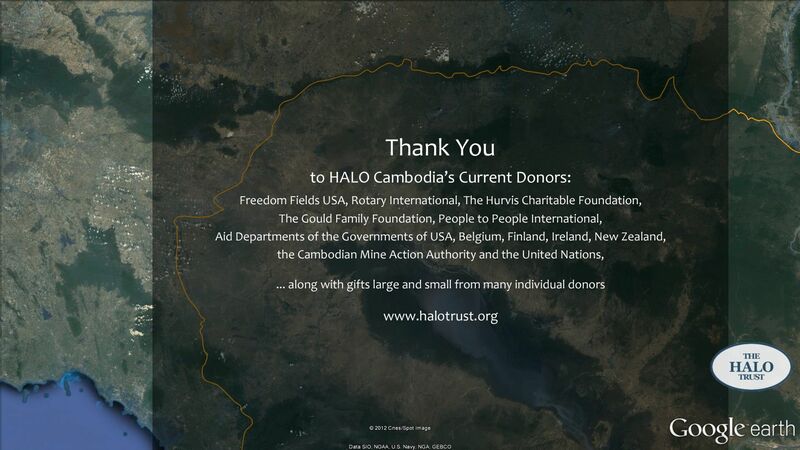 This tour was created for the The HALO Trust, to show the work the organization is doing in Cambodia and Angola, clearing thousands of mine fields and making land safe for locals to use. 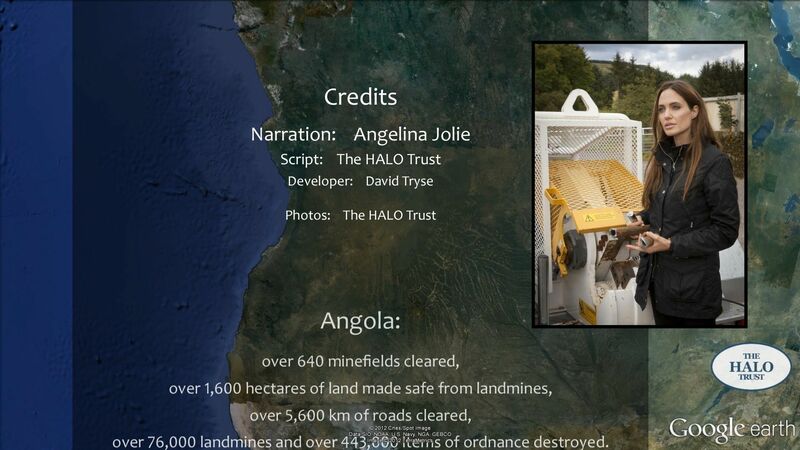 The tour is narrated by Angelina Jolie. 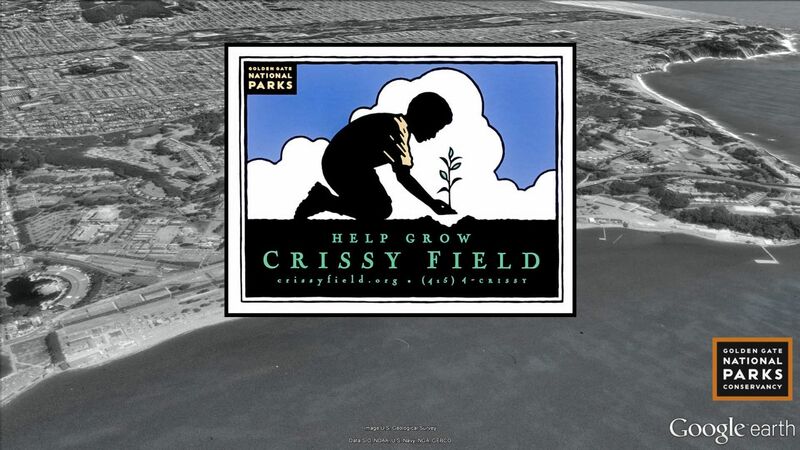 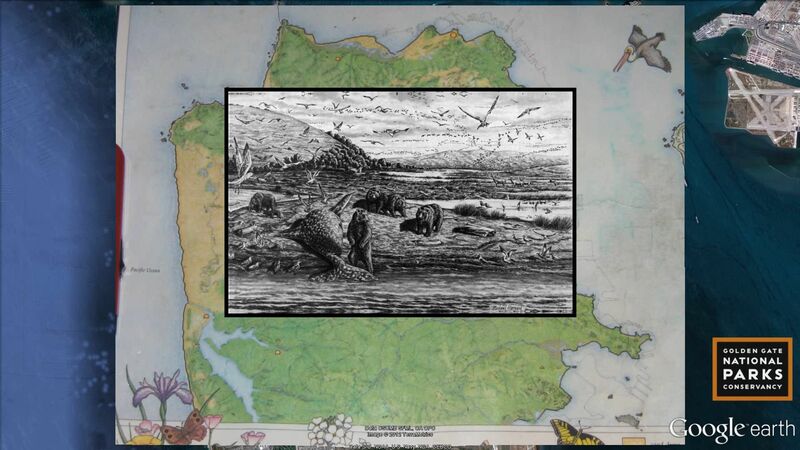 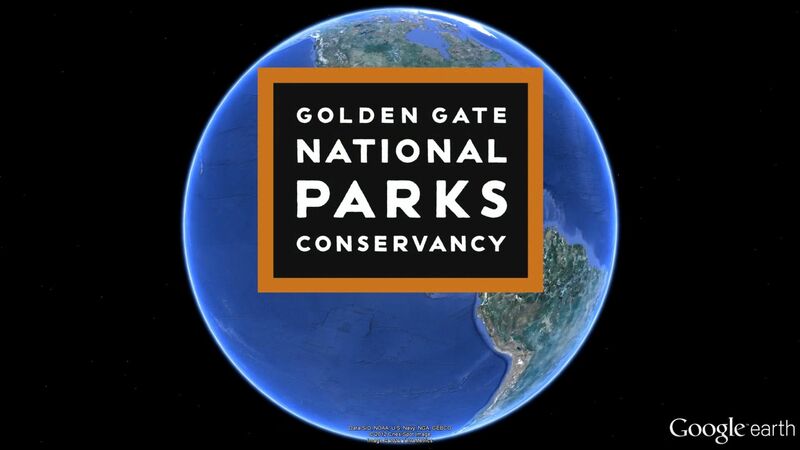 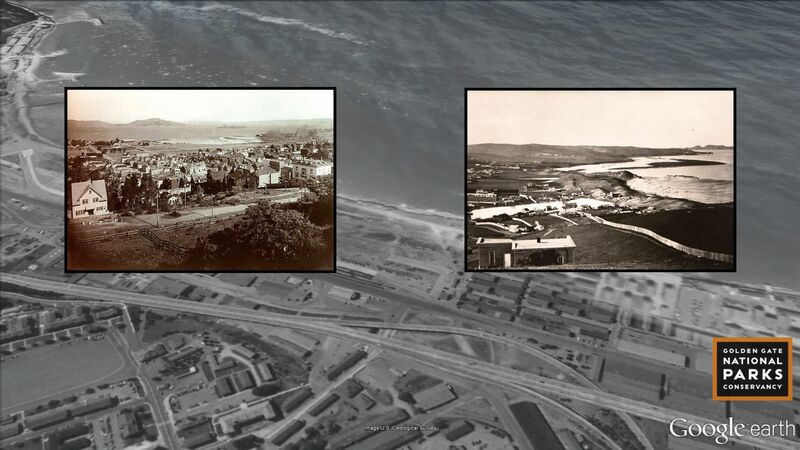 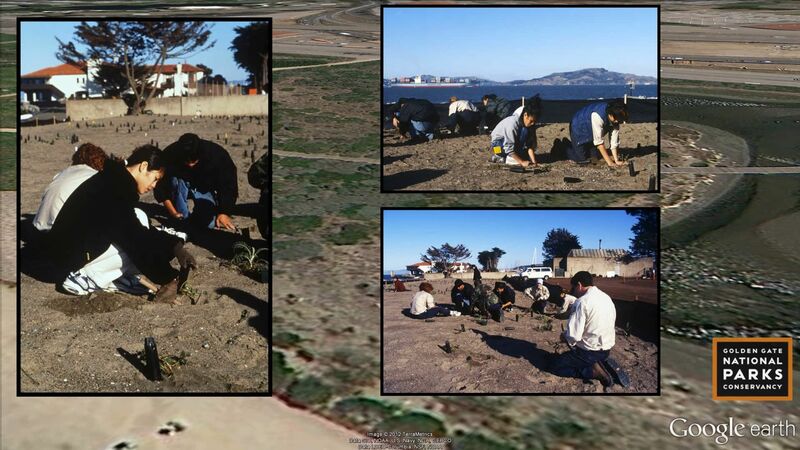 This tour was created for the Golden Gate National Parks Conservancy to showcase the history and transformation of the Crissy Field national park in San Francisco - from race-track and army airfield, to dumping ground, to finally being restored as a park and wetland. 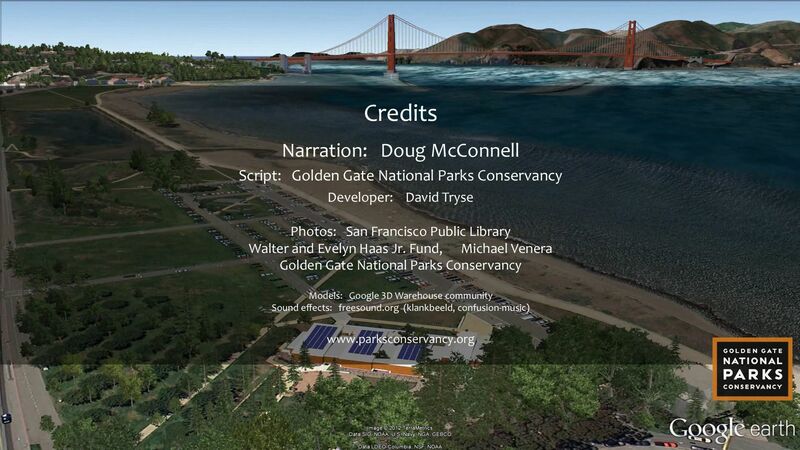 The tour is narrated by television journalist Doug McConnell. 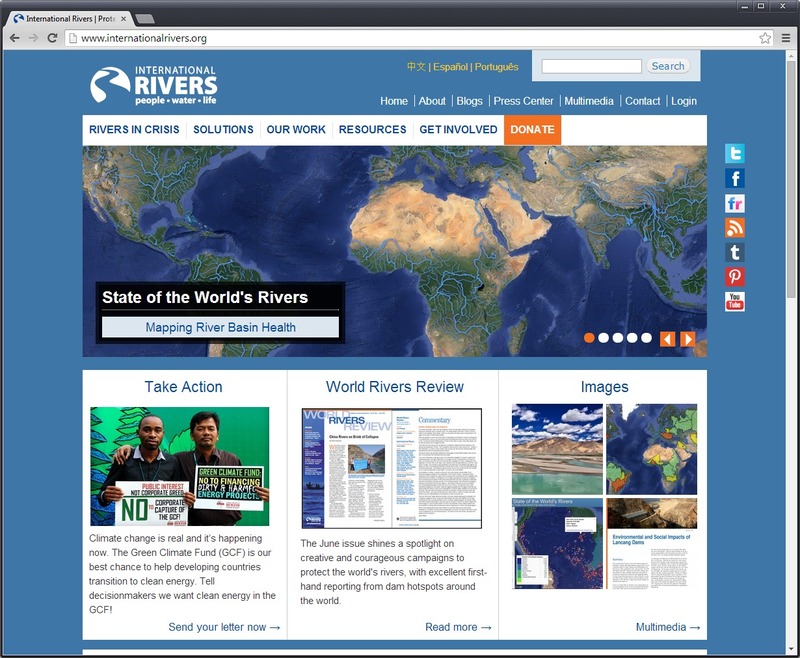 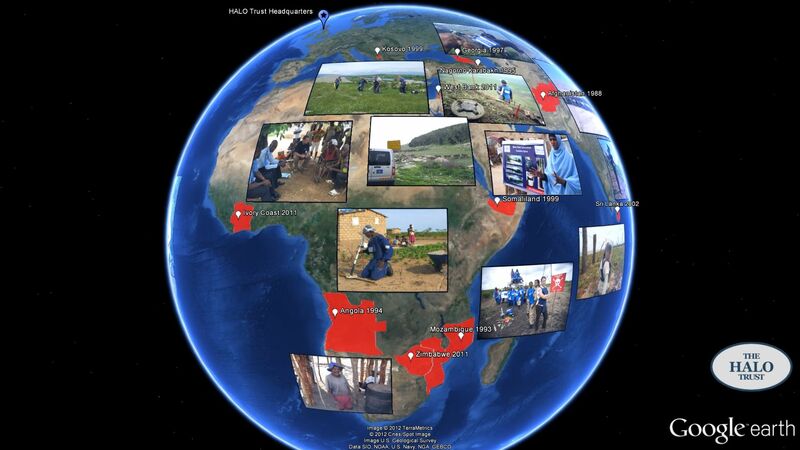 This tour was created for International Rivers and Friends of the Earth International , to be shown at the 2011 United Nations Climate Change Conference in Durban. 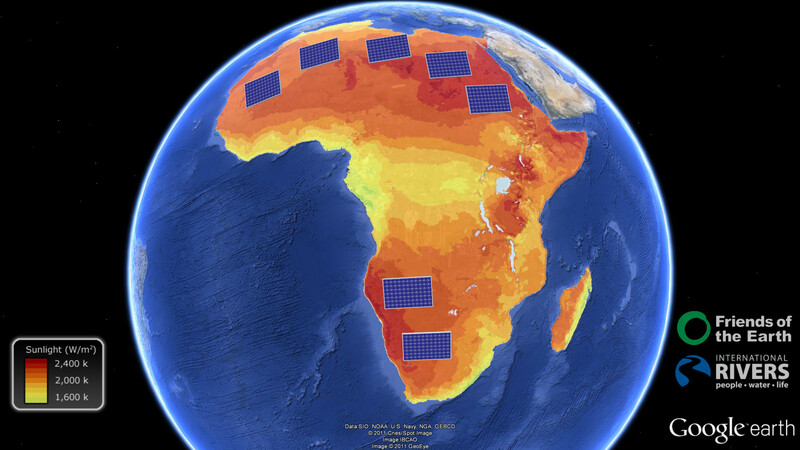 The world is long overdue to take strong actions on climate change, and as such there is a risk that we scramble for solutions that turn out to be counter-productive. 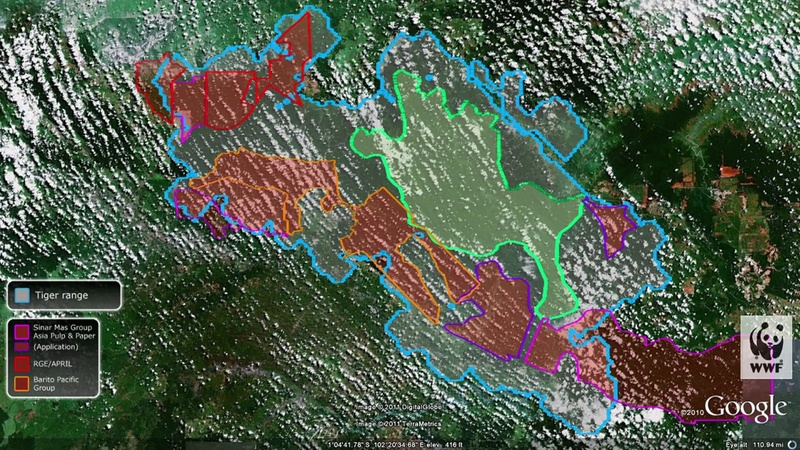 This video explores why sacrificing some of our last wilderness areas for large megadams may only bring us further from the solution. 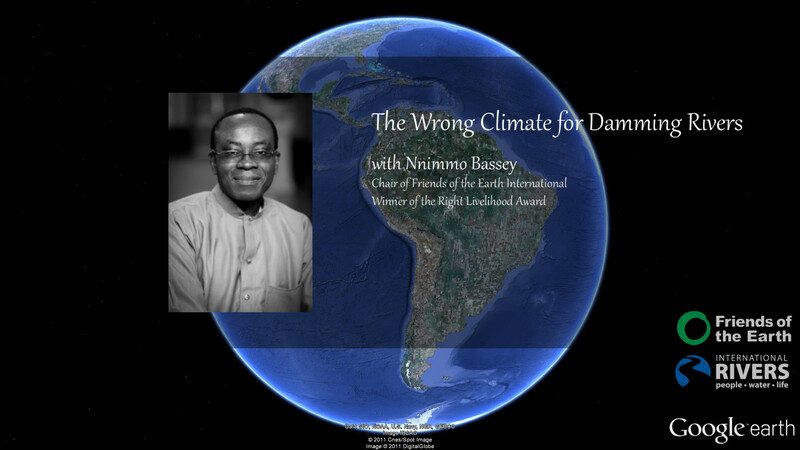 The tour is narrated by Nigerian activist and chair of FOEI Nnimmo Bassey. 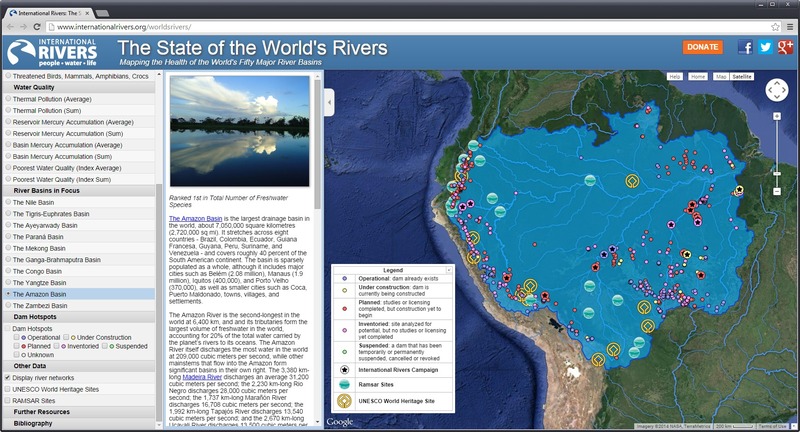 Mongabay: Are hydroelectric dams a solution to climate change? 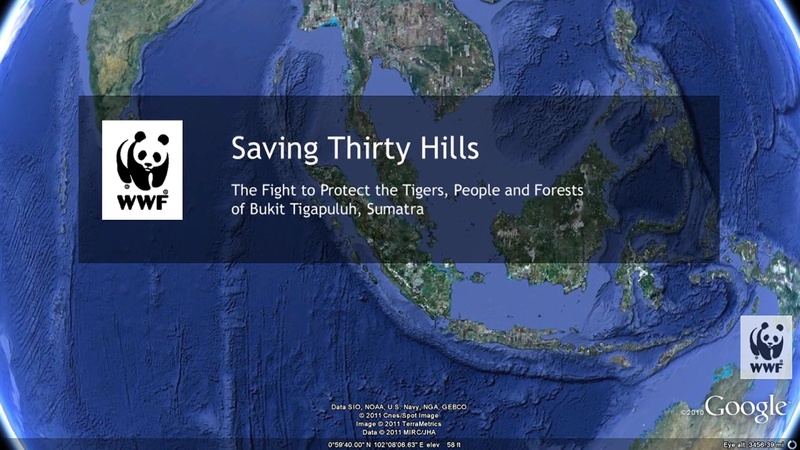 This tour was created for the World Wildlife Fund, to help save the Bukit Tigapuluh landscape on Sumatra which is home to one of the last remaining populations of the Indonesian tiger. 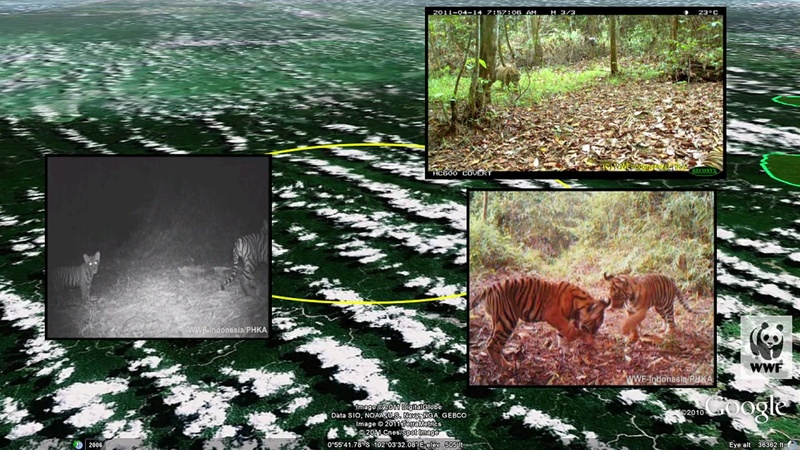 The forest area currently being targeted by pulp and paper companies is one of the top 20 priority landscapes globally for the survival of the tiger in the wild. 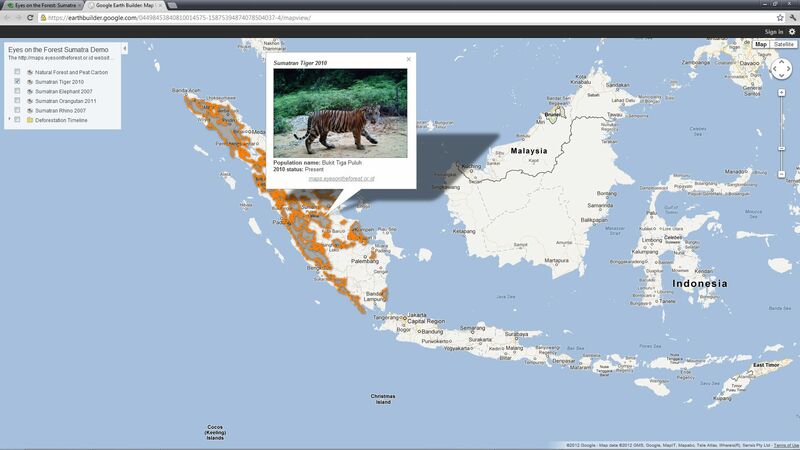 WWF: Help save the tiger! 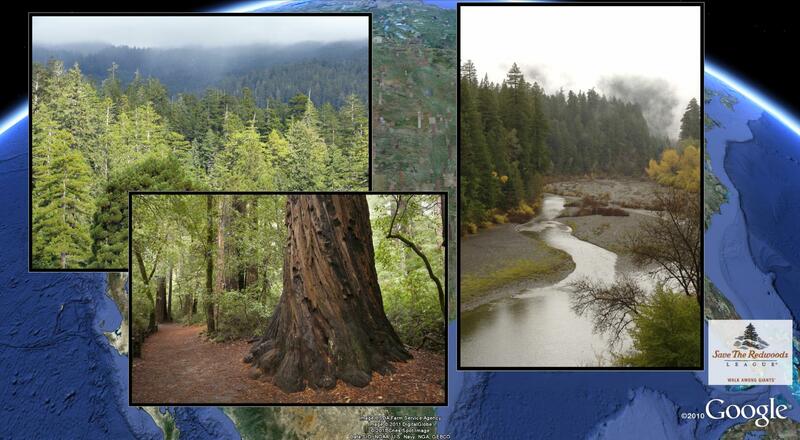 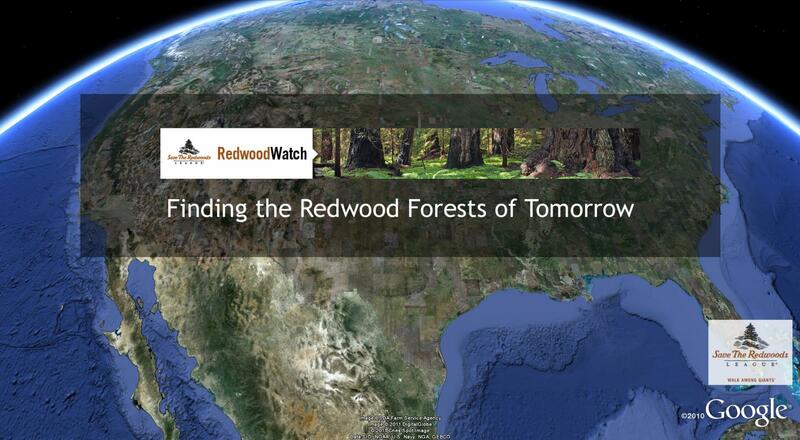 This tour was created for the Save the Redwoods League, to help launch their new citizen science project Redwood Watch. 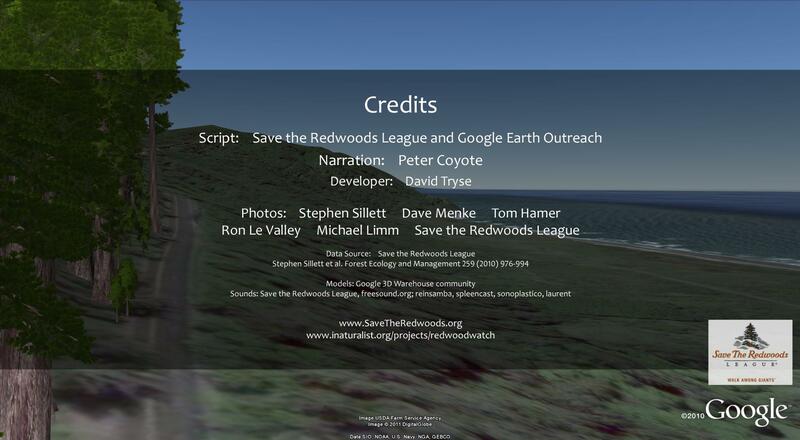 The tour is narrated by Peter Coyote. 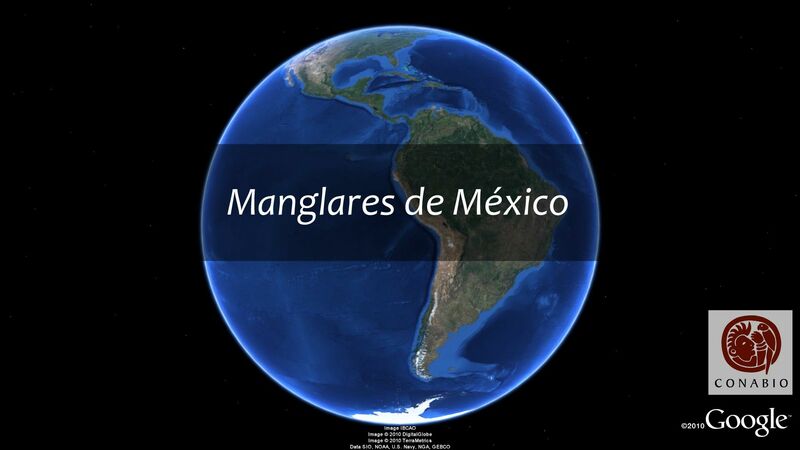 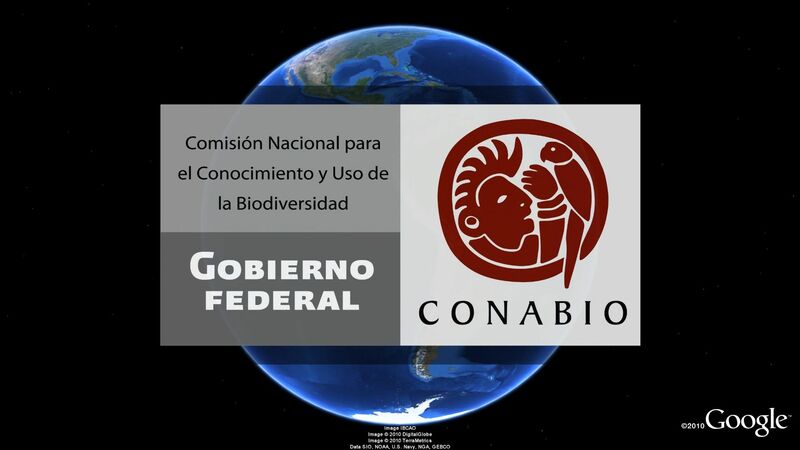 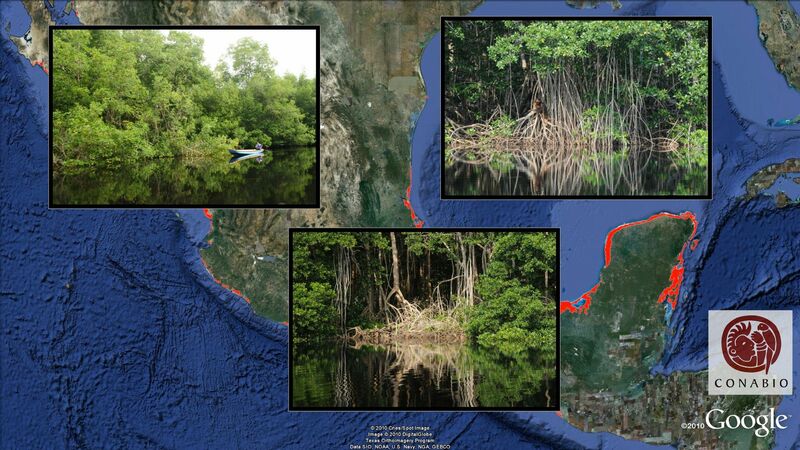 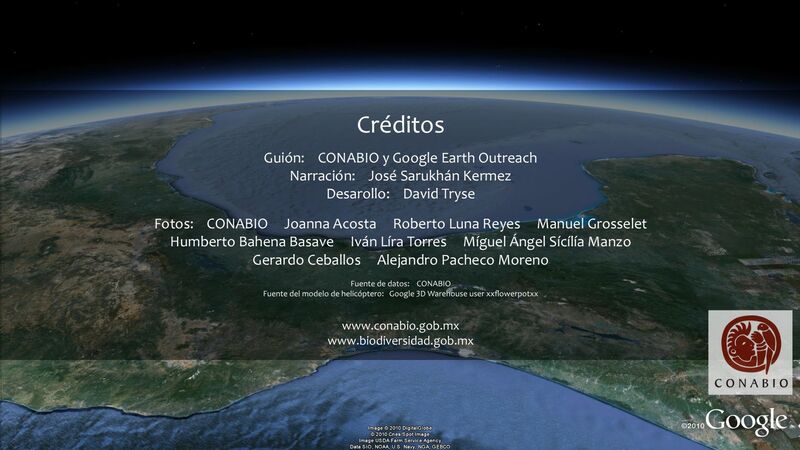 This tour was created for the National Commission for the Knowledge and Use of Biodiversity in Mexico (CONABIO), to illustrate their efforts in preserving the country's biodiverse mangrove forests. 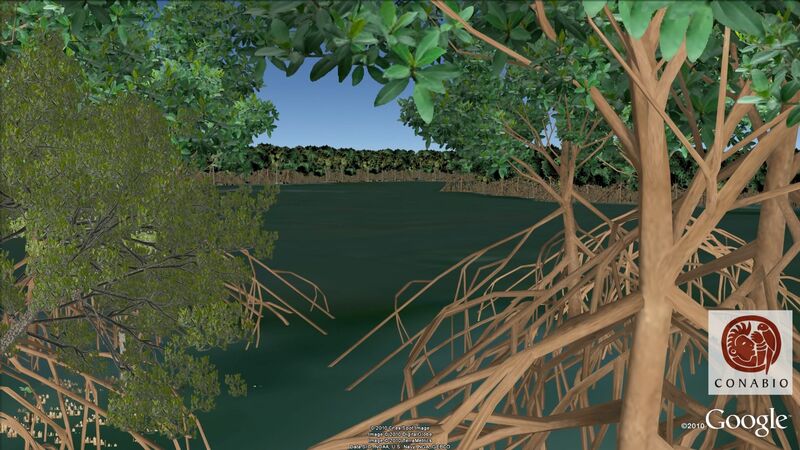 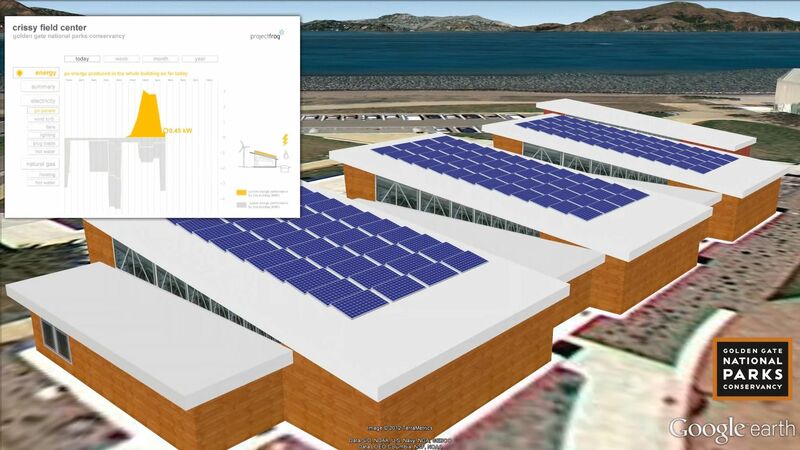 Displayed at the UN COP16 meeting in Cancún 2010, the tour also shows off the new 3D tree models created by Google for the Google Earth 6.0 release. 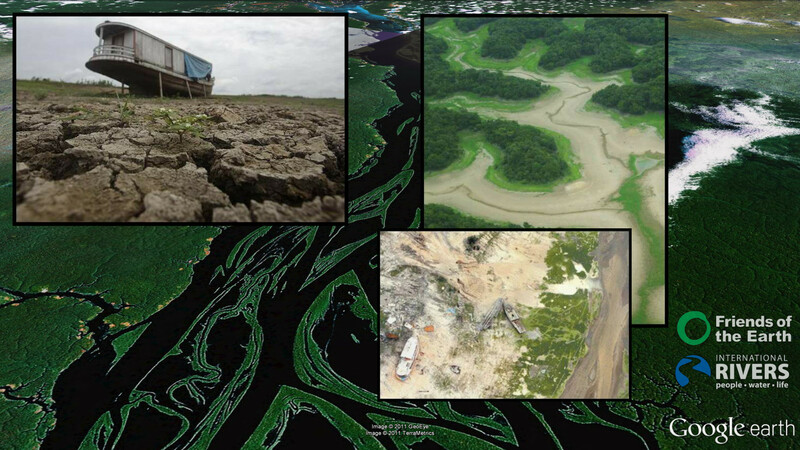 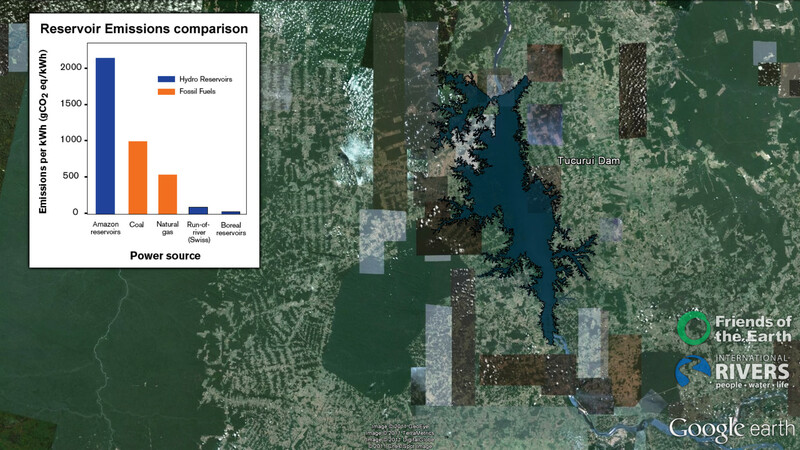 This KML tour created in collaboration with International Rivers and Amazon Watch explores the potential impacts of the planned Belo Monte Dam Complex in the Brazilian Amazon. 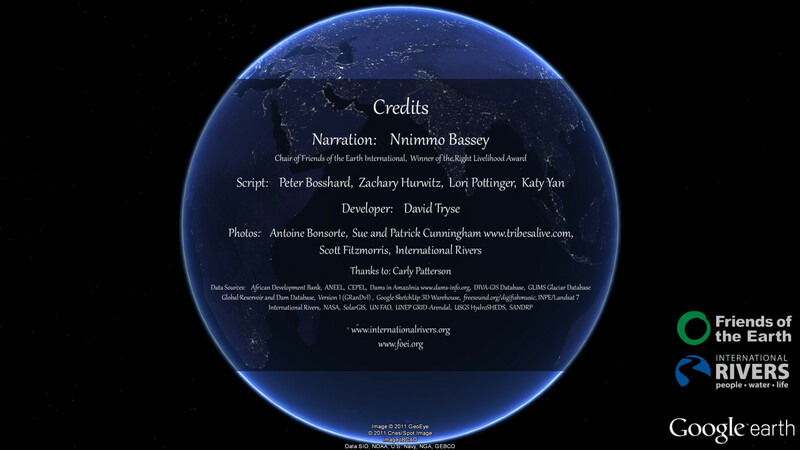 A short clip from this KML tour has been included in the A Message from Pandora feature on the Avatar Extended Edition DVD. 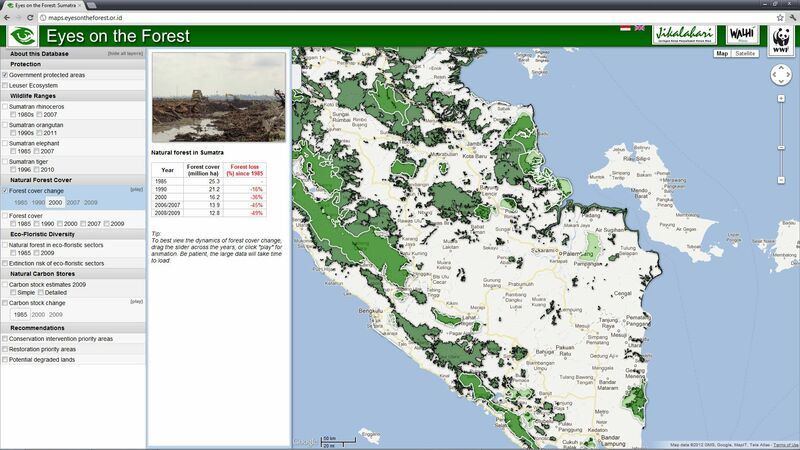 This KML shows information about the 50 worst oil spills, from tanker accidents and drilling operations, as well as a number of other notable spills. 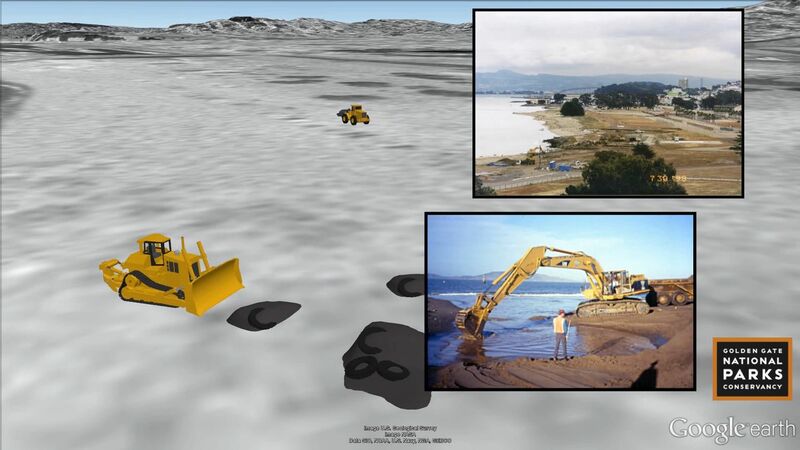 Did you know that some of the biggest oil spills in history were actually intentional? 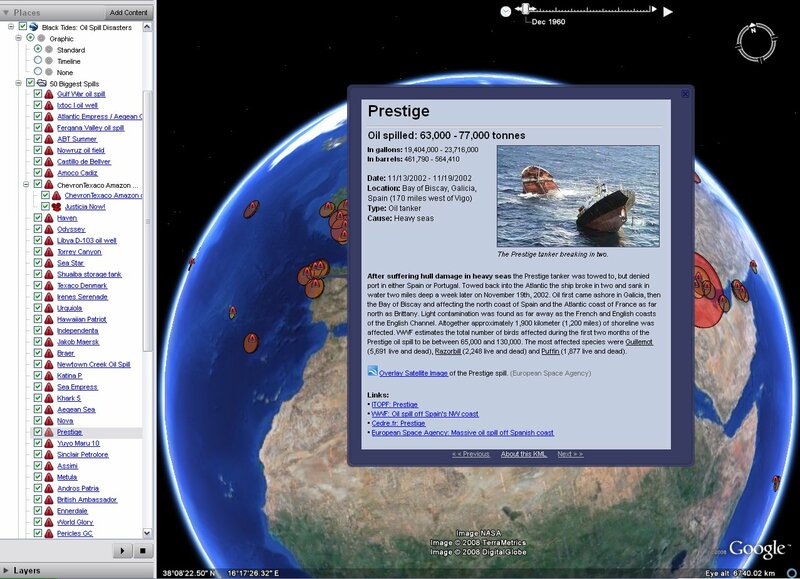 This page has a full list of all the spills with references. 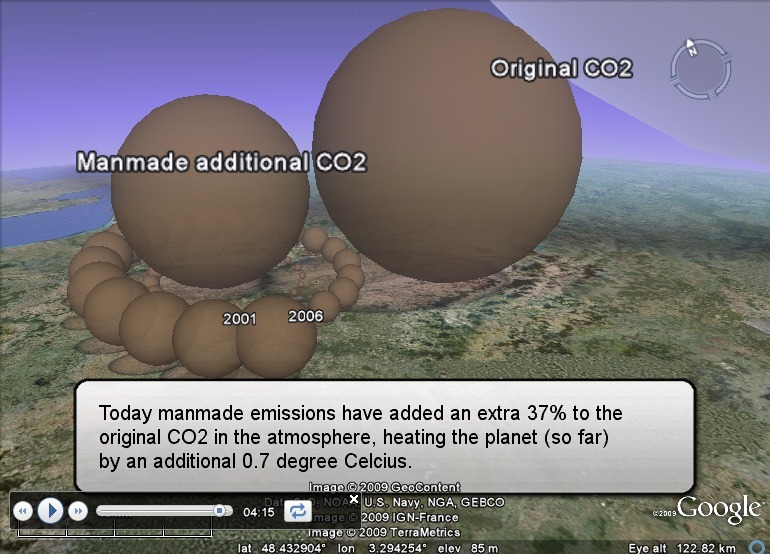 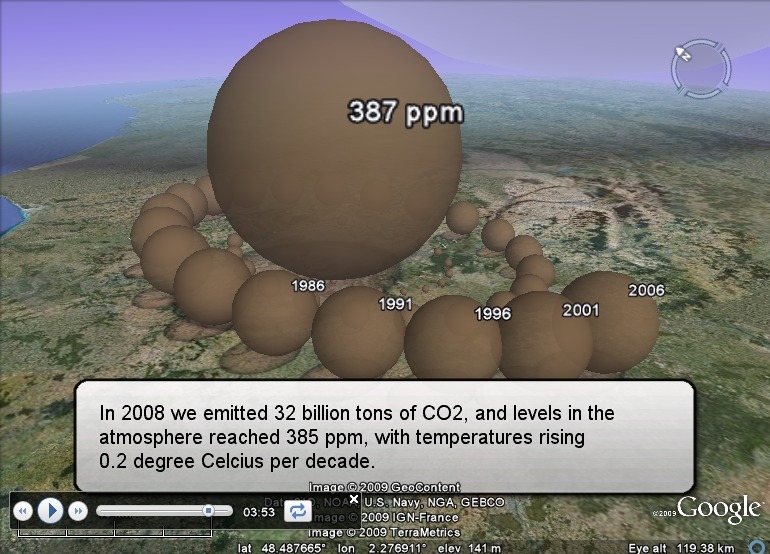 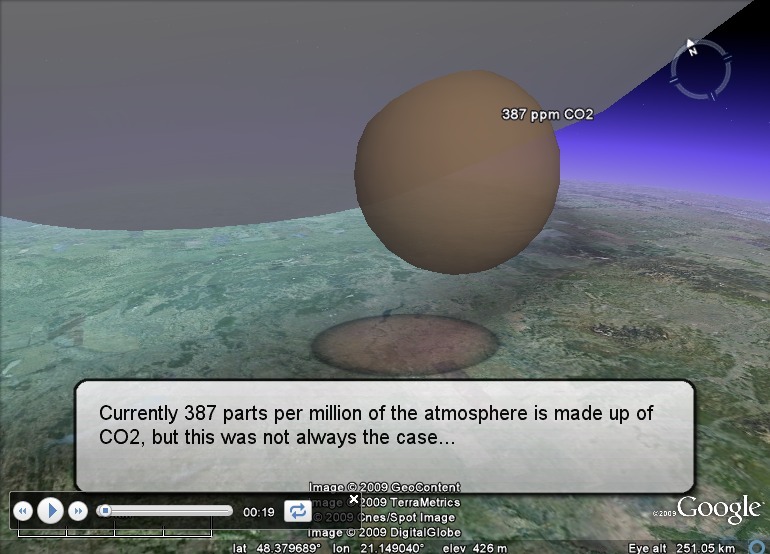 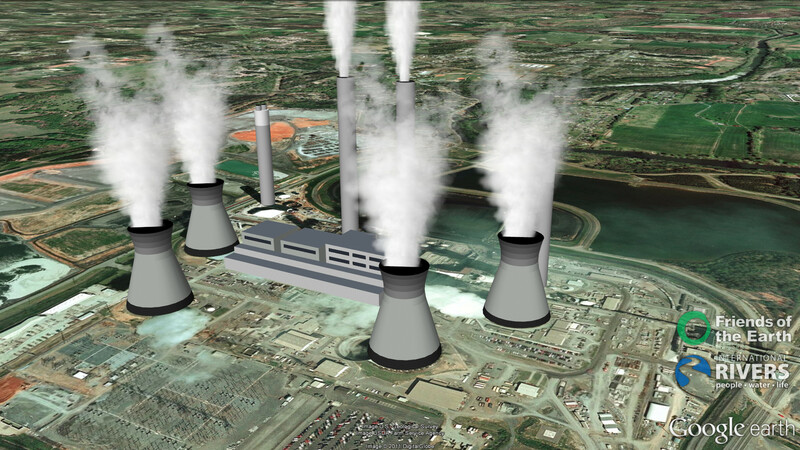 This KML attempts to give a sense of scale to our CO2 emissions. 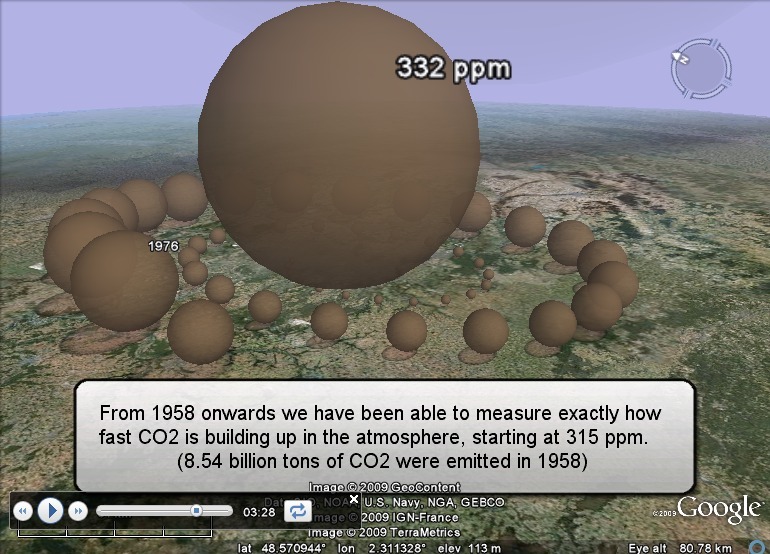 It illustrates the total volume of CO2 emitted by man since the Industrial Revolution, as well as emission growth through the last two centuries. 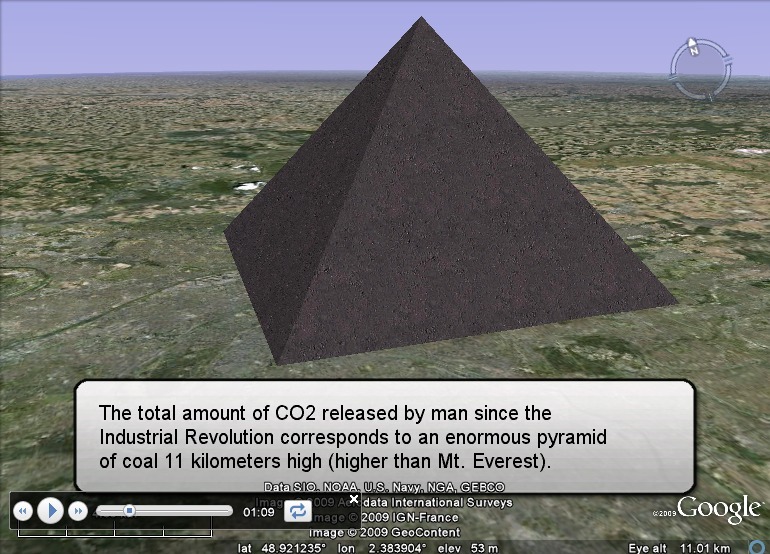 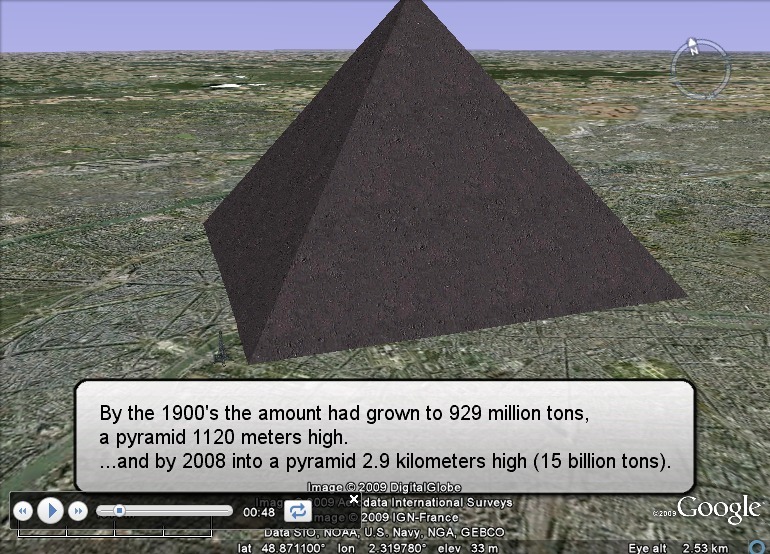 The KML also shows, next to the Eiffel Tower, an enormous pyramid of coal corresponding to the total amount burned by mankind throughout history. 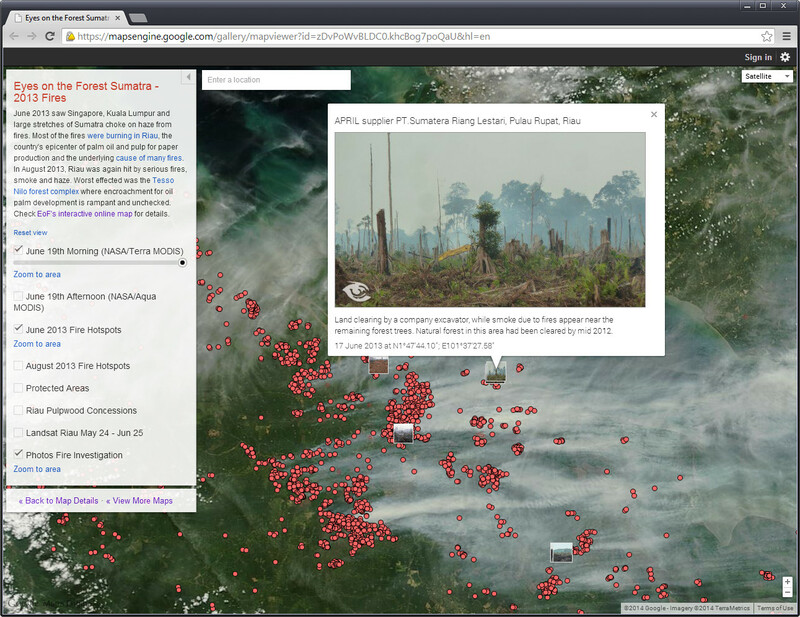 Please see this page for a full list of sources. 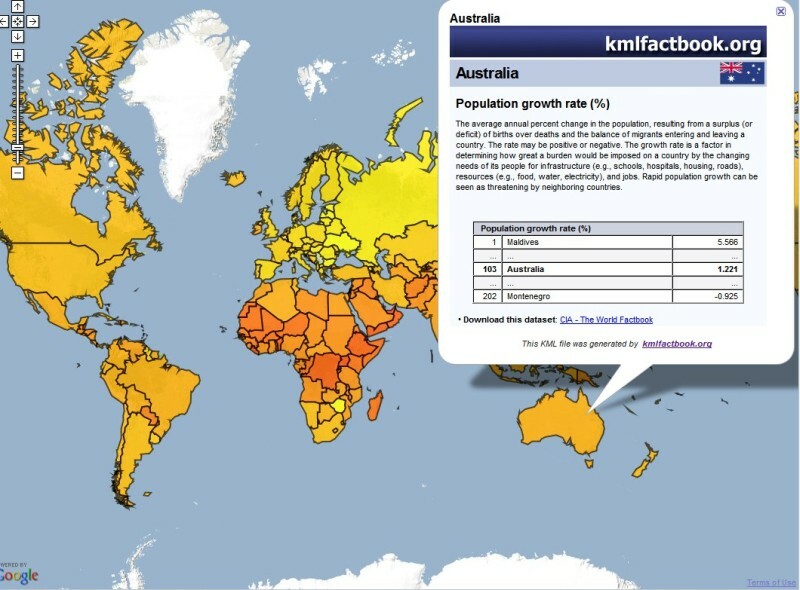 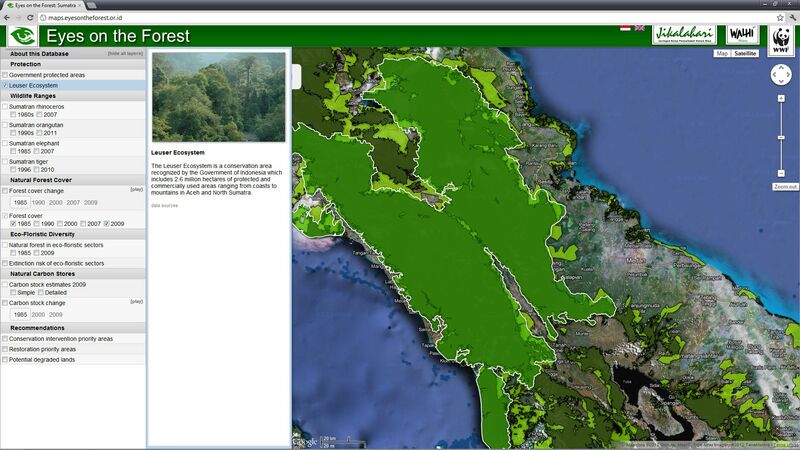 Kmlfactbook.org is a web application that allows you to create Google Earth visualizations similar to the Disappearing Forests KML file below from your own custom data. 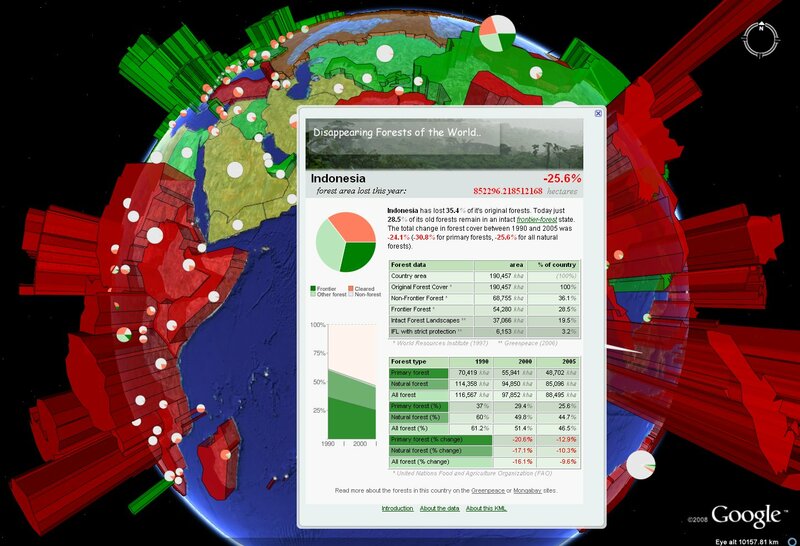 Country level data can be uploaded in CSV format to create 3D prism visualizations, or more traditional 2D choropleth maps and pie charts. 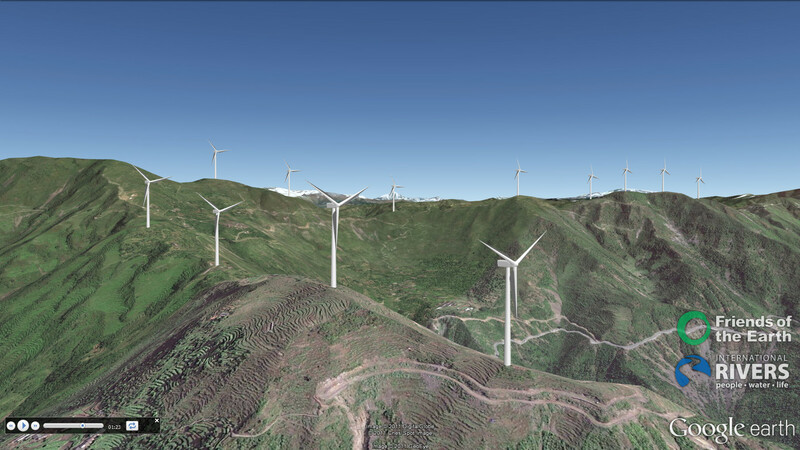 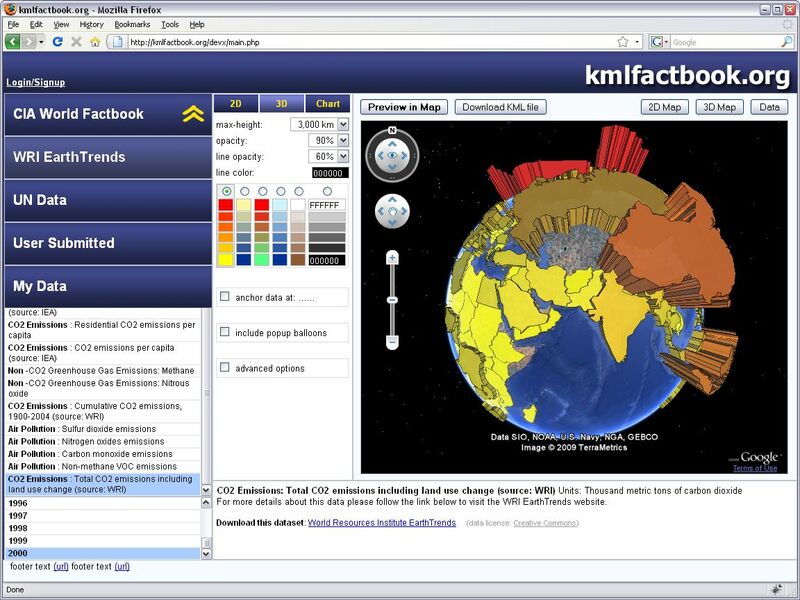 The output KML files can either be downloaded to be viewed in the Google Earth application, or be previewed in Google Maps or the new Google Earth browser plugin on the site. 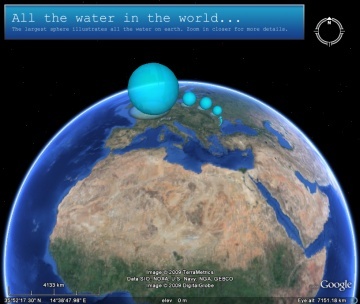 This KML shows the total volume of all water on earth, as if collected into a single sphere. 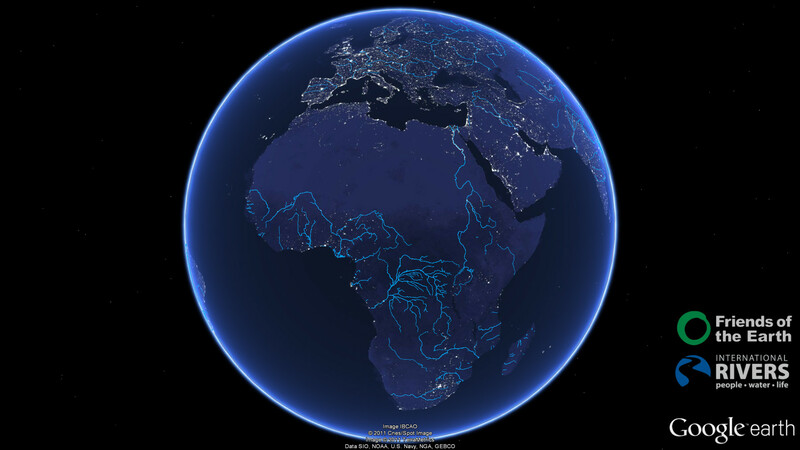 The smaller spheres illustrate the limited fresh water resources available on the planet. 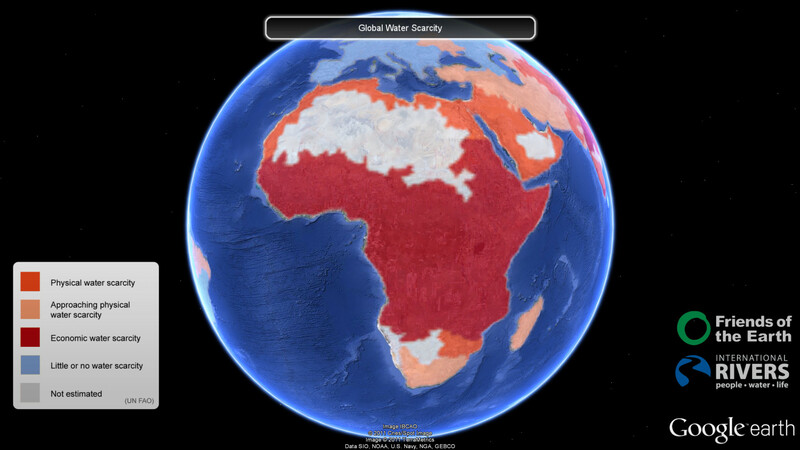 The KML also shows the volume of water that would be needed to rise global sea level by 1 meter, something that could displace tens of millions of people over the next hundred years if CO2 emissions are not curbed. 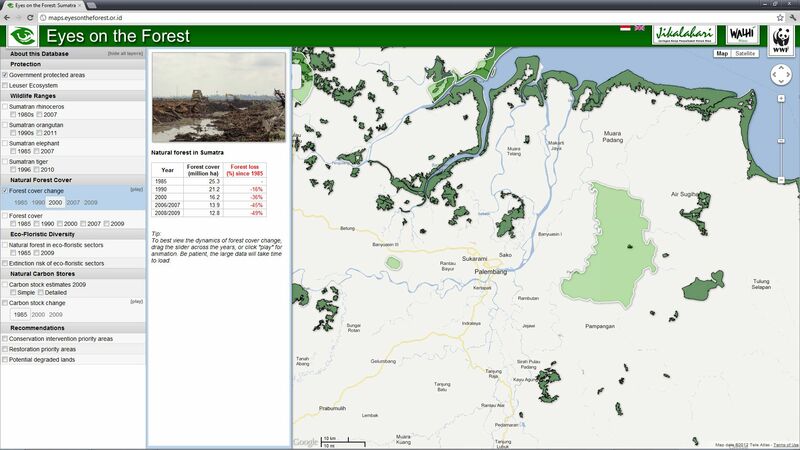 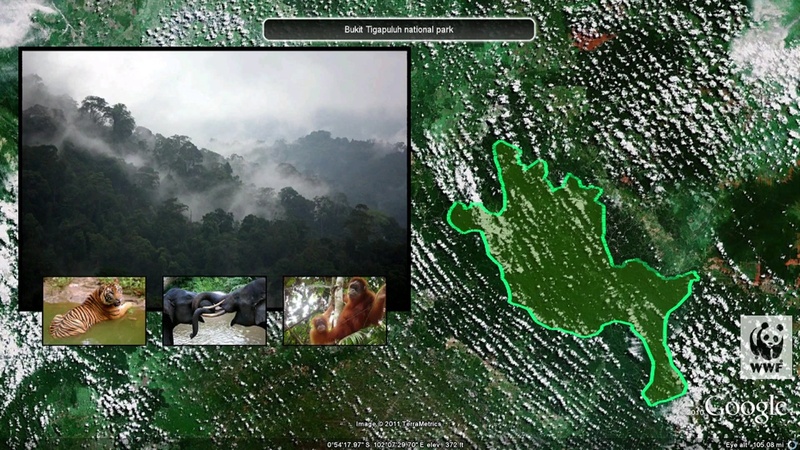 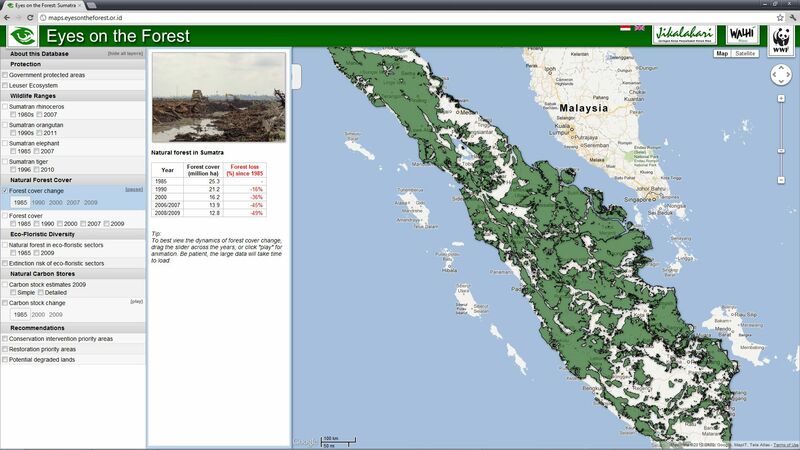 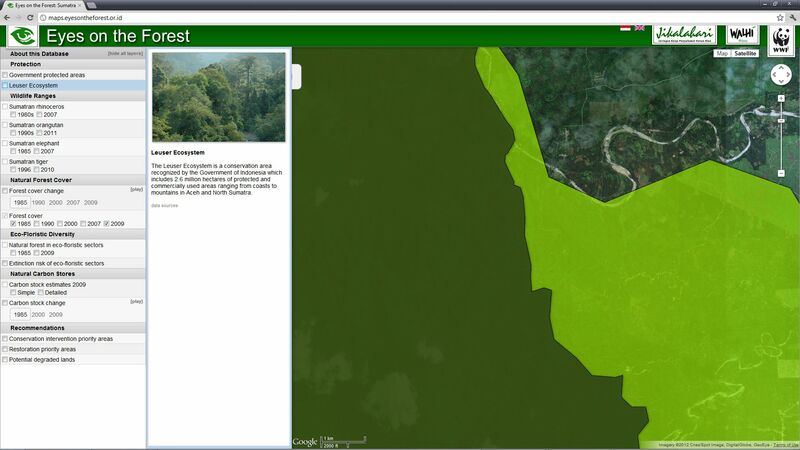 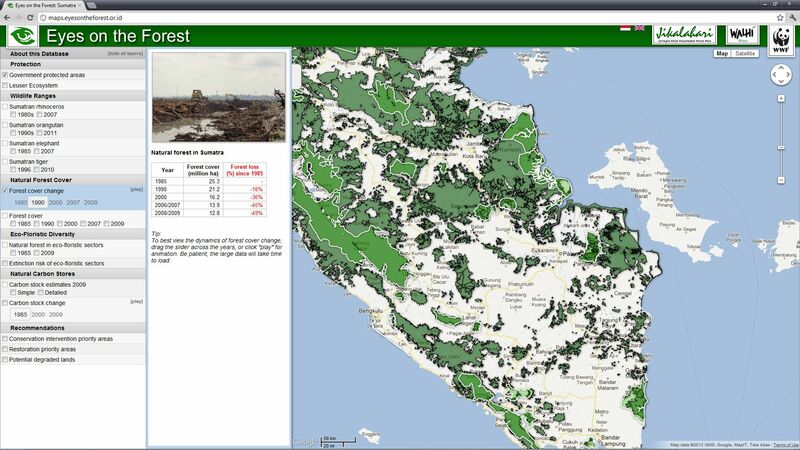 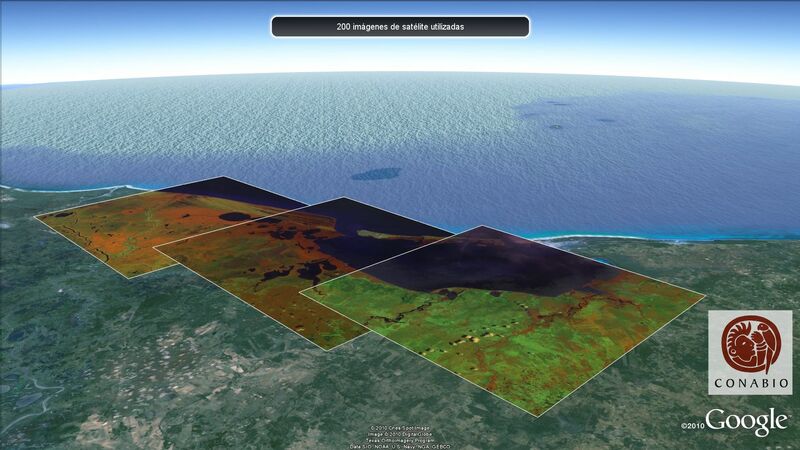 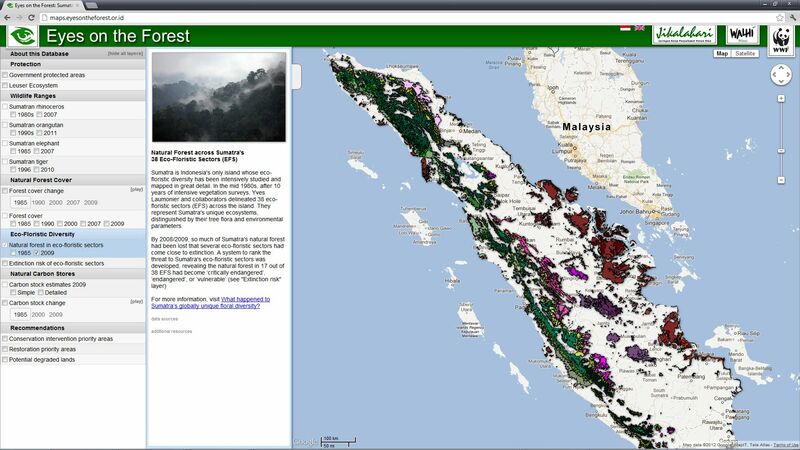 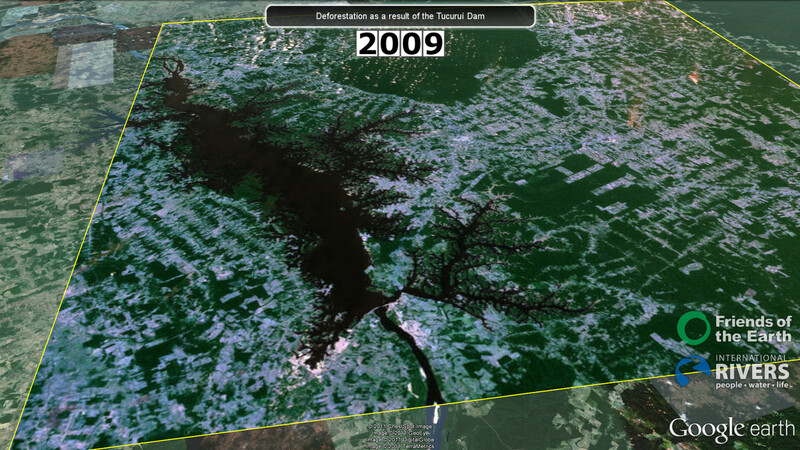 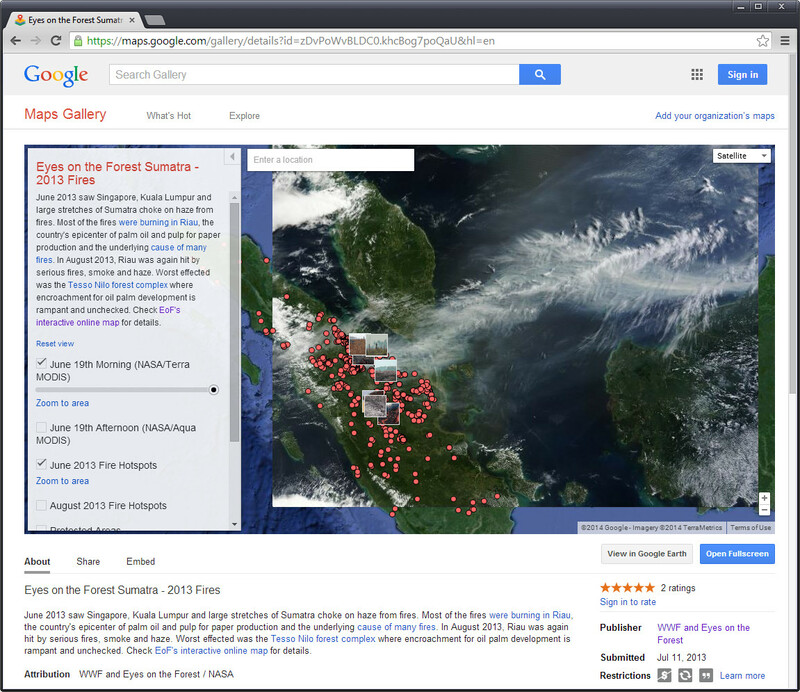 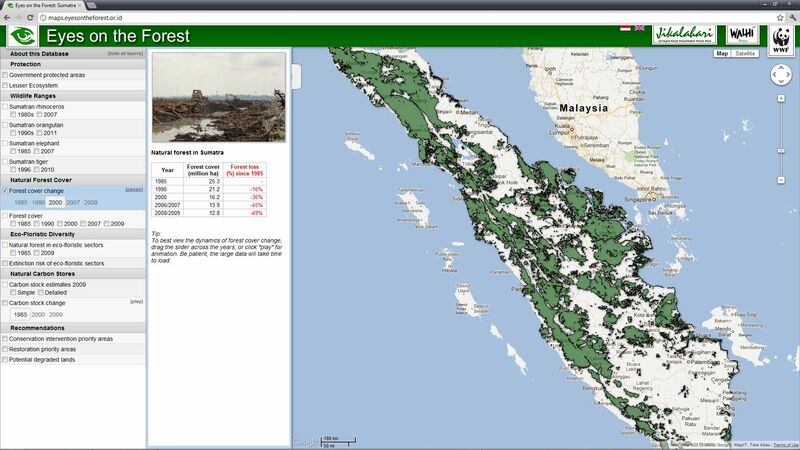 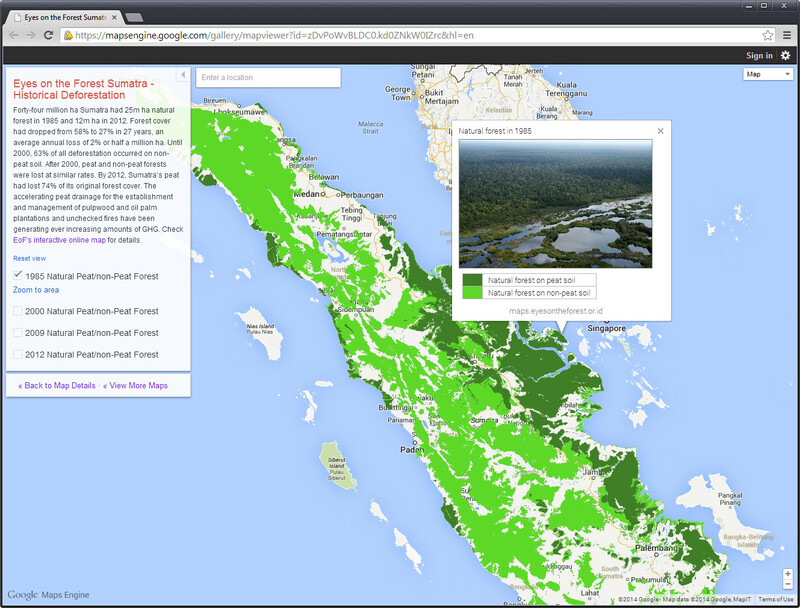 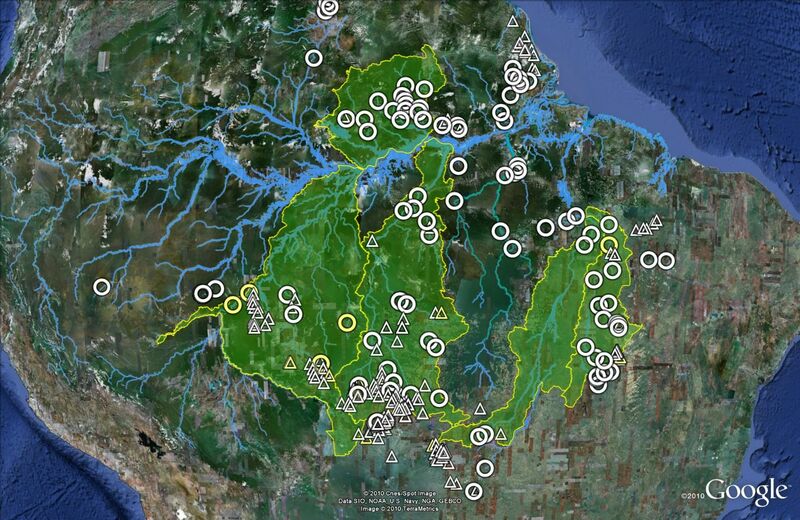 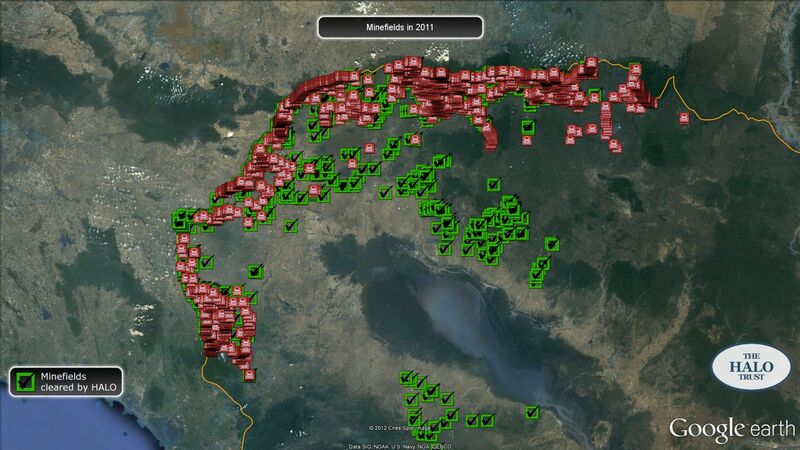 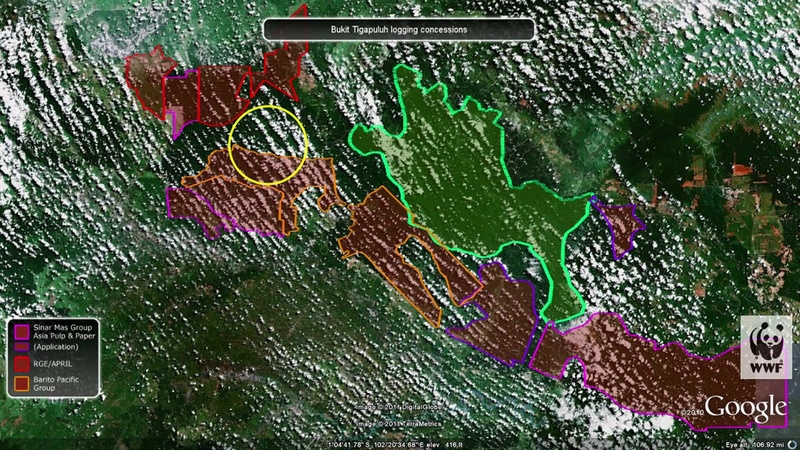 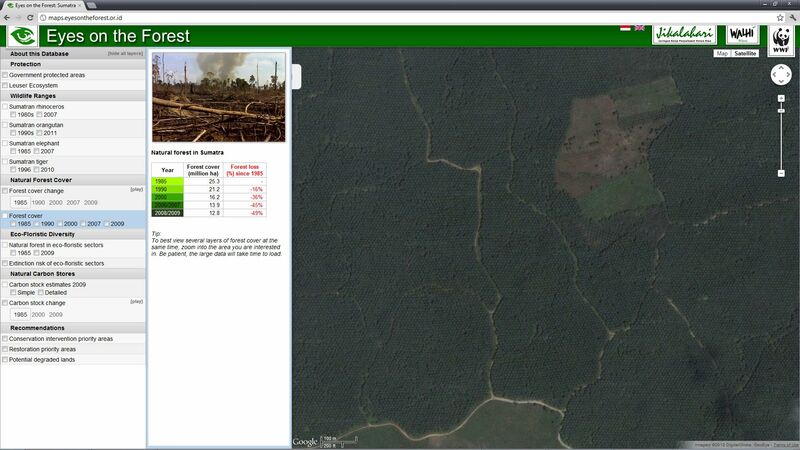 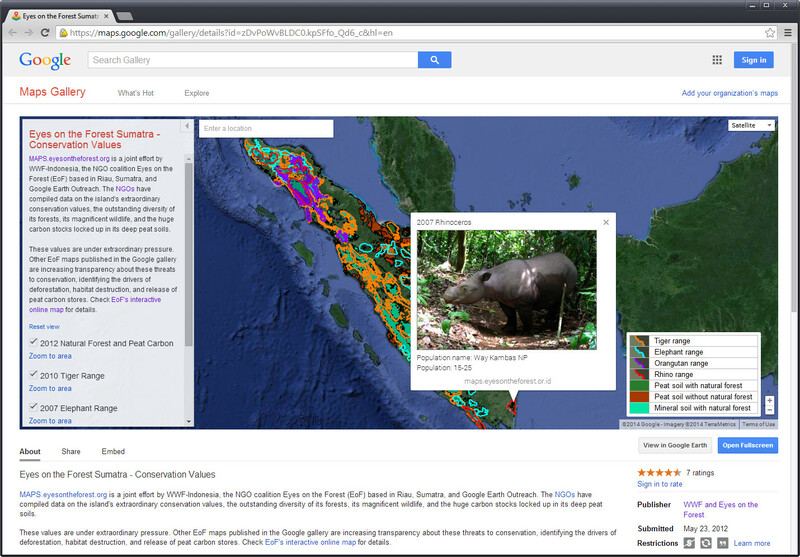 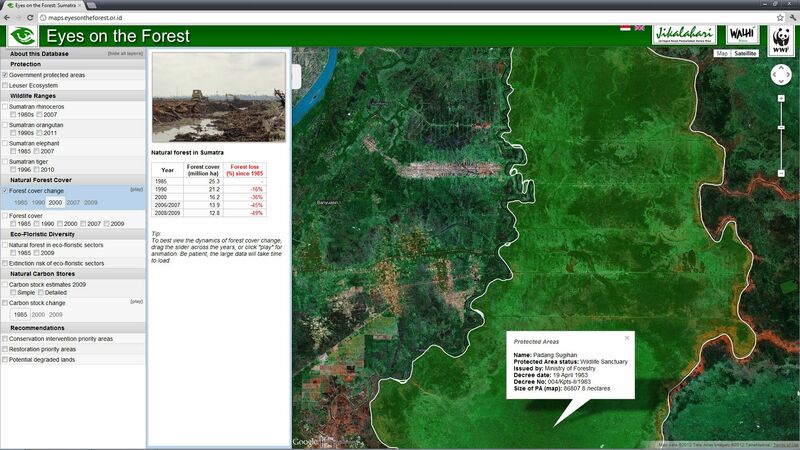 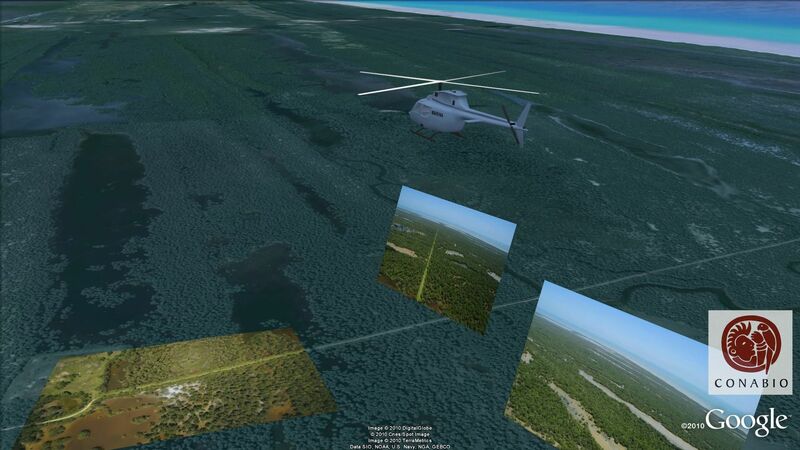 This KML is a project by my friend David Gaveau to present deforestation data for the island of Sumatra in Google Earth. 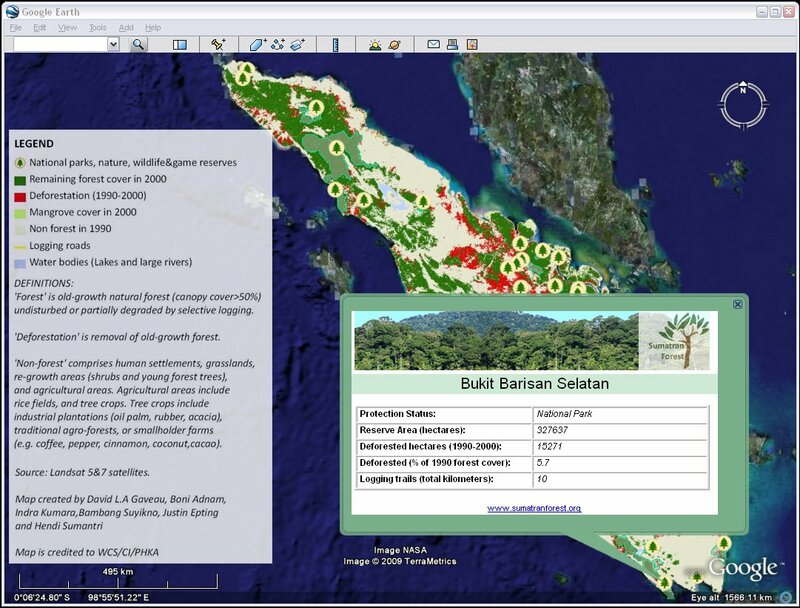 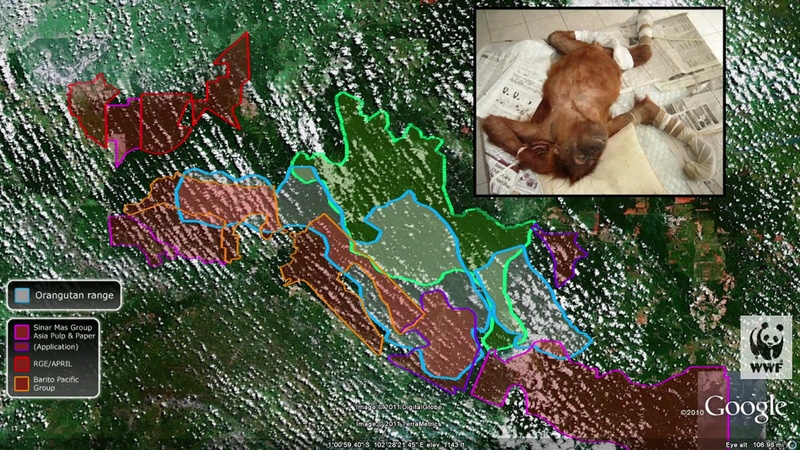 The data is the outcome of 6 years of research in Indonesia for the Wildlife Conservation Society and the kml shows deforestation data from 1990 until 2000 as well as protected area information and illegal road networks. 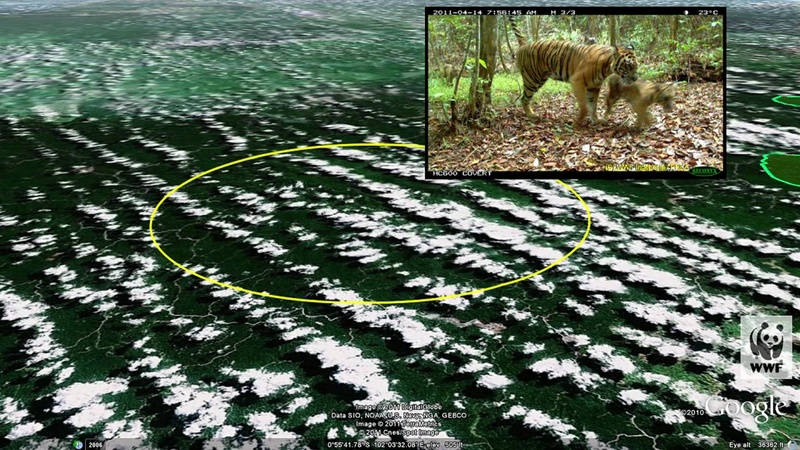 The island is still home to small populations of tiger, orangutan, rhinos and elephants, but lost some 5,000 square kilometers of rainforest per year during the 1990s - part of the reason Indonesia has become the world's 3rd biggest carbon dioxide emitter. 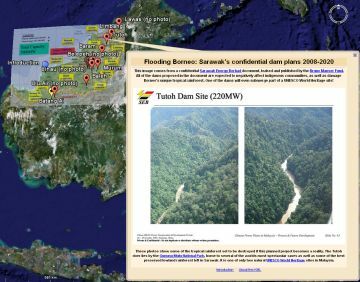 This KML file shows information from a confidential Sarawak Energy Berhad (SEB) document leaked and published by the Bruno Manser Fund. 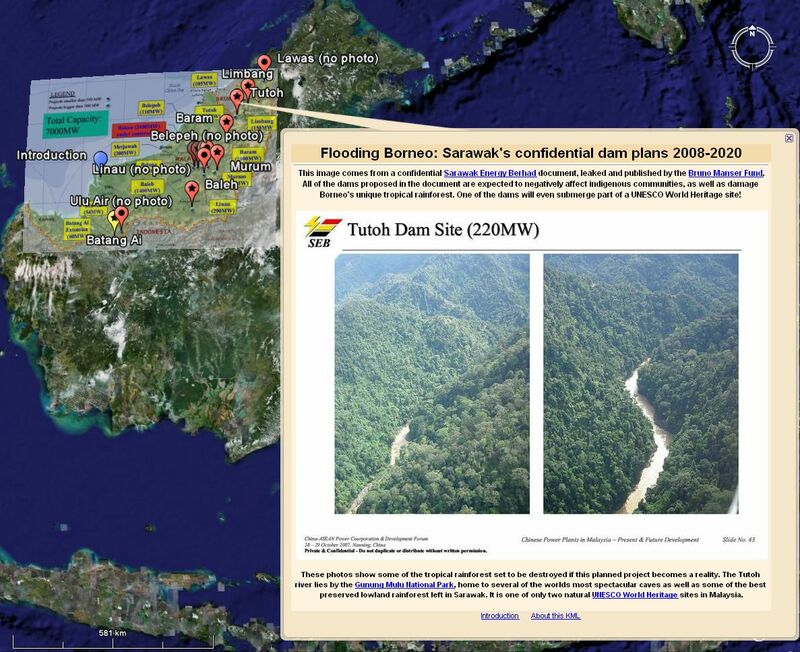 It highlights the plans for a number of very large hydroelectric projects set to flood vast areas of rainforest and displace thousands of indigenous people, including Penan, Kelabit and Kenyah. 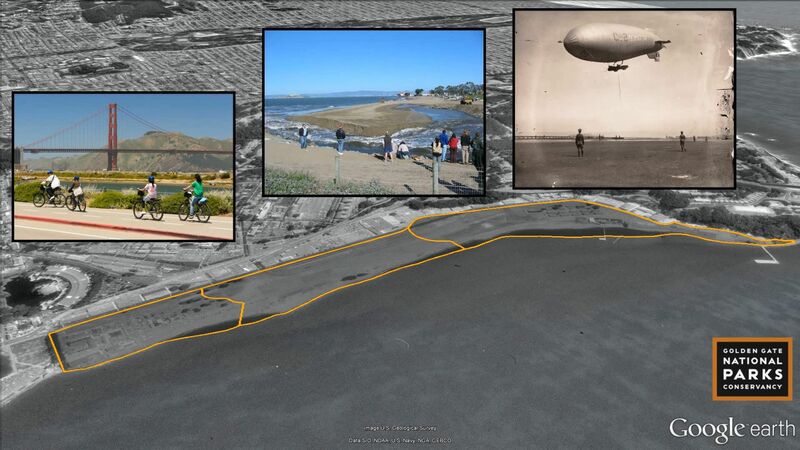 One of the projects will even submerge part of a UNESCO World Heritage site! 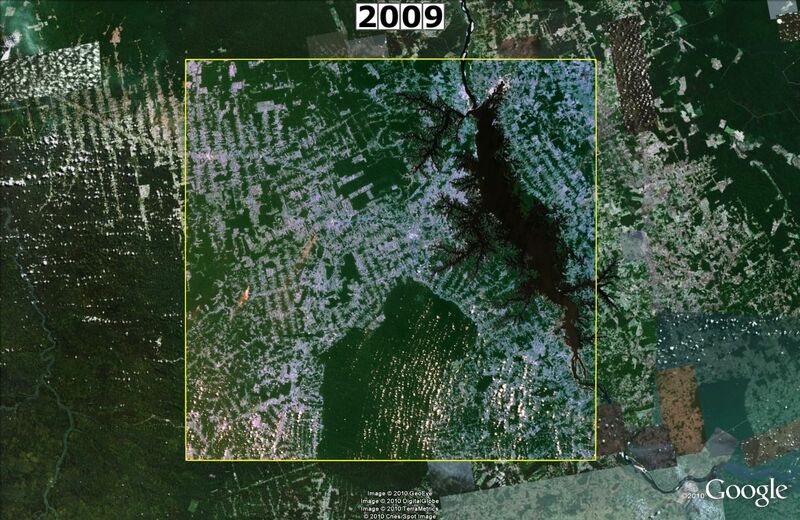 Disappearing Forests of the World.. 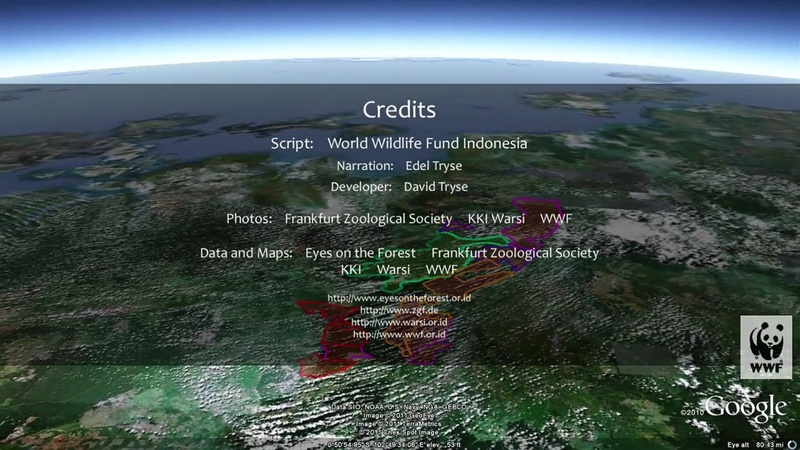 This KML shows deforestation data from a number of sources for different countries, including a live ticker for each country. 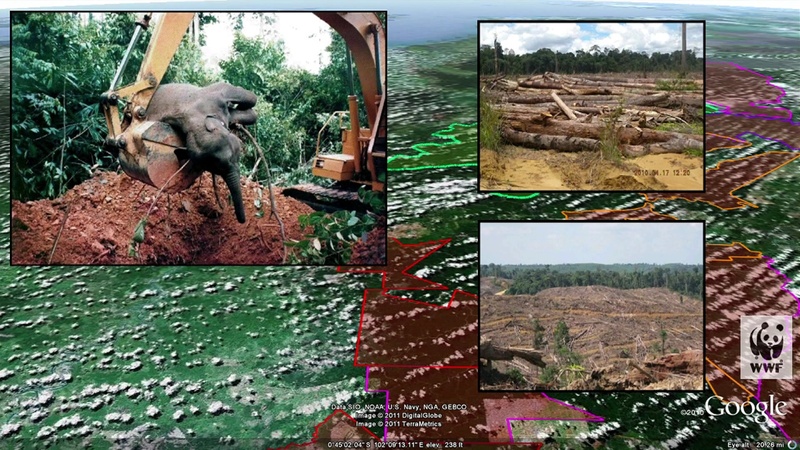 The world has lost close to half of its forests already today, and the continued high pace of deforestation contributes greatly to climate change and the loss of biodiversity. 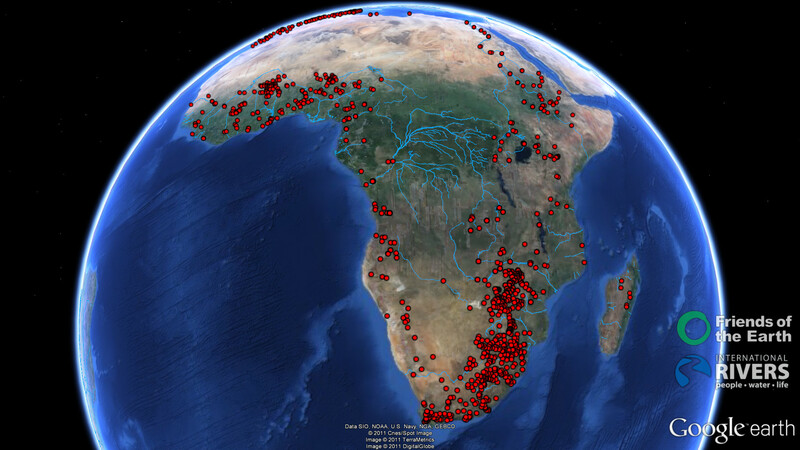 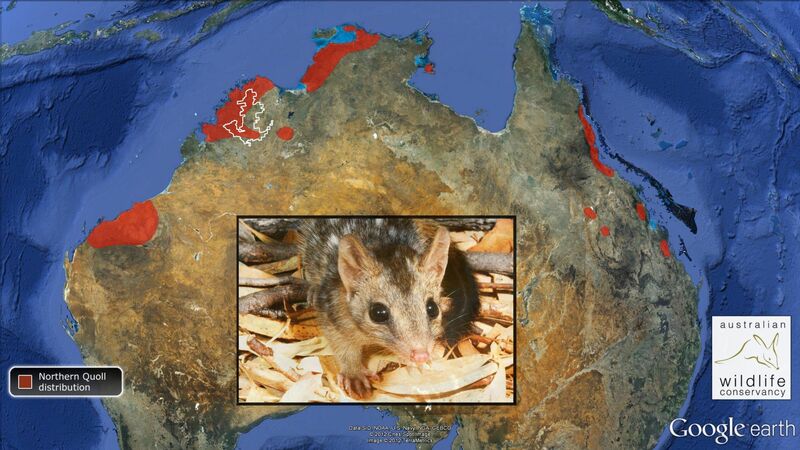 This KML shows 100 of the worlds most Evolutionarily Distinct and Globally Endangered (EDGE) mammal species. 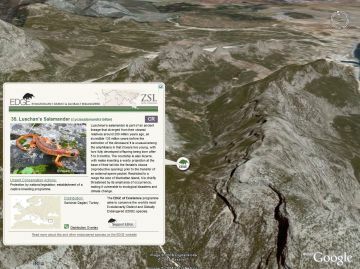 It was created for the Zoological Society of London's EDGE of Existence programme. 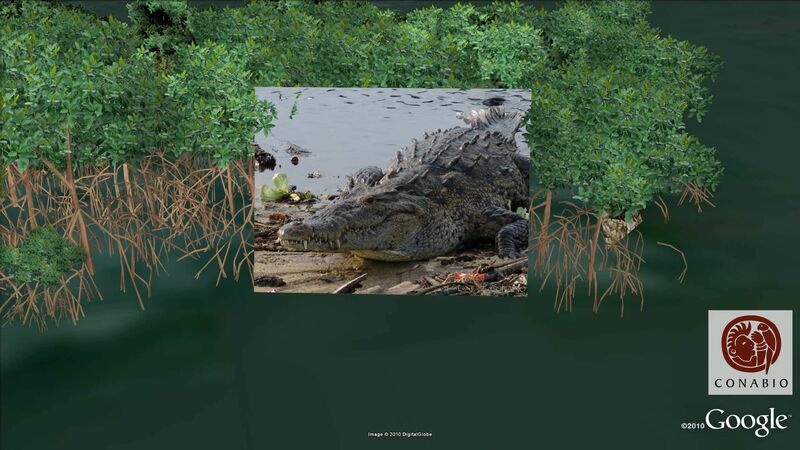 Open the KML file to learn more about the Yangtze River dolphin, Cuban solenodon, Aye-aye and other endangered animals. 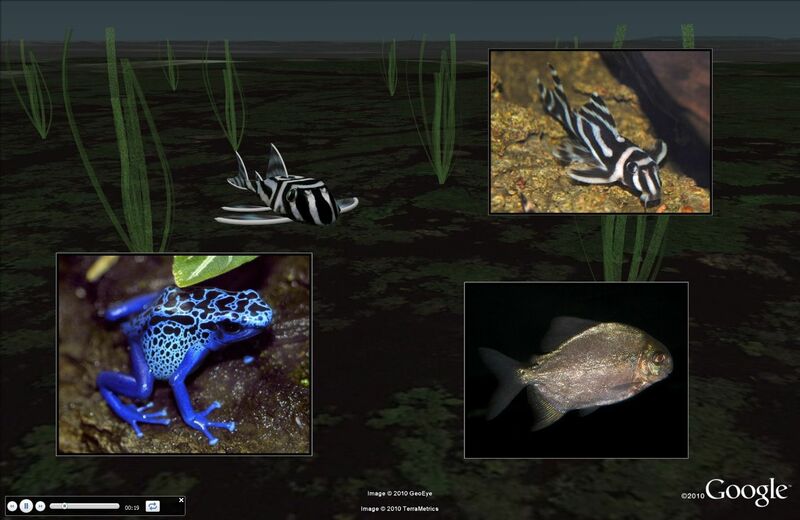 This KML shows 100 of the worlds most Evolutionarily Distinct and Globally Endangered (EDGE) amphibian species. 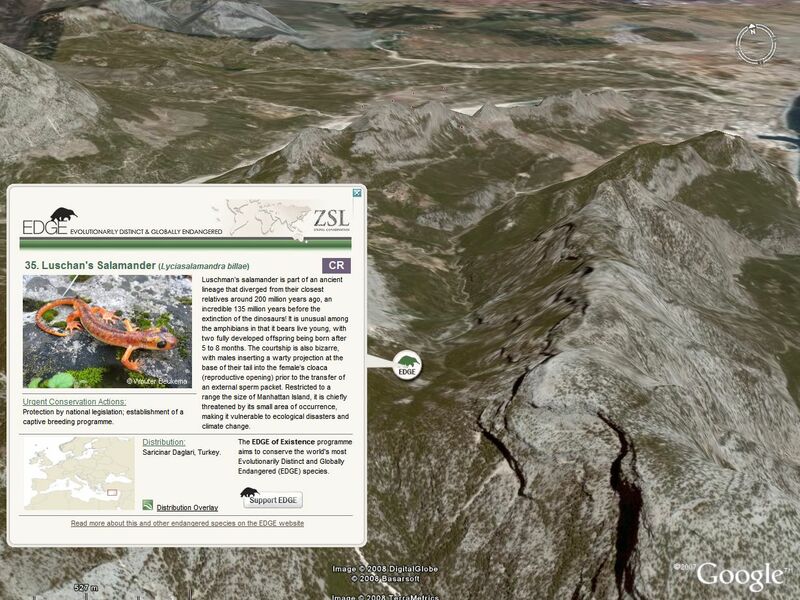 It was created for the Zoological Society of London's EDGE of Existence programme. 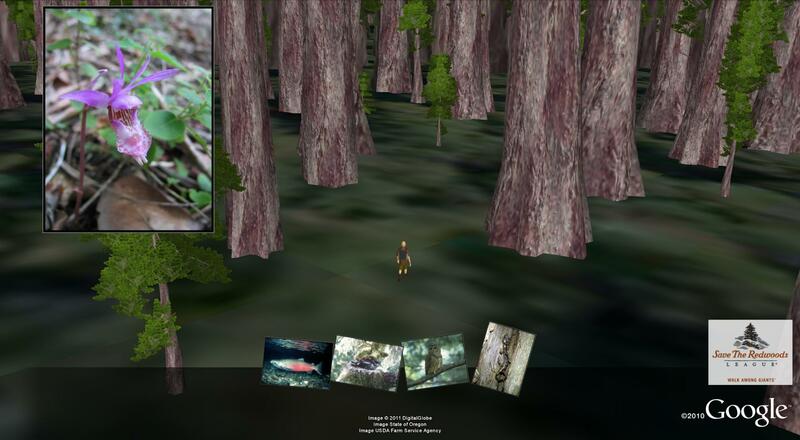 Open the KML file to learn more about the 1.8 meter Chinese Giant Salamander, the cave dwelling Olm and other endangered animals. This KML shows information from Survival International about 33 indigenous tribes on five continents. 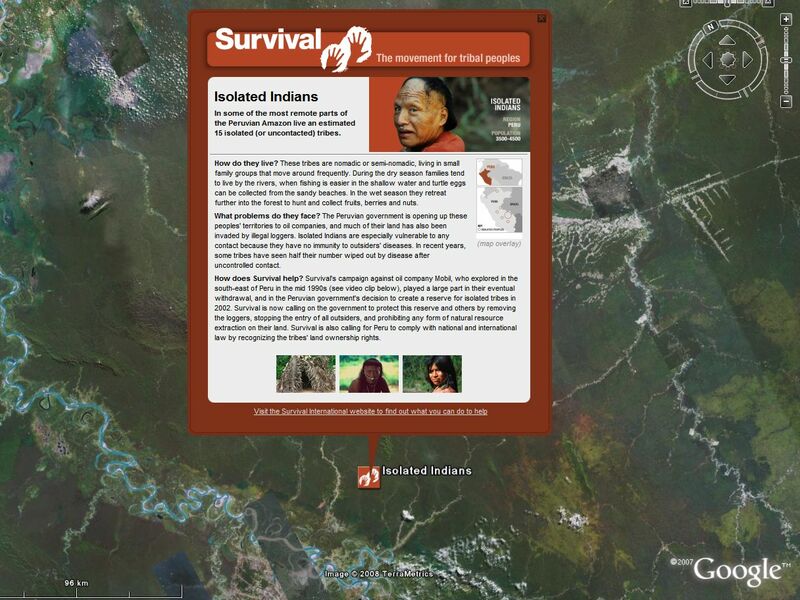 Survival is an organisation that works to support tribal peoples worldwide. 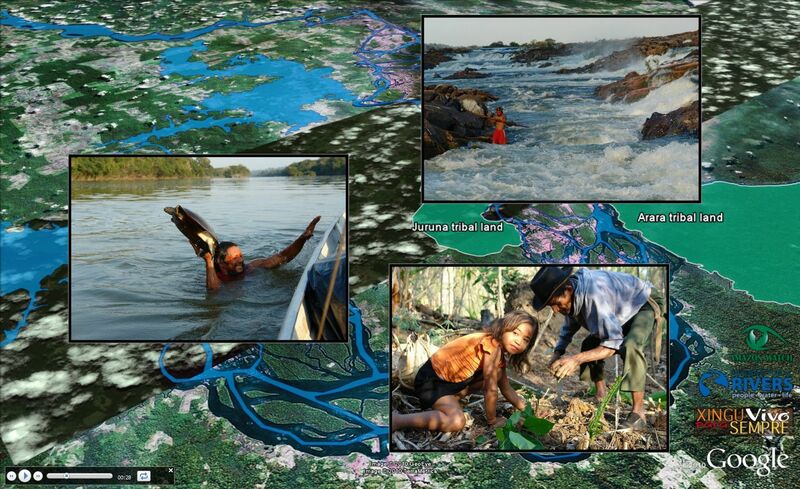 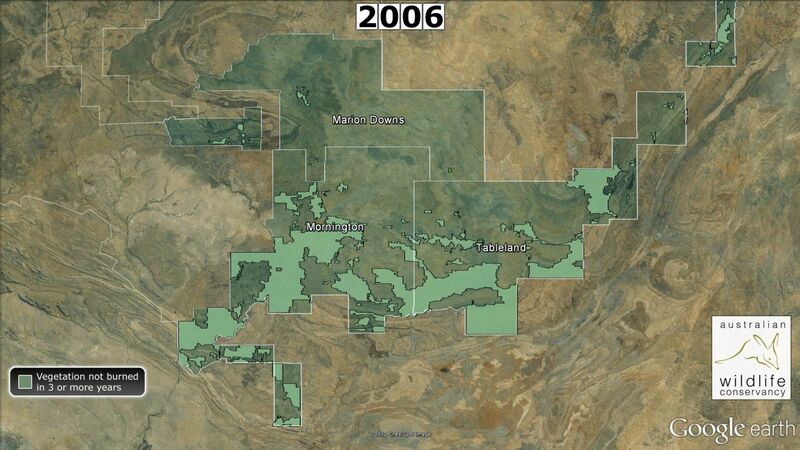 The tribes in the KML are under threat from ranchers, loggers and miners invading and stealing their land. 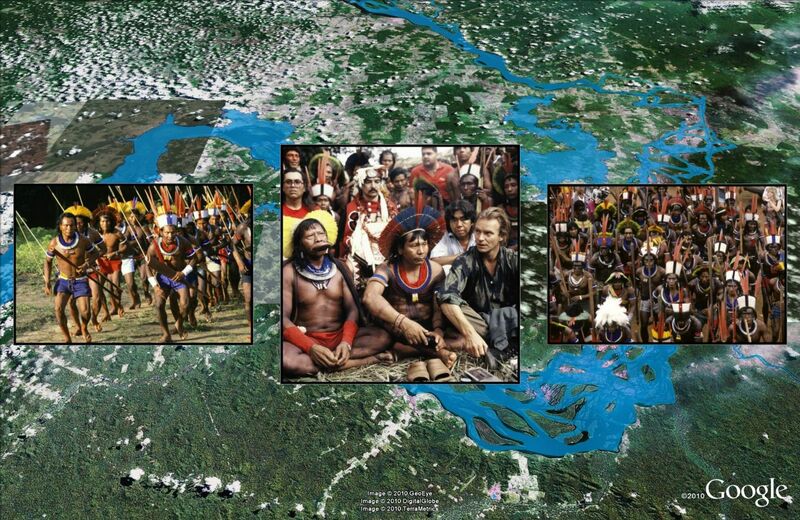 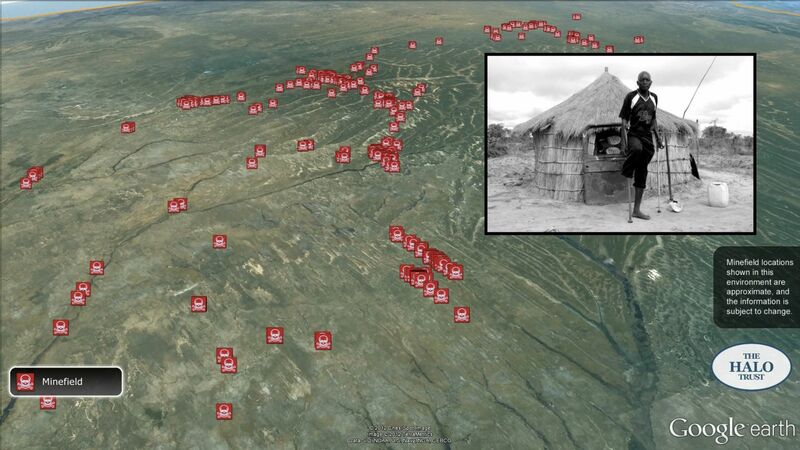 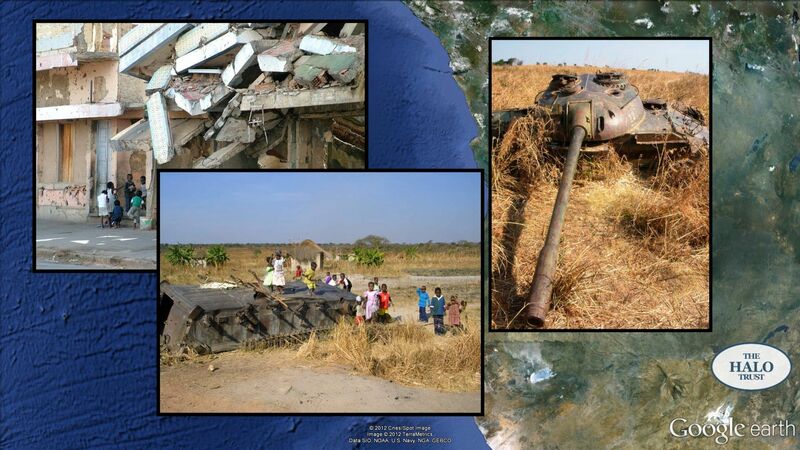 Many of the tribes have been decimated from previous massacres and forced relocations. 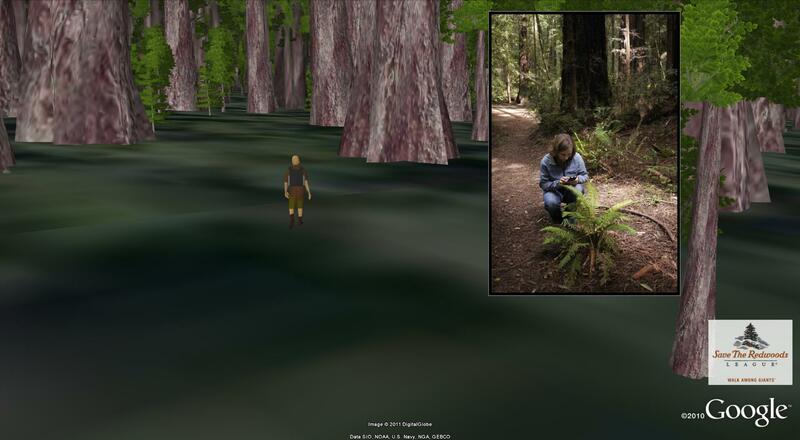 Some of them still reject all contact with outsiders. 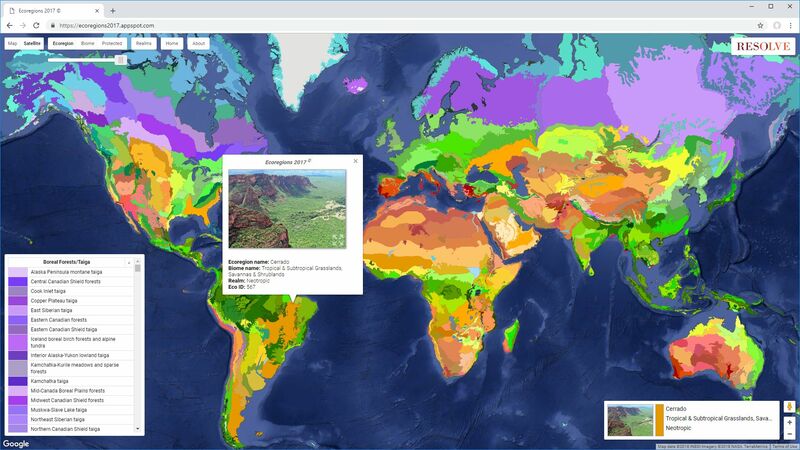 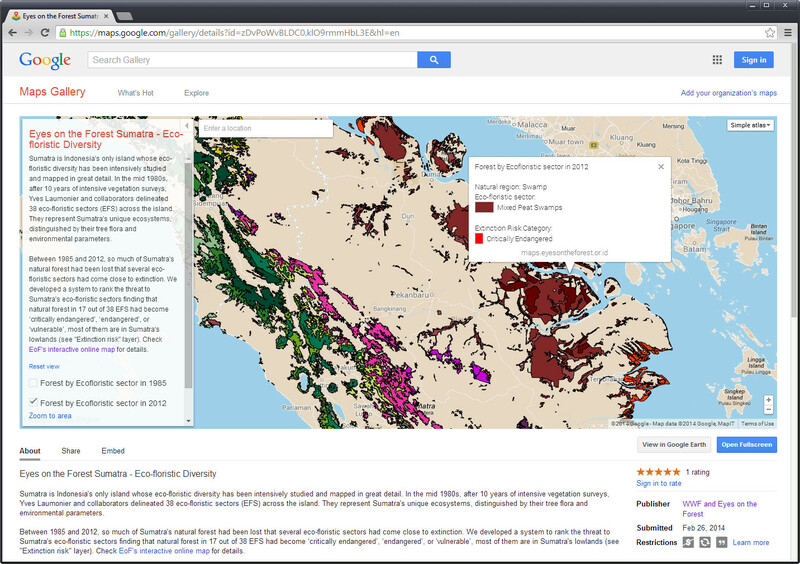 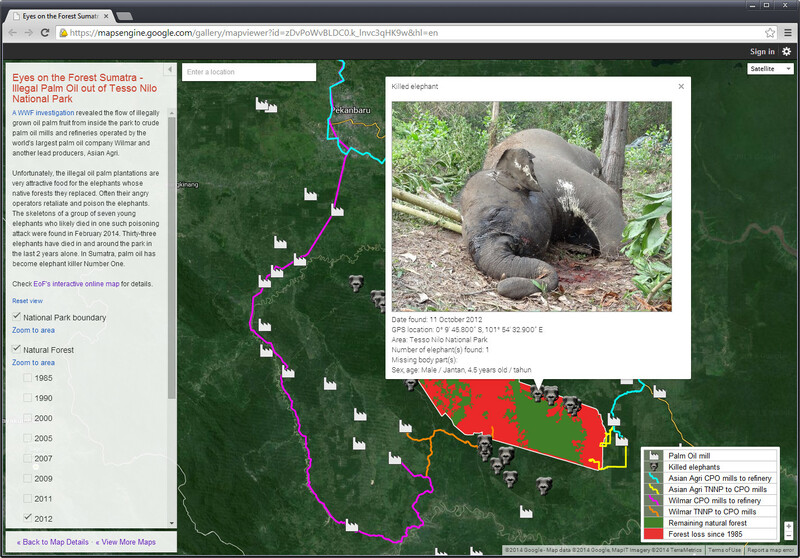 This KML shows information about the earths 34 Biodiversity Hotspots, as defined by Conservation International. 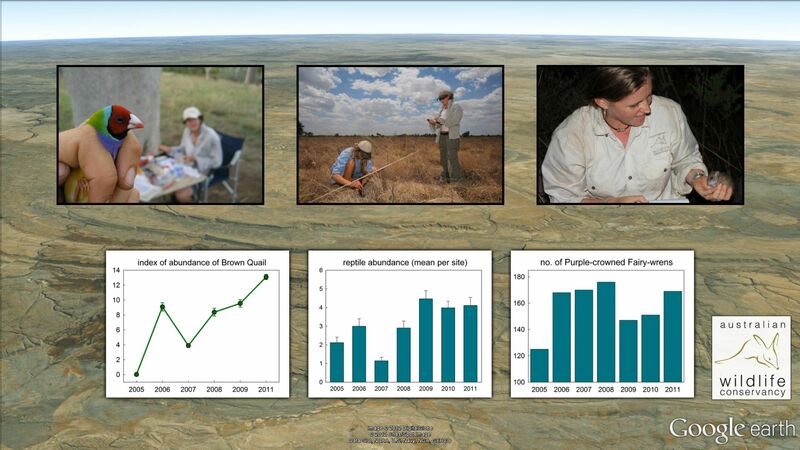 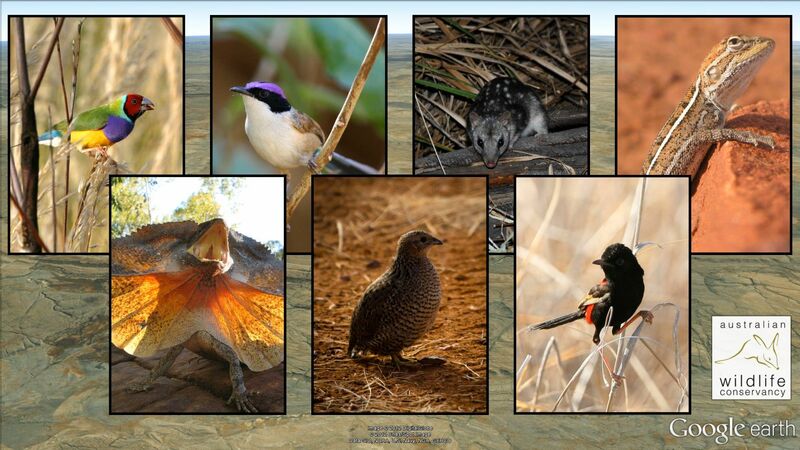 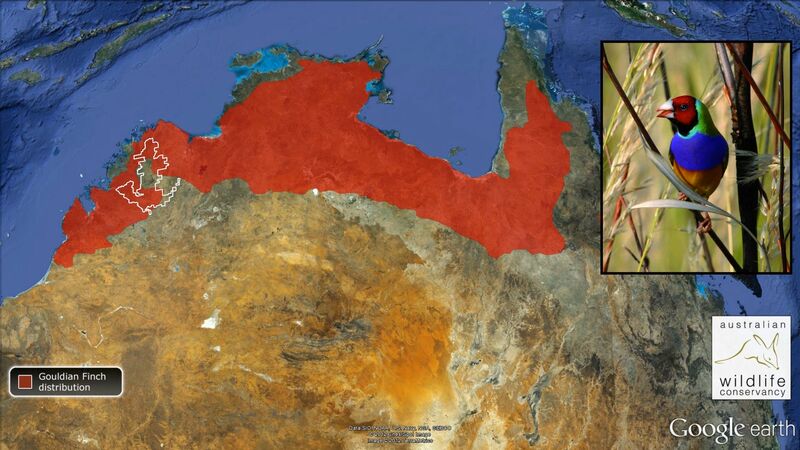 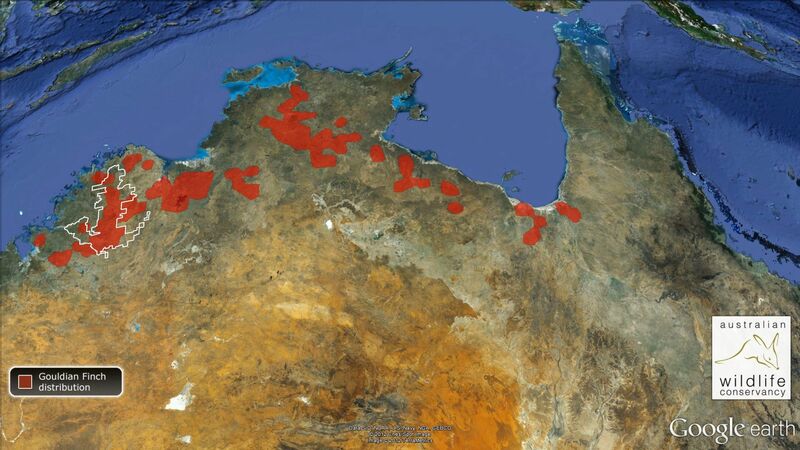 These are the most important areas for conservation, with very large numbers of endemic species. 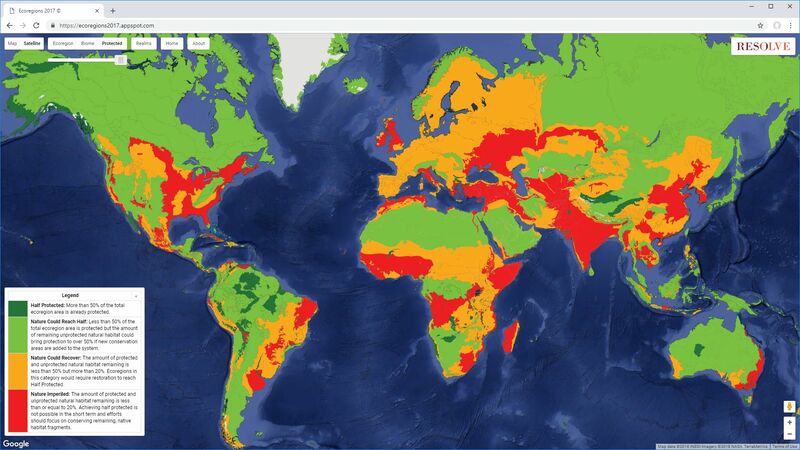 Each of the hotspots has lost more than 70% of its original forest (some more than 95%) and the remaining habitat for all of the hotspots combined covers only 2% of the planet's surface. 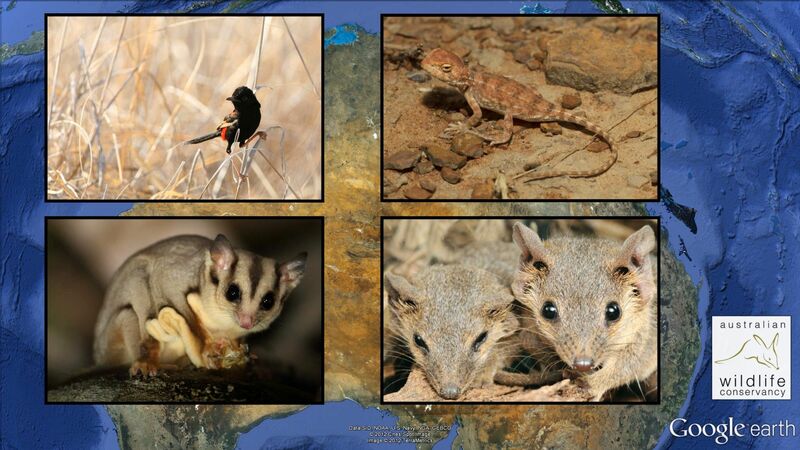 Yet over 50% of the worlds's plant species and 42% of the land animals exist nowhere else. 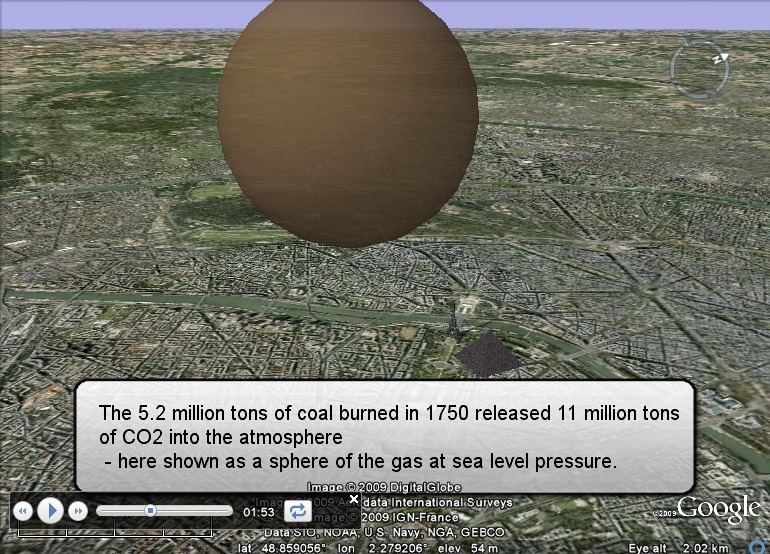 Download this network link KML to load all the above files in Google Earth. 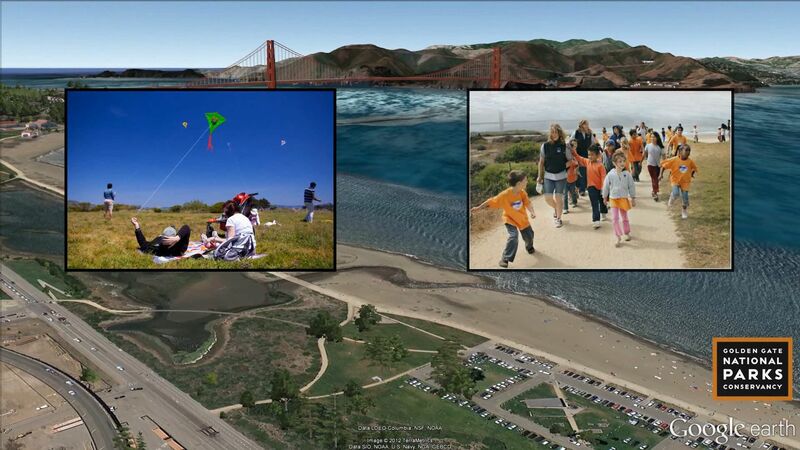 A small program for adding screen overlay images to Google Earth. 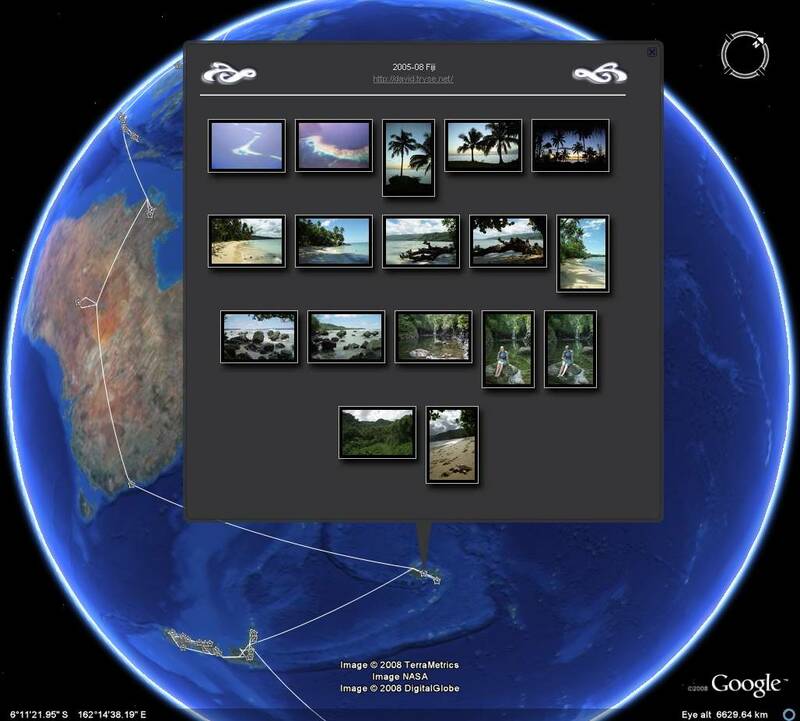 This is handy for adding legends and other images to Google Earth KML files, images that stay on a fixed spot on the screen as long as the KML is loaded. 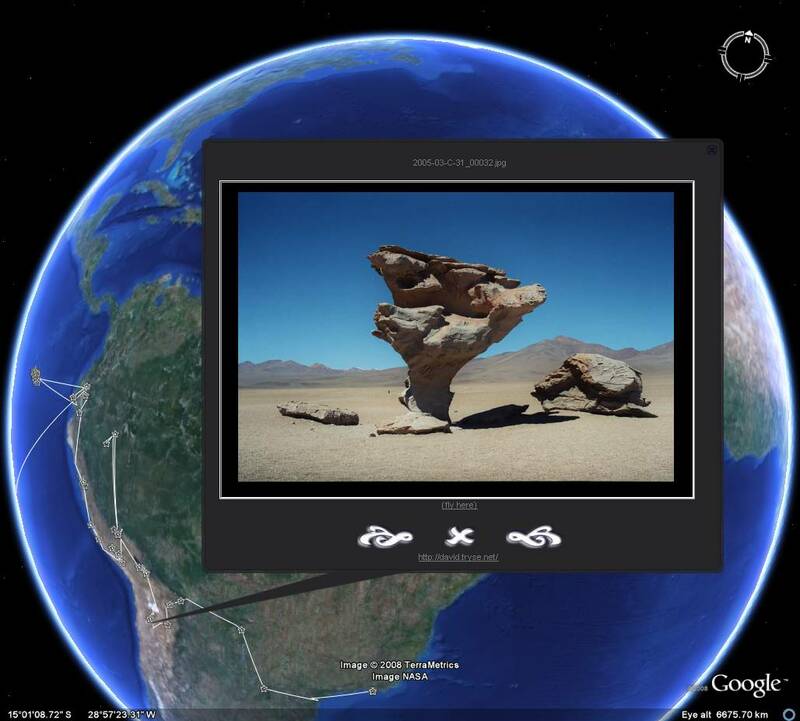 Once you click the "Show in Google Earth" button in the tool any new changes you make will automatically update the overlay in Google Earth, making it easy to preview changes. 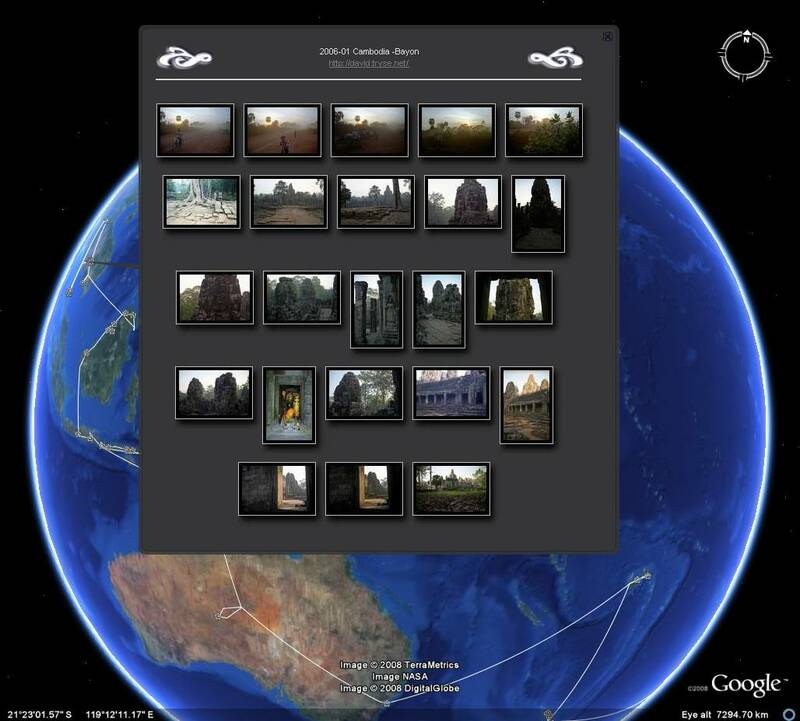 The pre-set positions in the tool are tuned to avoid adding images on top of the built-in Google Earth controls (time slider, tour control, navigation/compass). 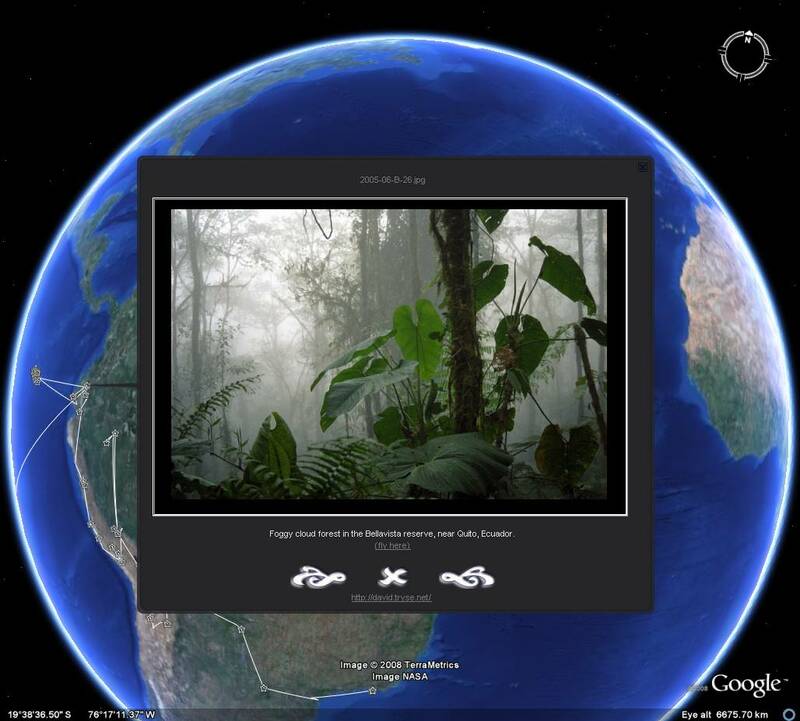 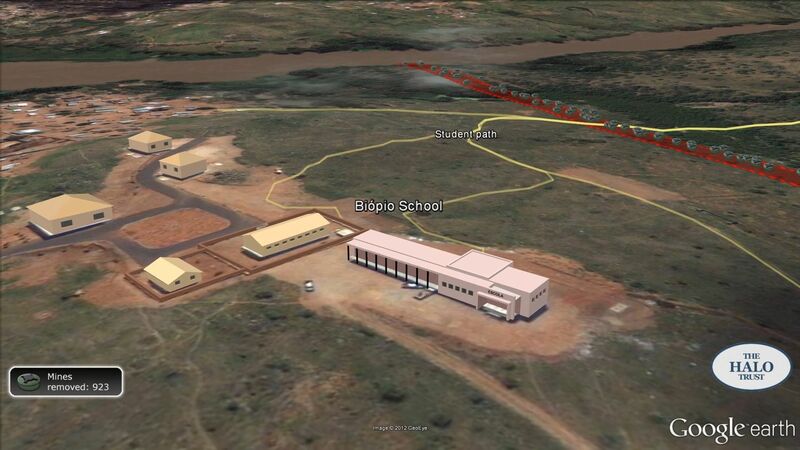 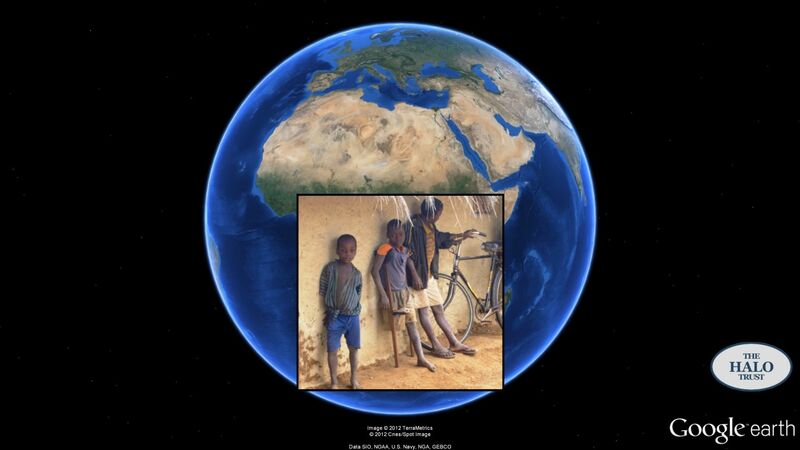 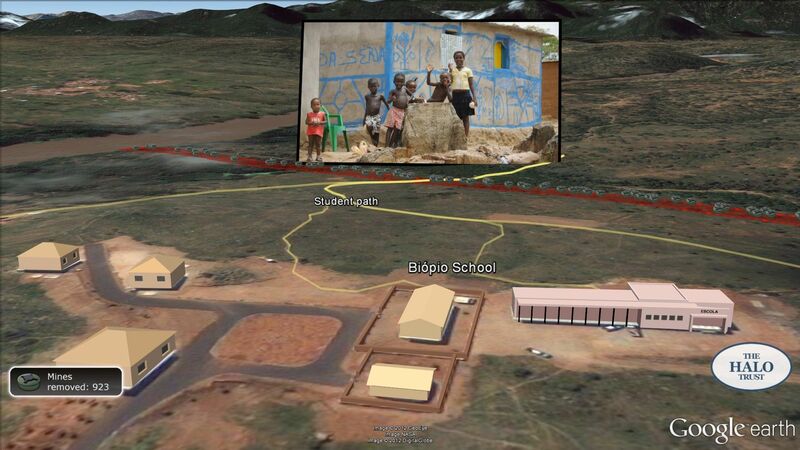 A small program for creating high-resolution image overlays for Google Earth. 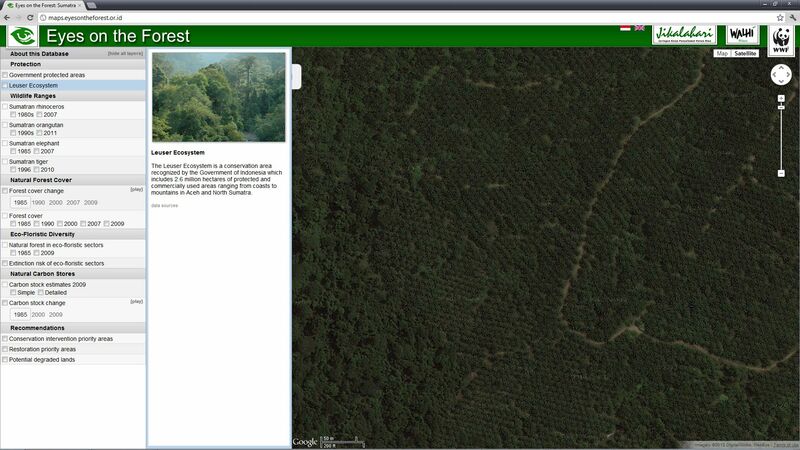 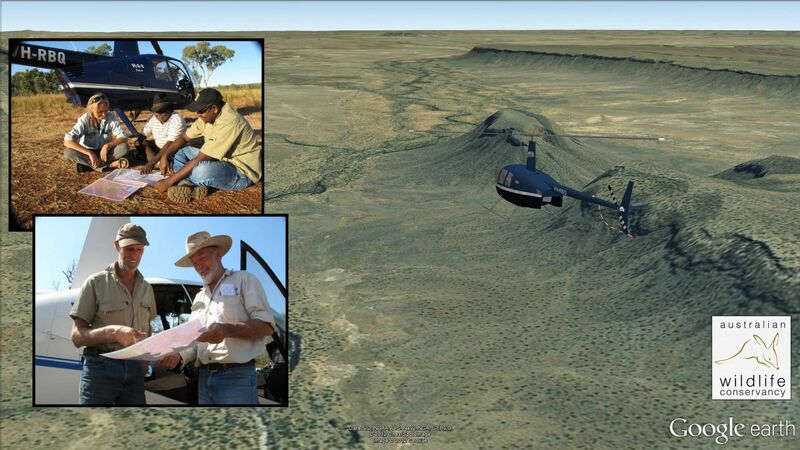 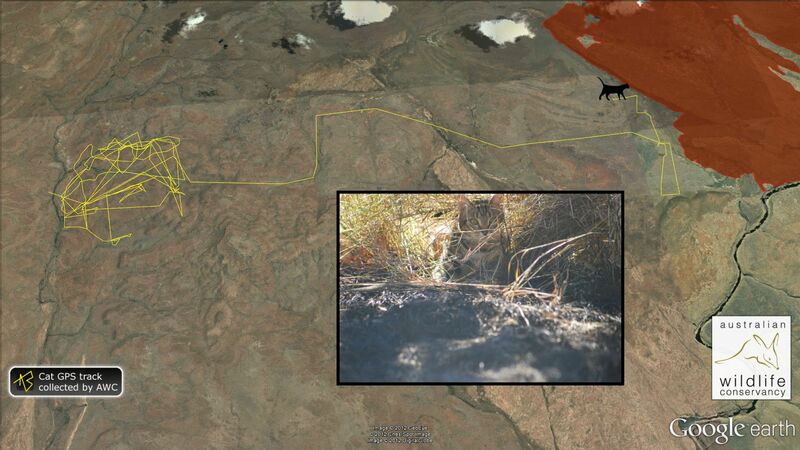 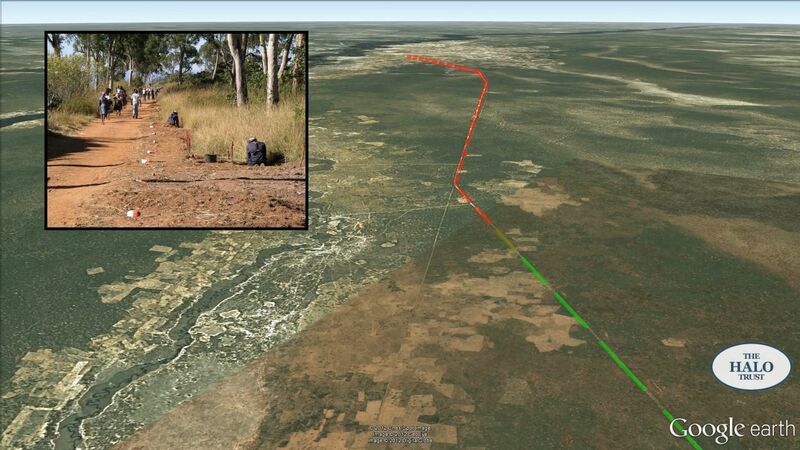 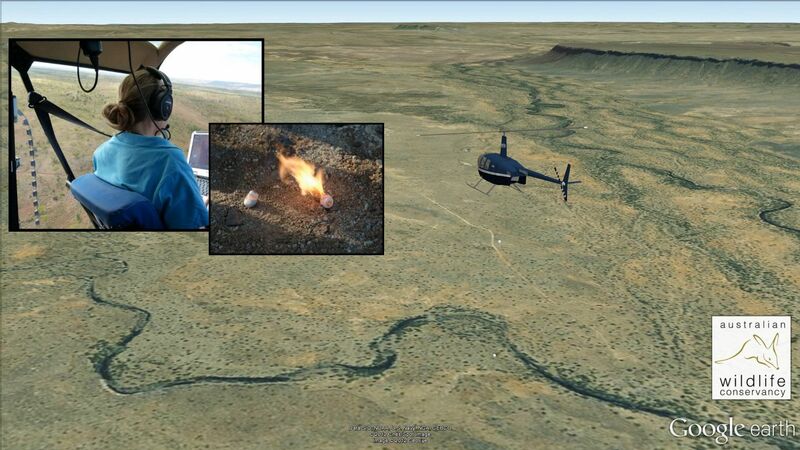 Input is a large image file and coordinates for where it should be located on the ground. 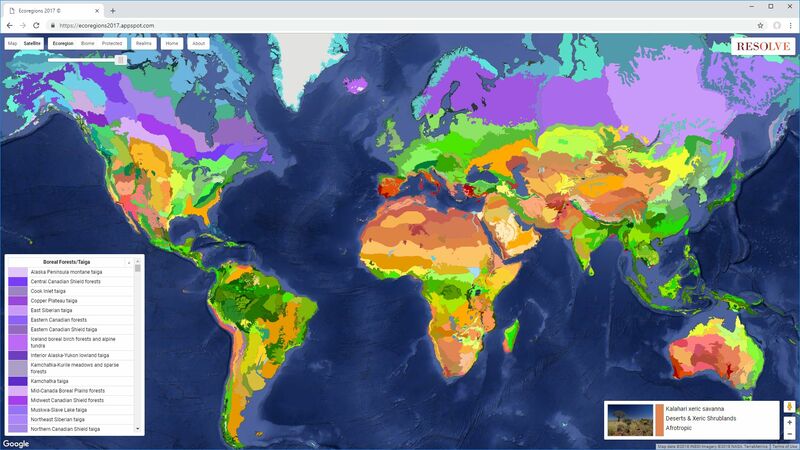 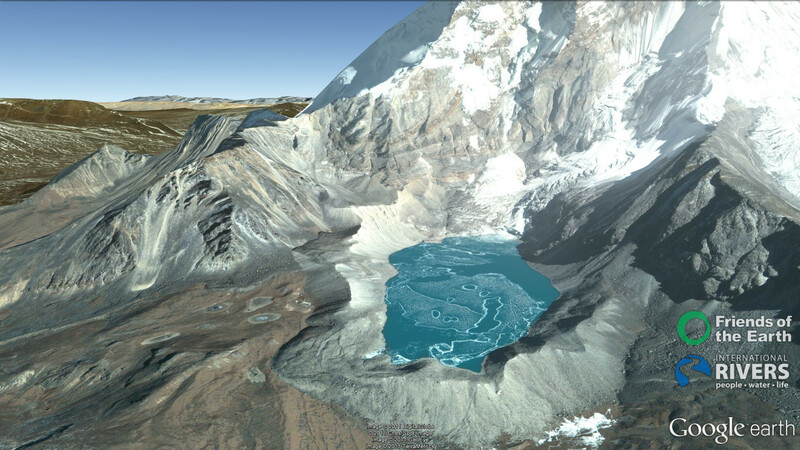 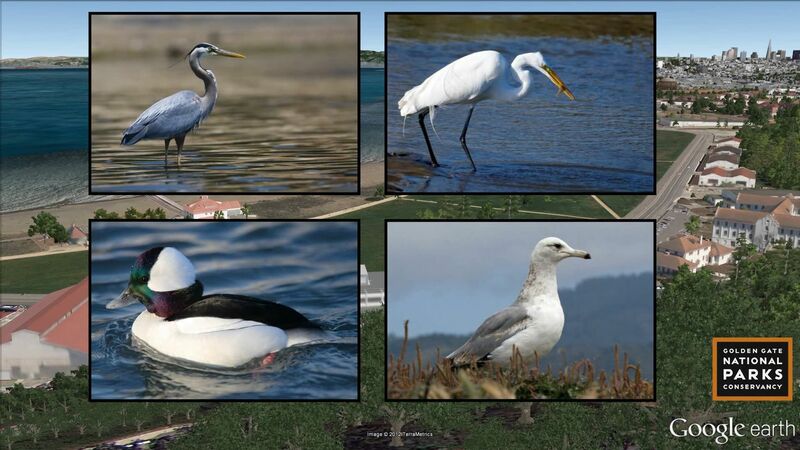 Output is a hierarchy of small image tiles of increasing resolution, and a KML file to load only the images required based on the current Google Earth viewpoint. 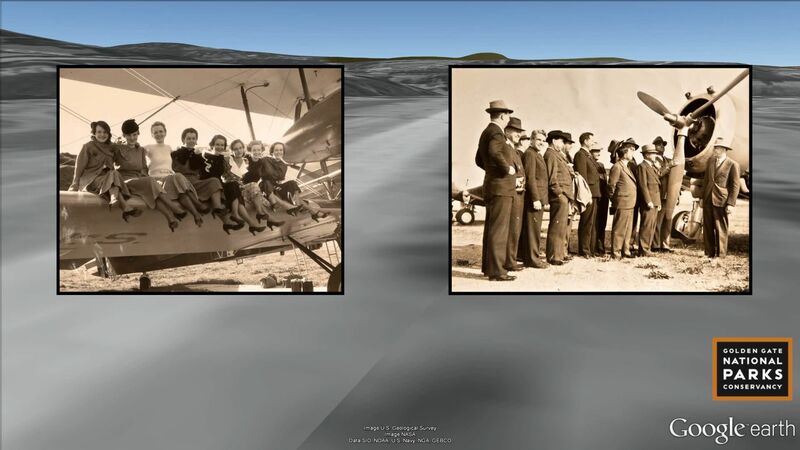 This results in higher performance and lower bandwidth usage since only a small part of the ground overlay image has to be downloaded and displayed at any time. 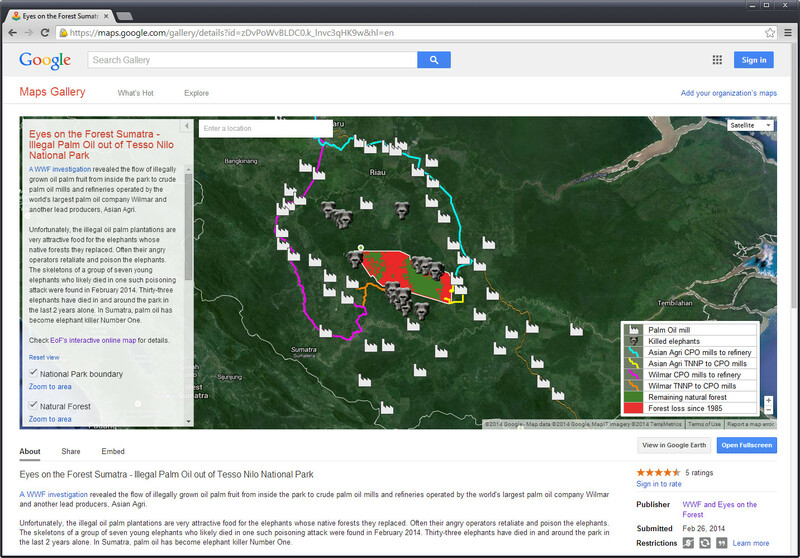 A small tool for reading/modifying the current position in Google Earth and copy to the clipboard. 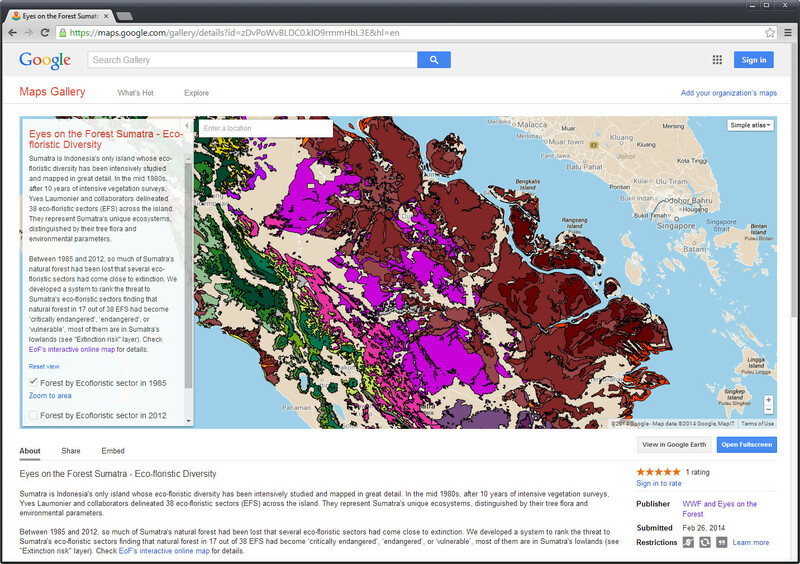 Useful for editing KML files, and for pasting coordinates into spreadsheets like the Google Spreadsheet Mapper. 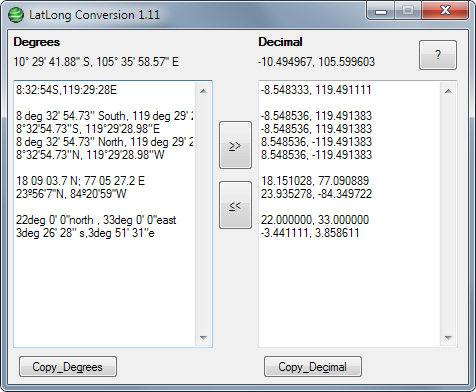 A small tool for converting between different format coordinates. 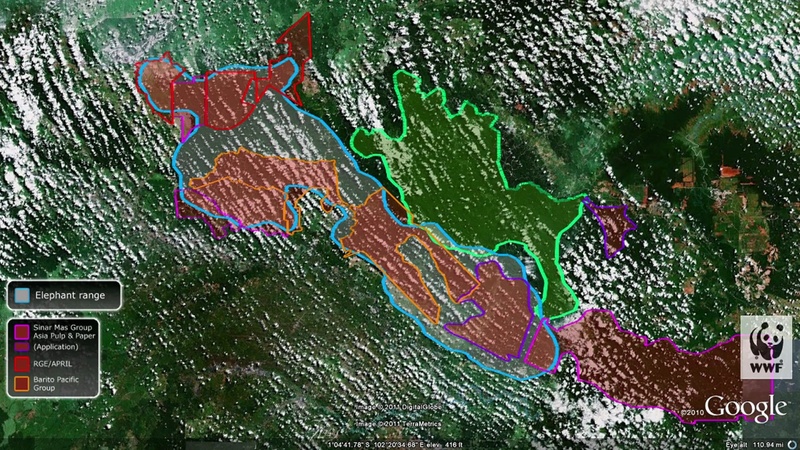 Might be useful for editing KML files. 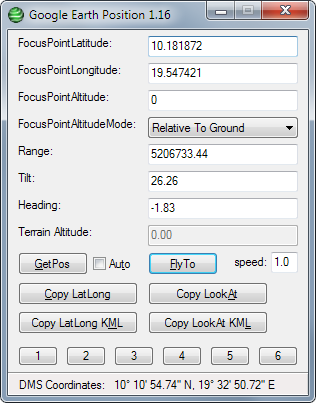 A small program for adding Exif GPS data to JPEG files and reading coordinates from the Google Earth client. 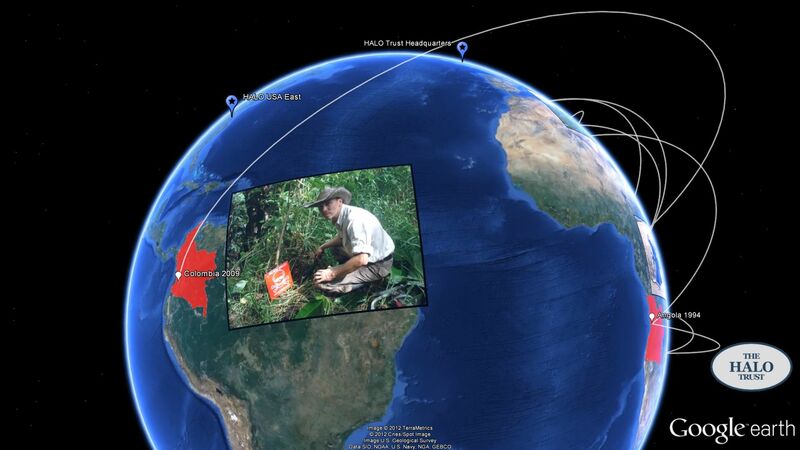 With the Auto-Mode enabled any new file drag-and-dropped onto the PhotoTag window will automatically be tagged with the current coordinates from the Google Earth client. 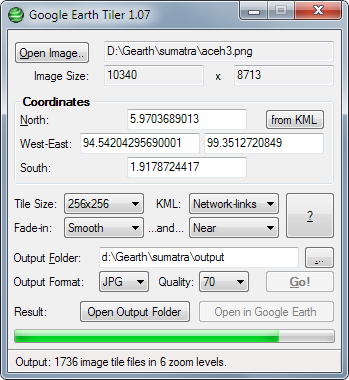 Options to read/write Exif GPS data can be added to the windows right-click menu for JPEG files from the PhotoTag About: dialog. 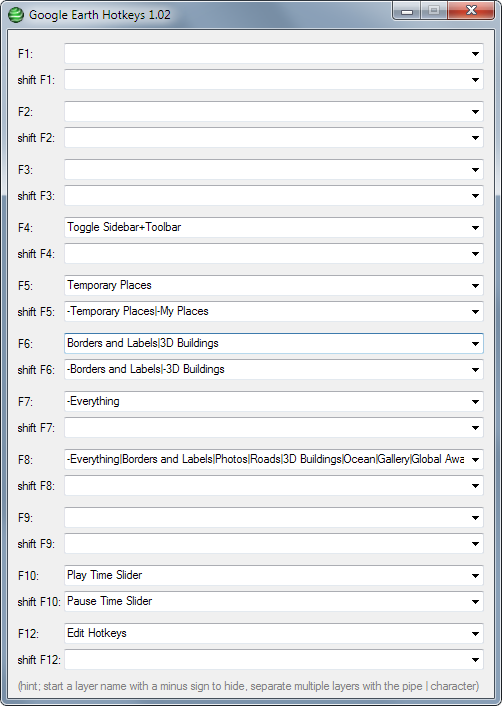 A small program for configuring hotkeys to show and hide different layers within the Google Earth application (plus a few other features). 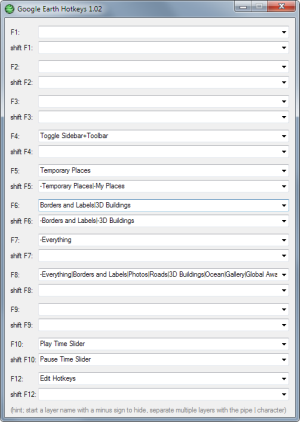 For example, use F6 to show Borders, Roads and 3D Buildings, F8 to show all your favourite layers, and F7 to hide all layers. 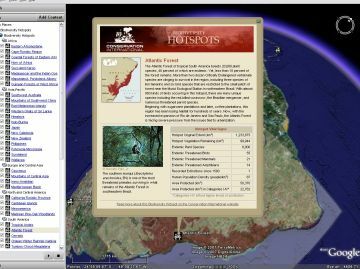 The program adds an icon to the Windows systray, click the icon (or press F12 inside Google Earth) to configure the hotkeys. 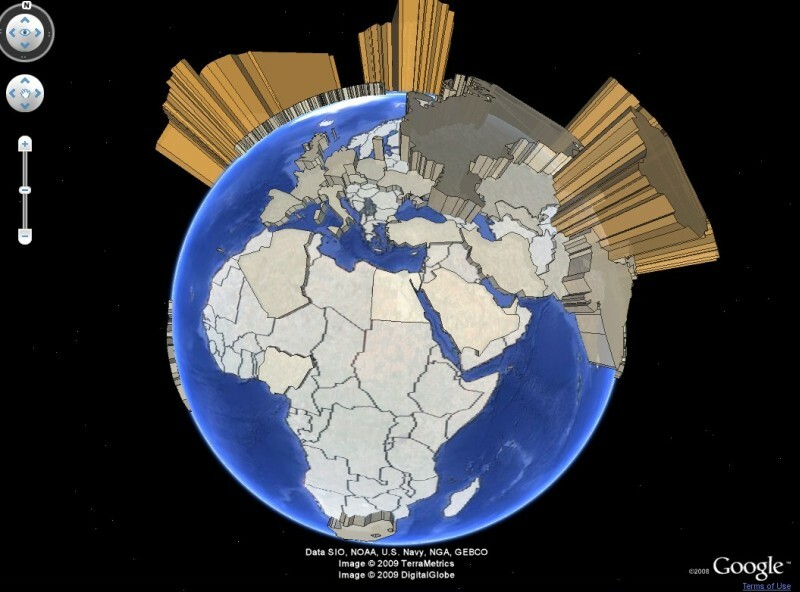 It also adds a global hotkey (which works no matter which application is active) to launch Google Earth; press the Win key + Shift + G.
Two small XSL files for extracting Lat, Long, and LookAt parameters from placemarks in a KML file. 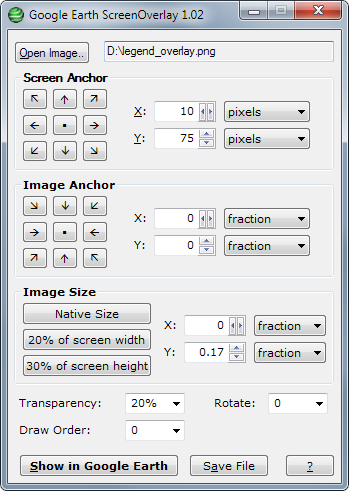 Handy for re-importing values into a spreadsheet after editing in Google Earth. 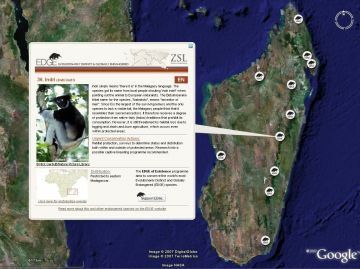 To use edit the <kml> tag and add a <?xml-stylesheet> tag to your KML file, then view it in a browser (see instructions inside the XSL file). 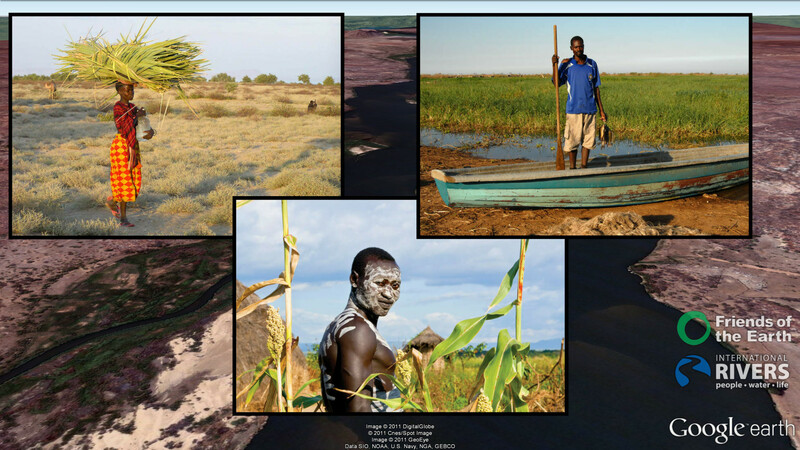 Travel photos from 12 months spent on the road; Brazil, Argentina, Bolivia, Peru, Ecuador, New Zealand, Fiji, Australia, Indonesia, Malaysian Borneo, Brunei, Cambodia, Laos, Thailand. 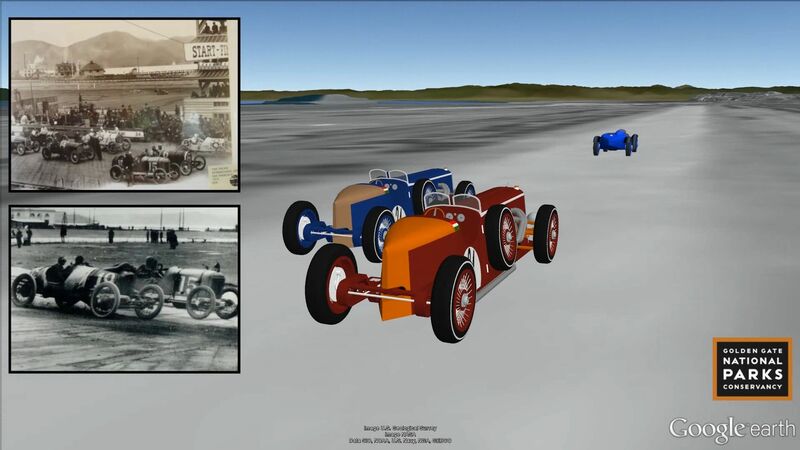 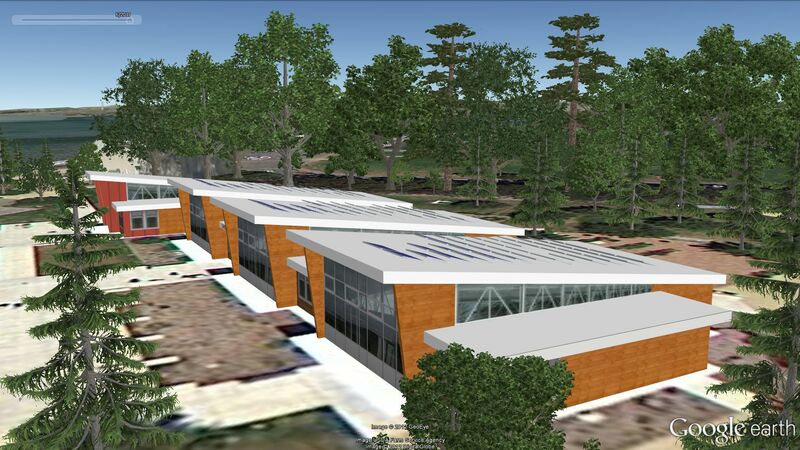 My experiments with Google's SketchUp 3D modelling program. 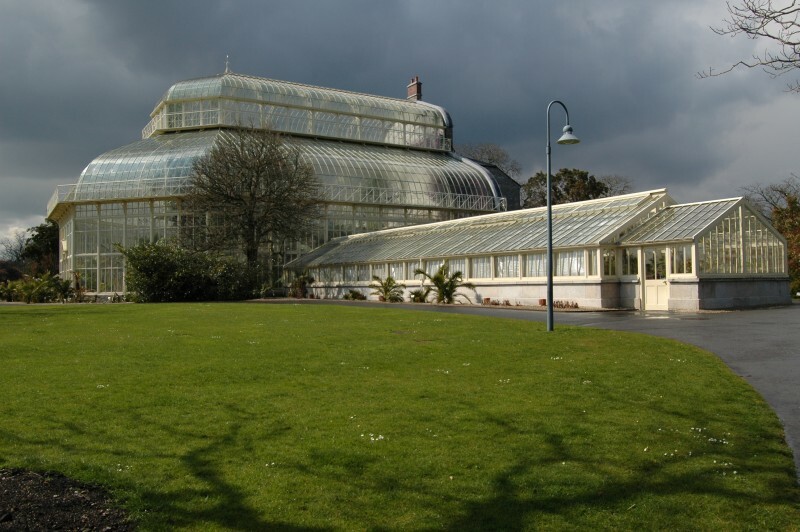 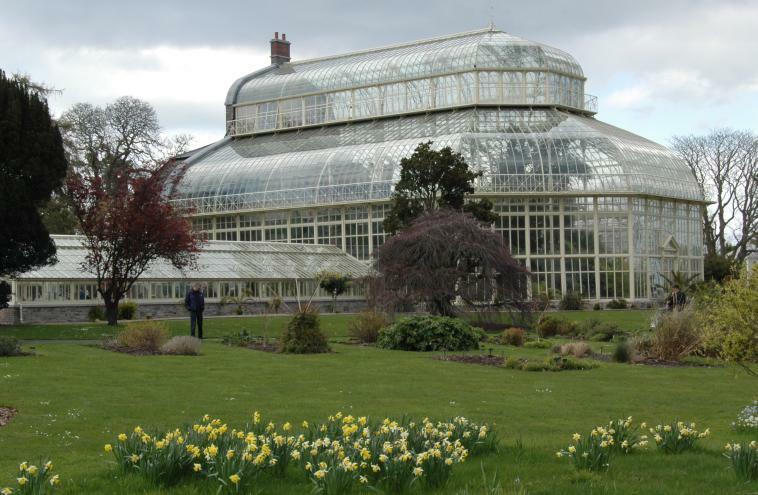 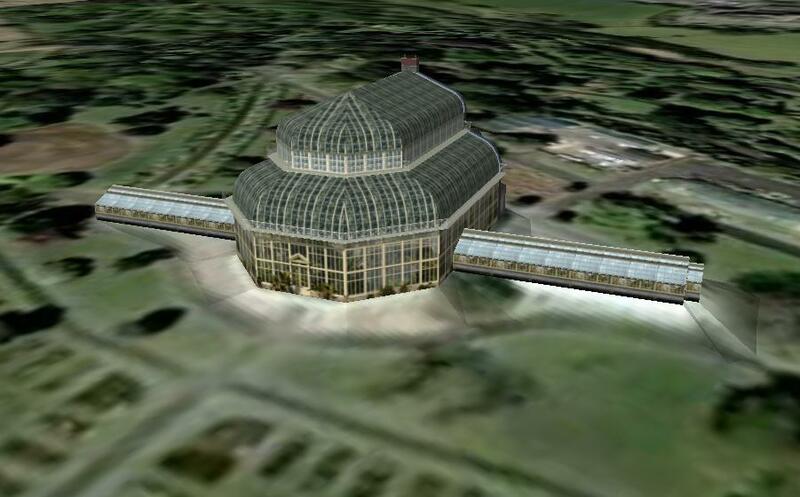 The first model is the Irish National Botanic Gardens Palm House.